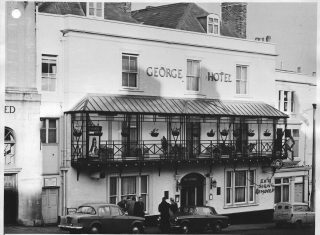 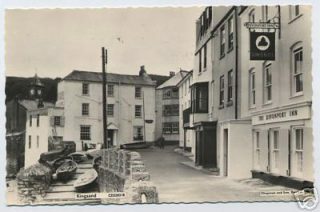 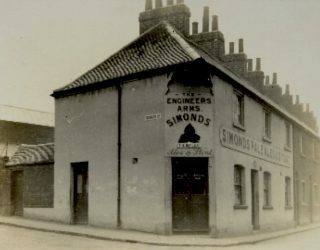 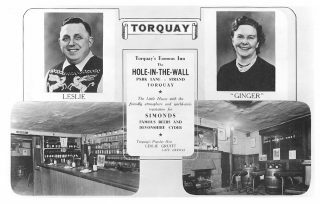 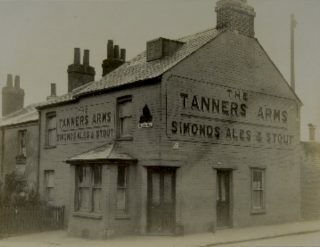 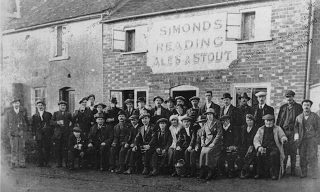 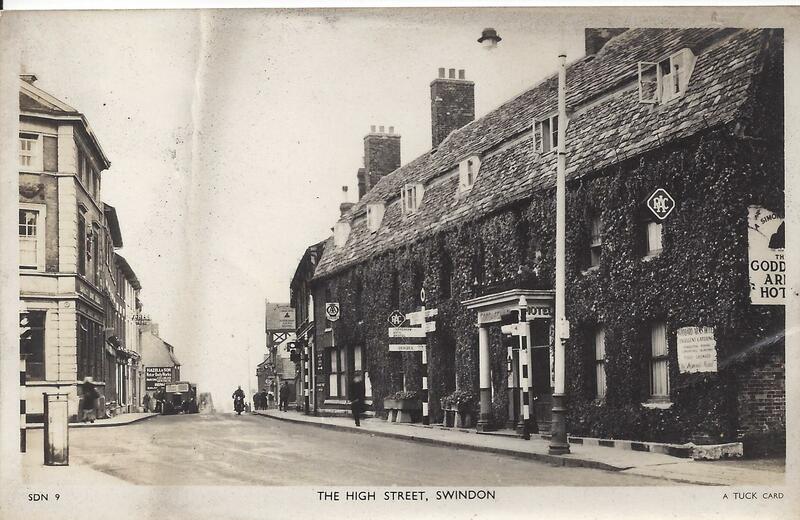 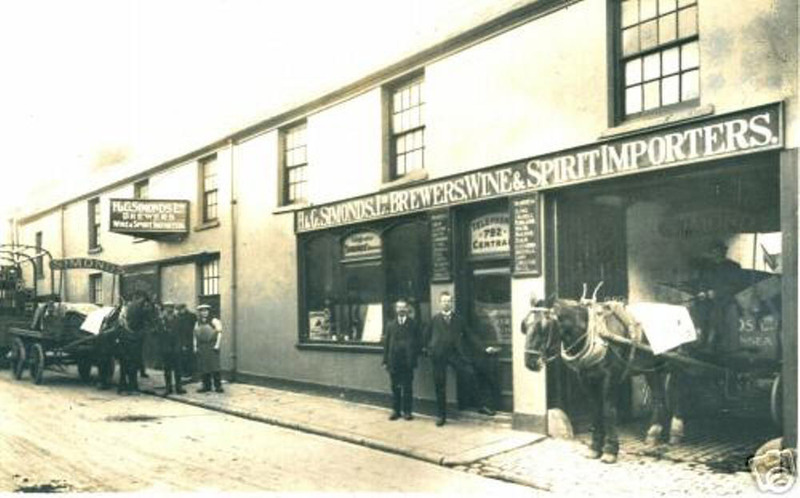 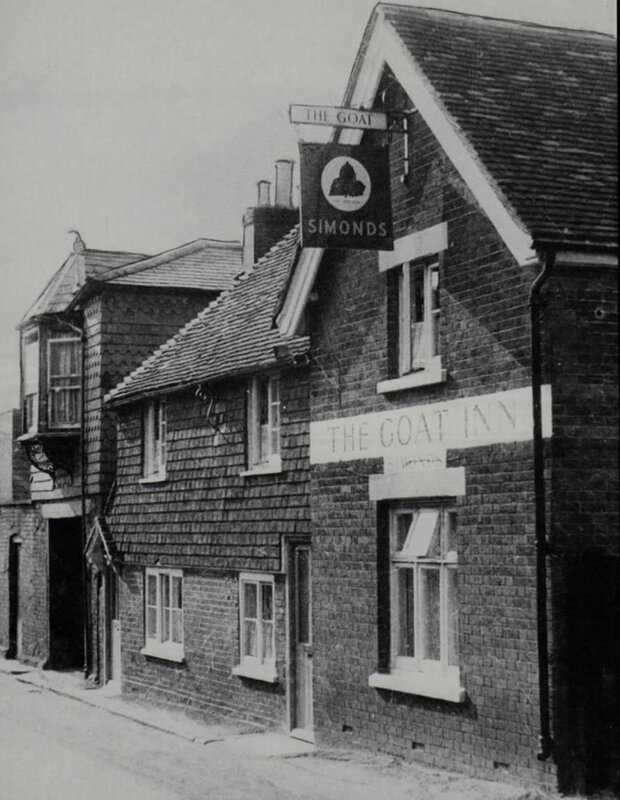 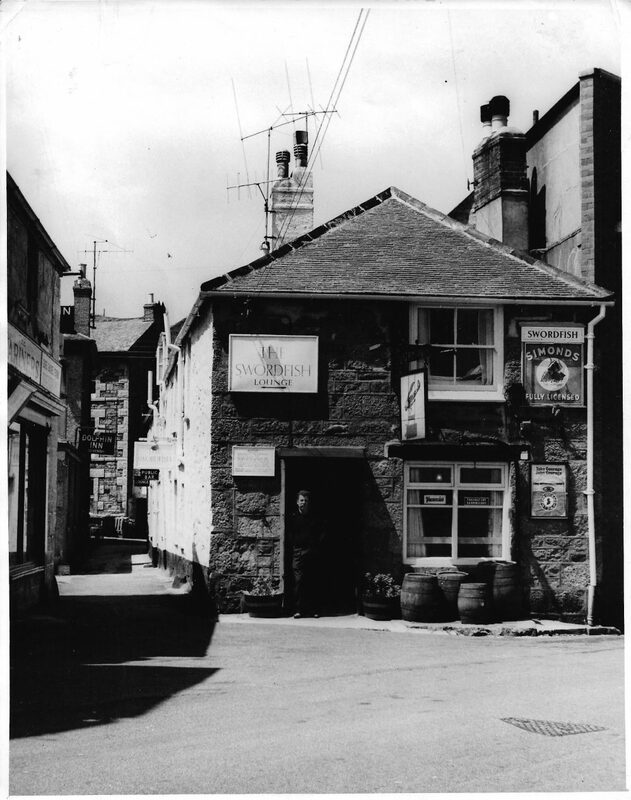 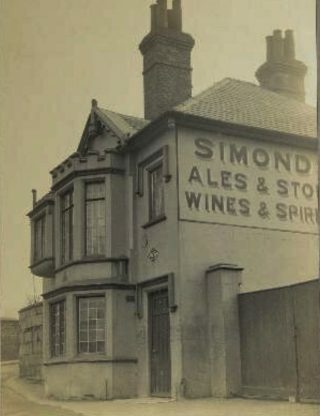 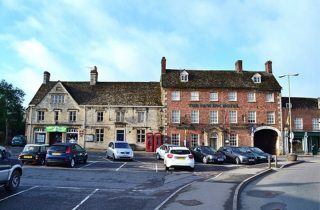 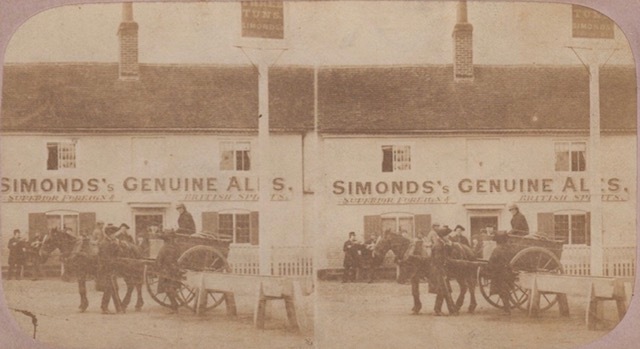 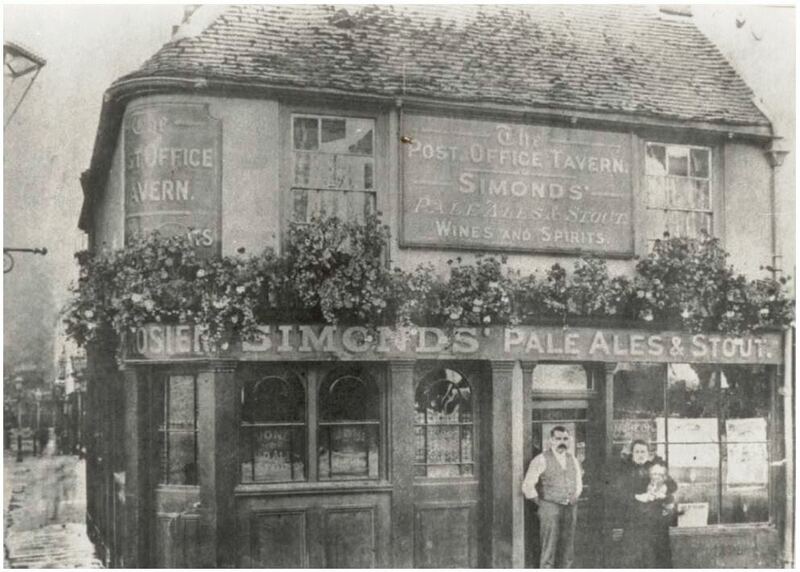 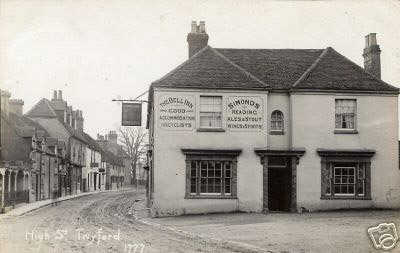 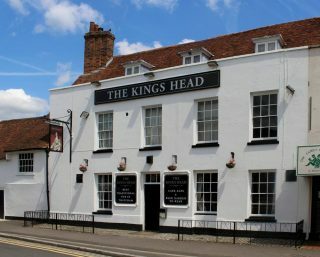 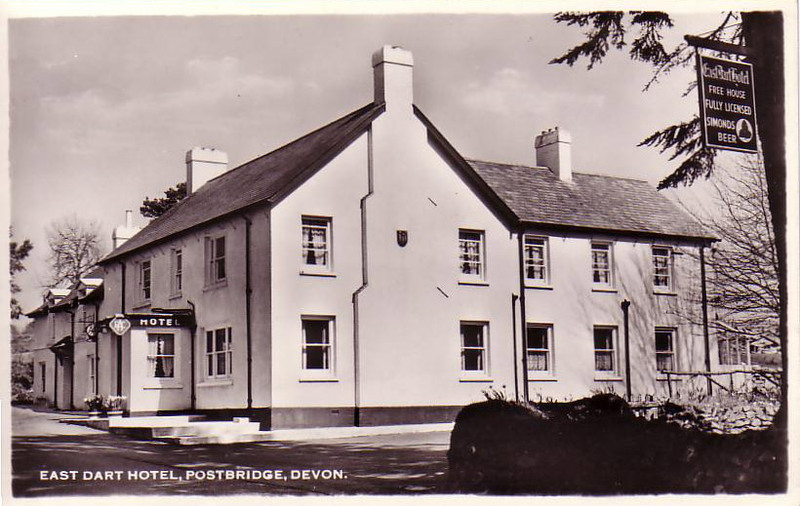 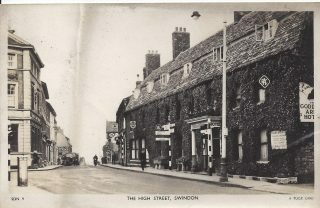 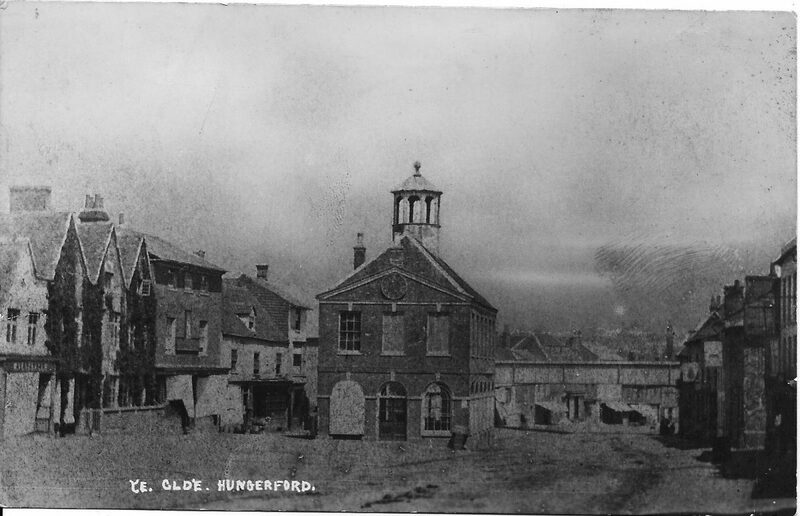 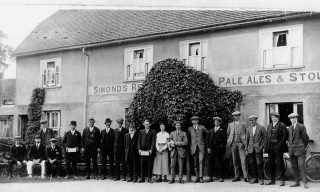 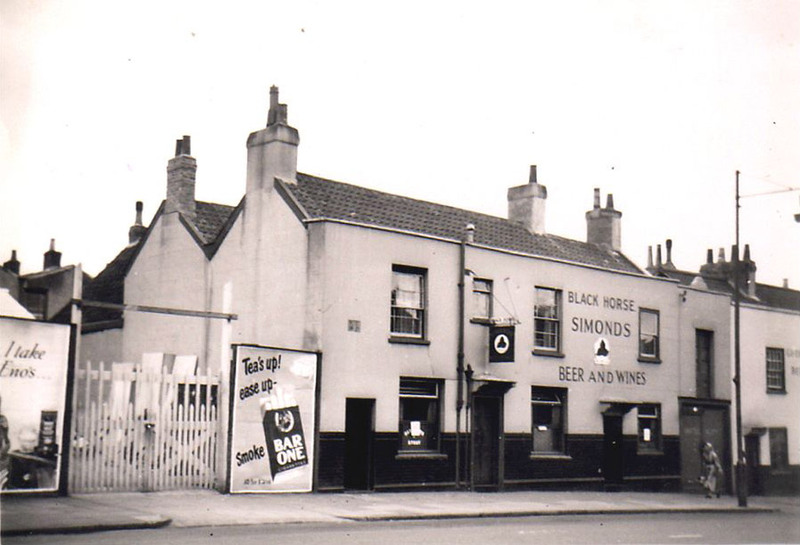 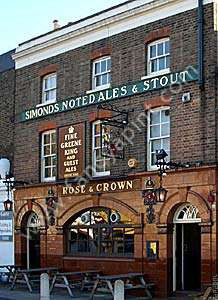 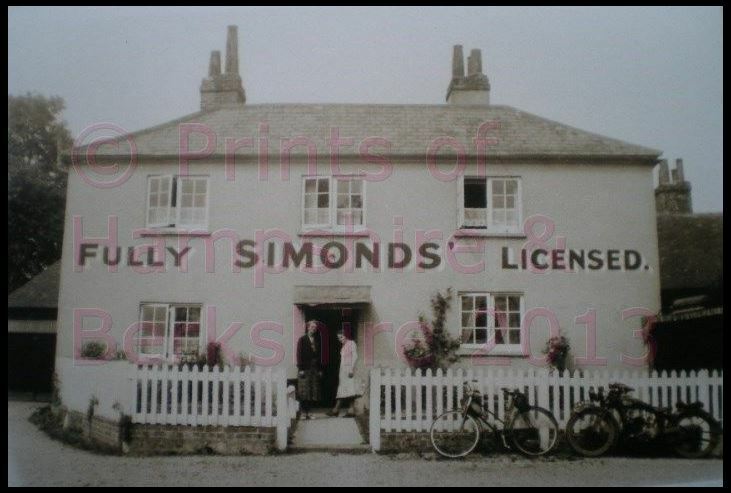 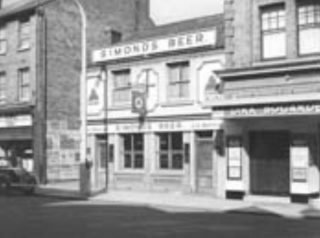 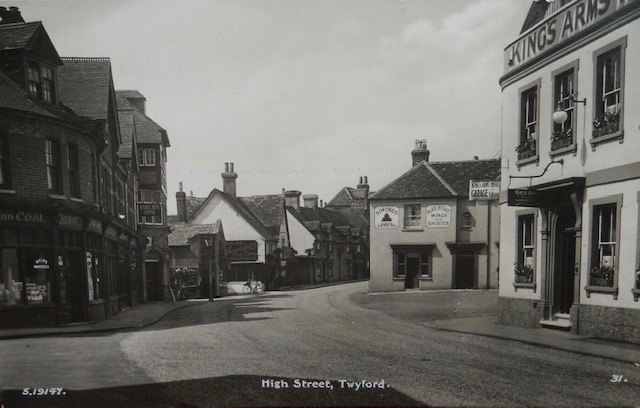 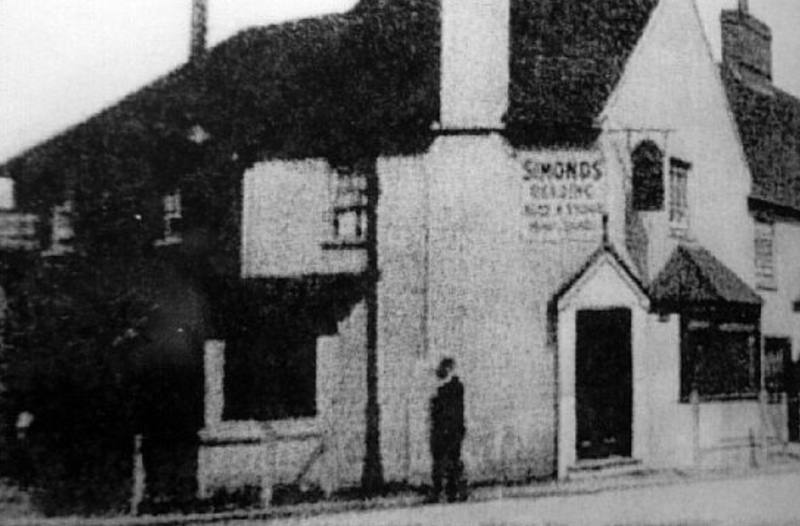 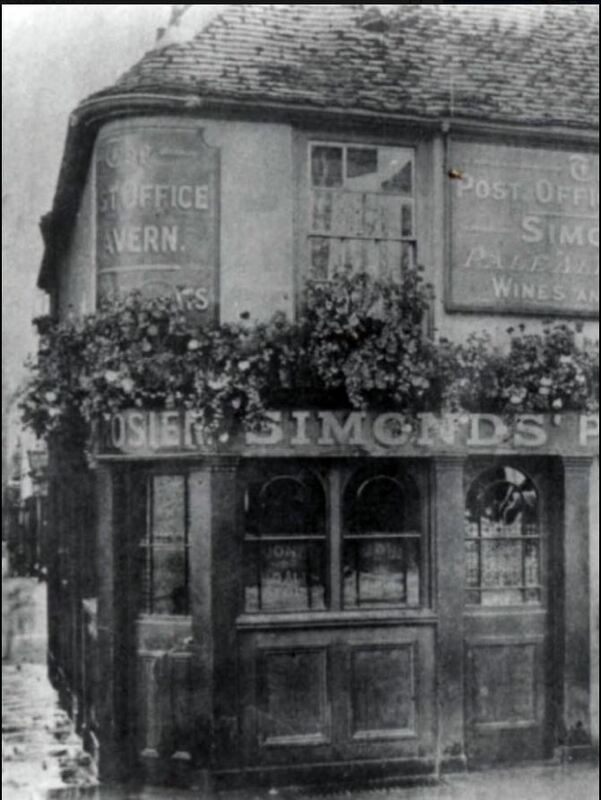 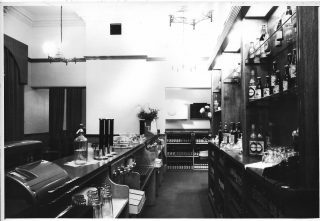 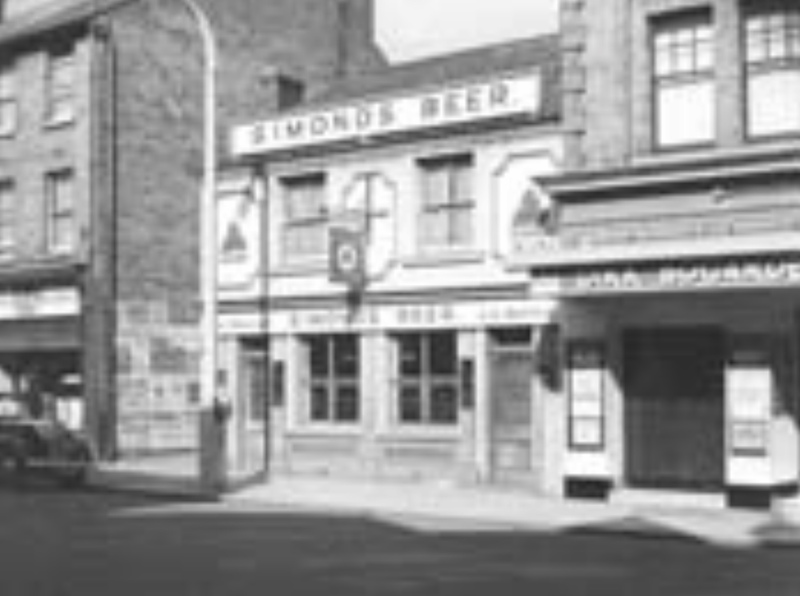 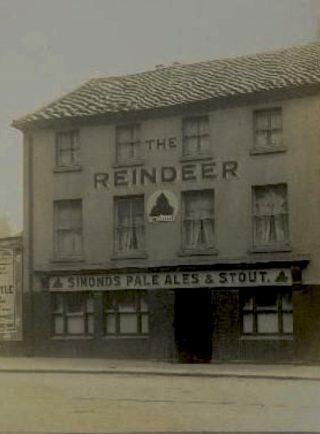 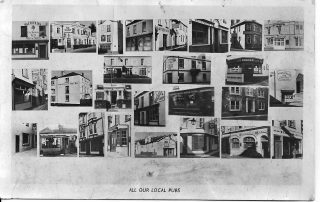 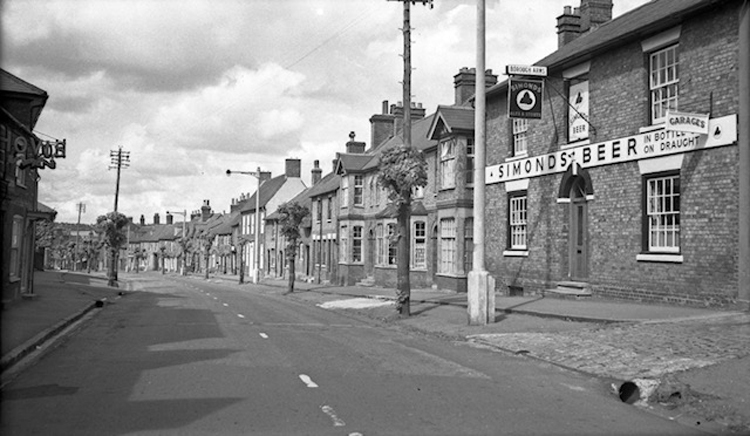 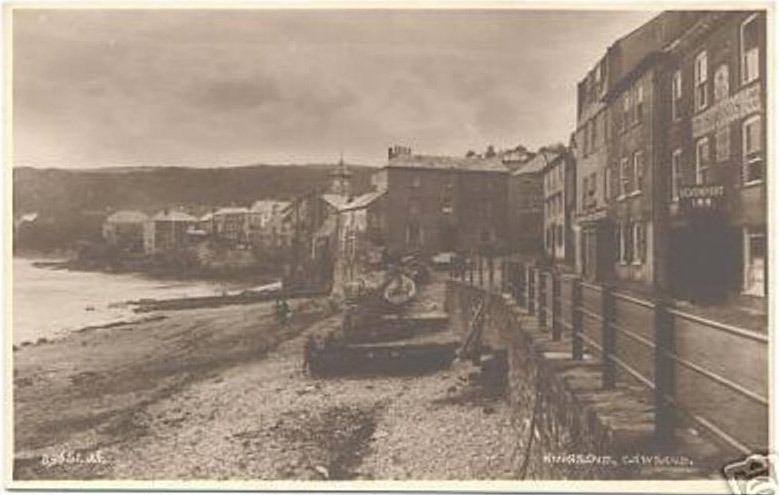 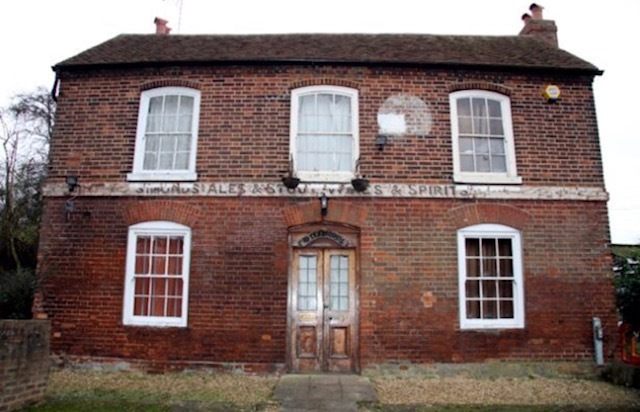 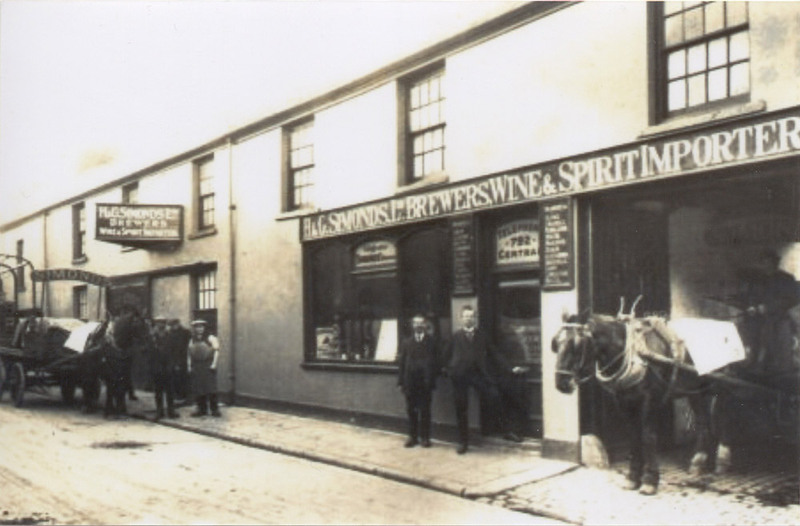 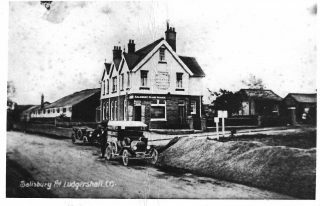 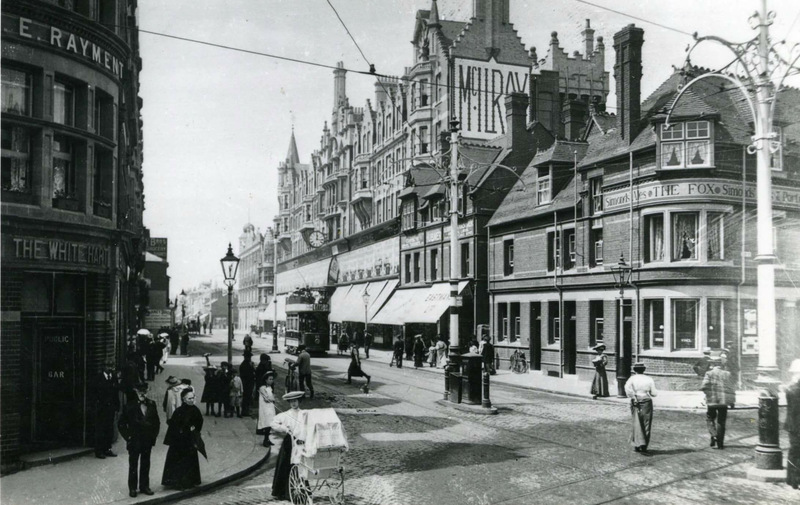 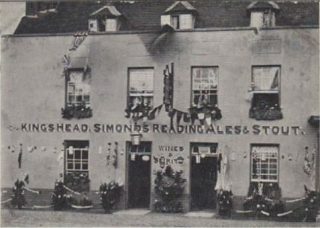 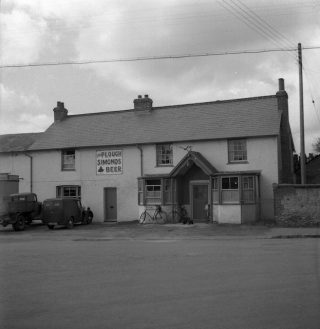 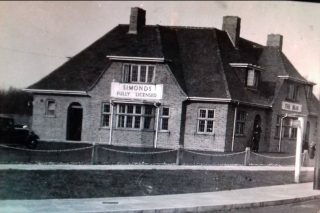 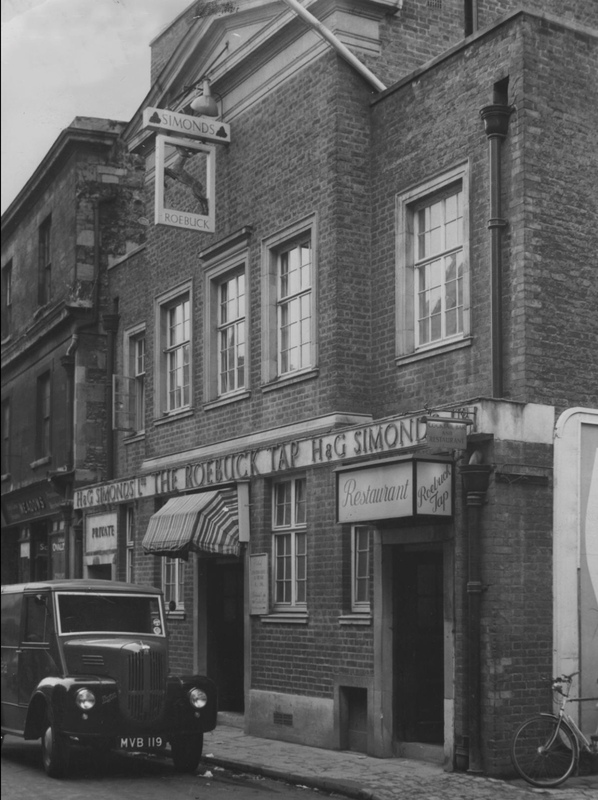 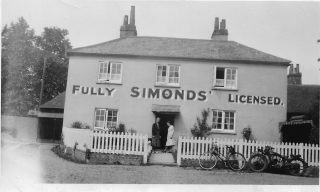 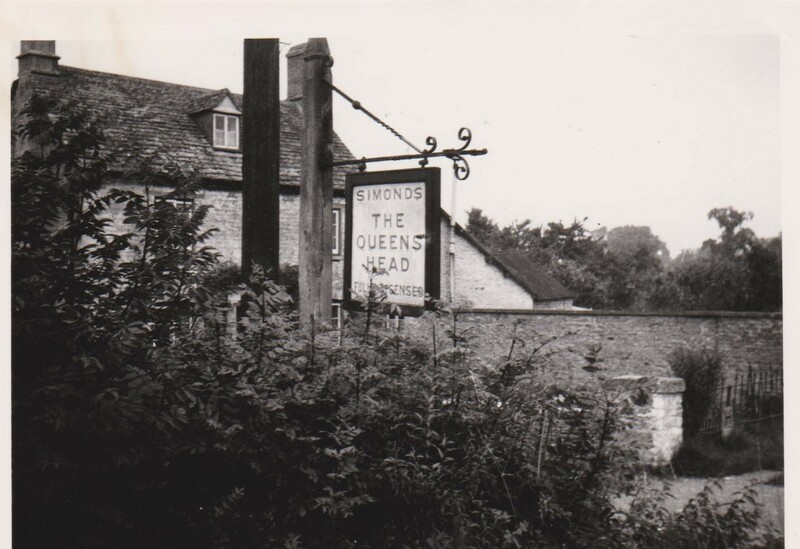 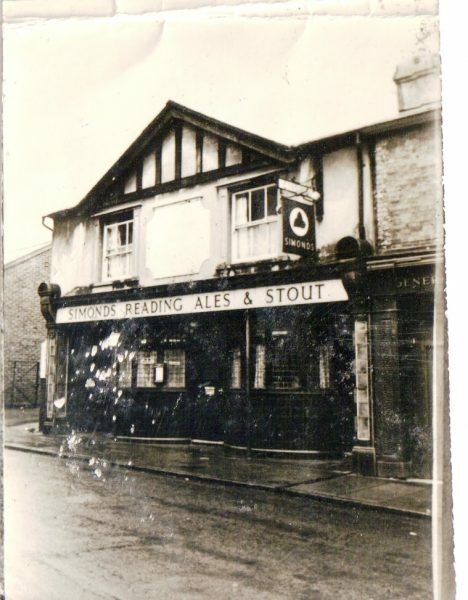 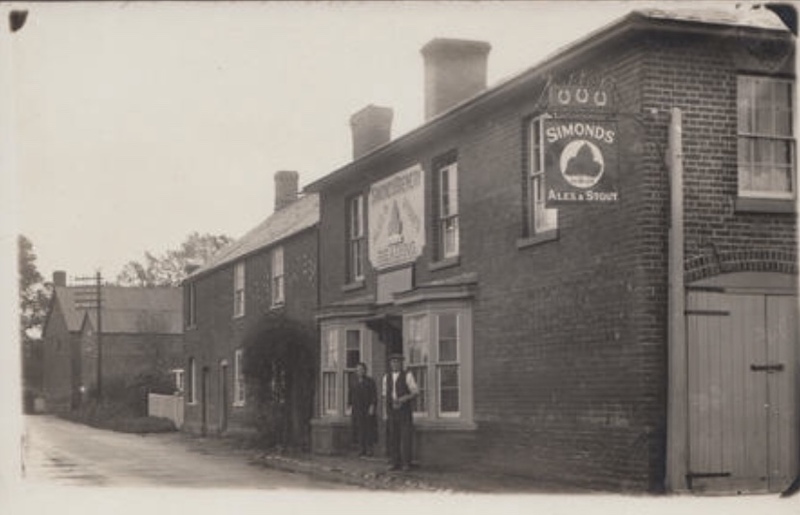 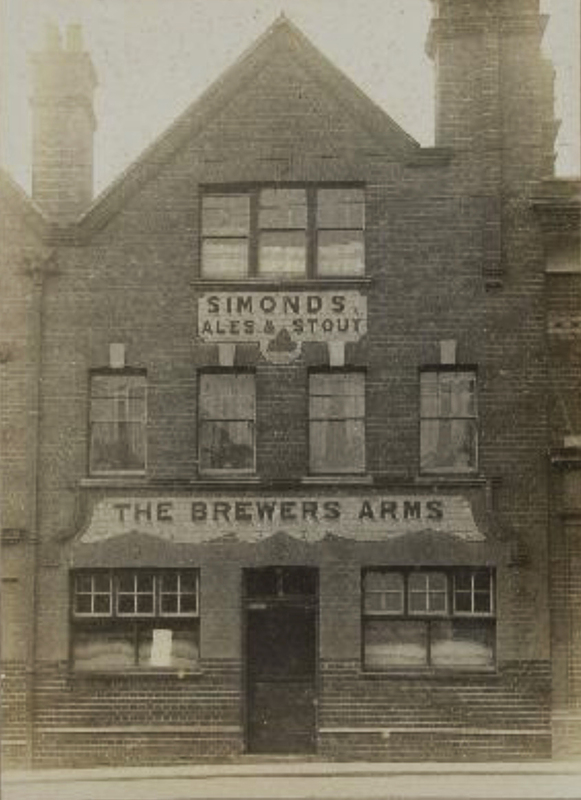 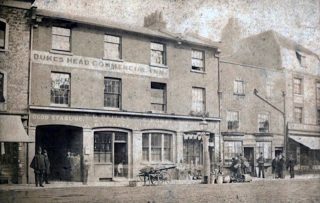 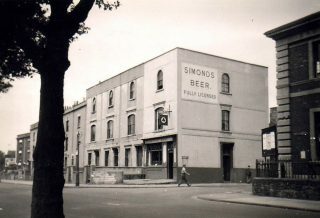 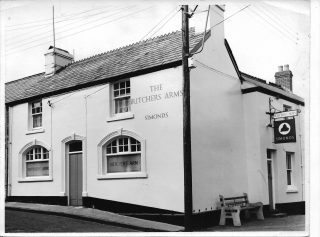 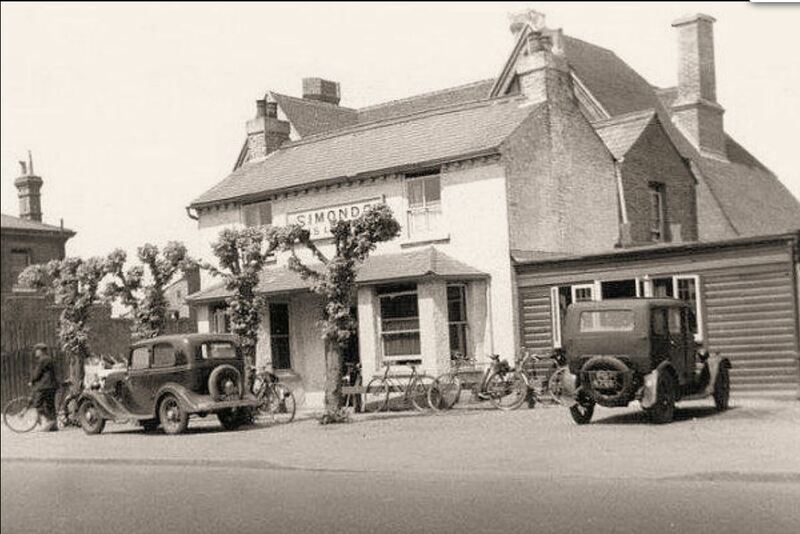 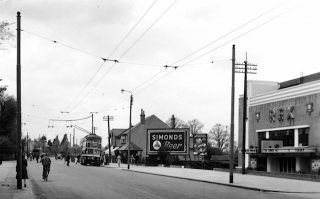 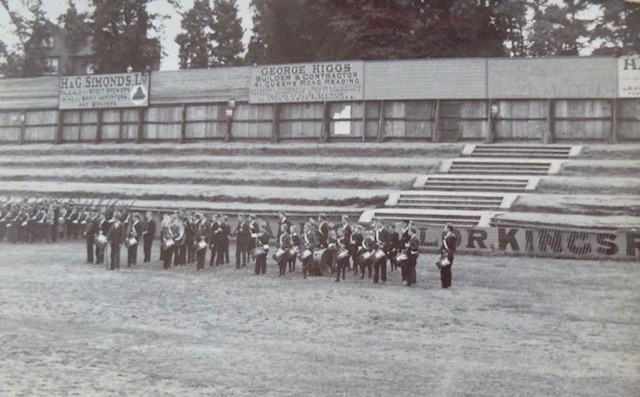 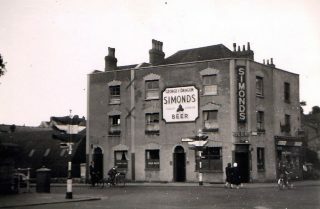 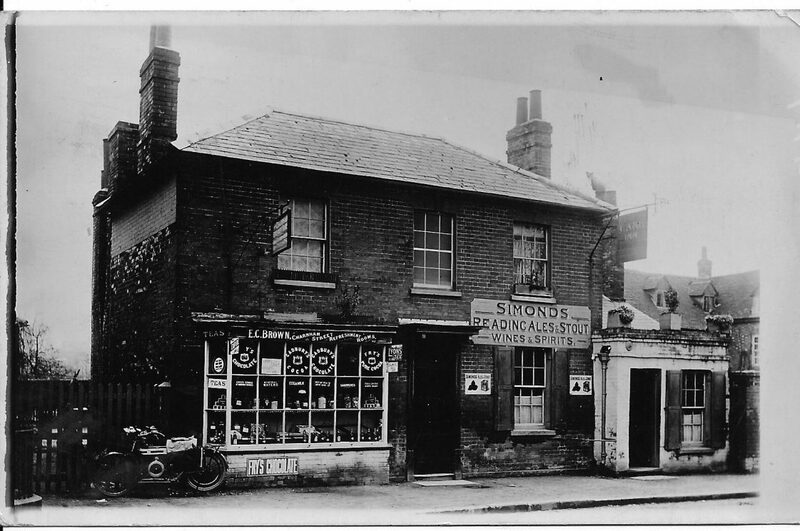 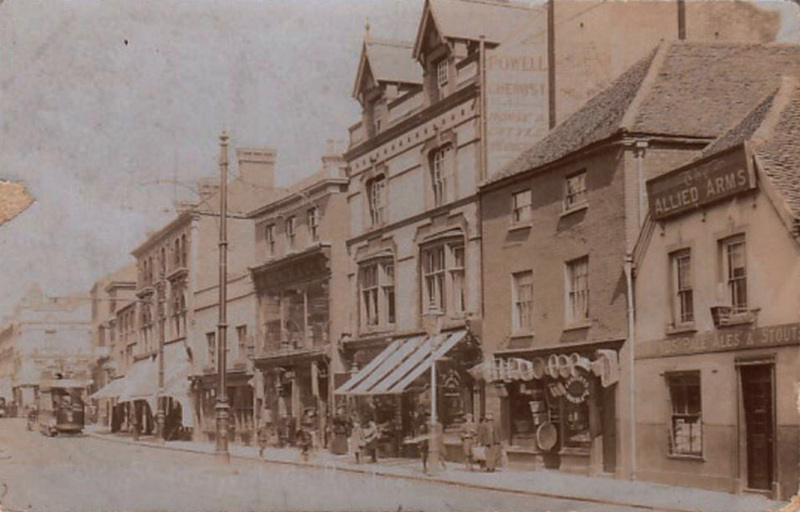 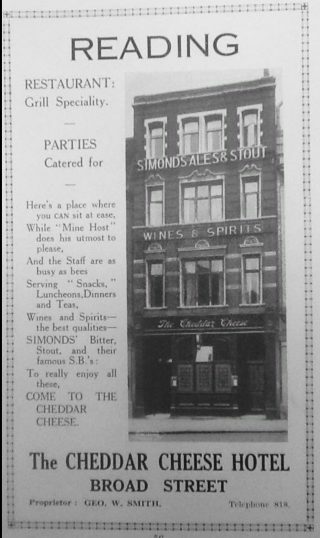 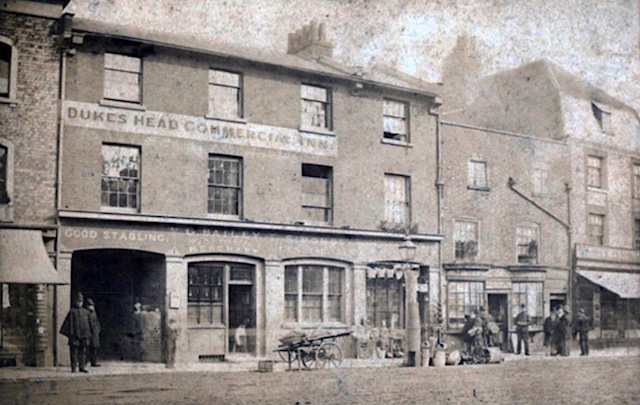 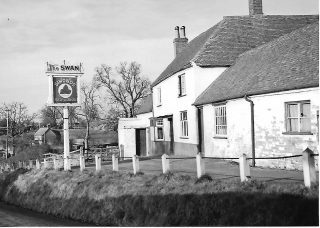 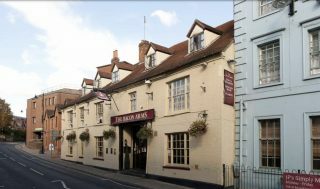 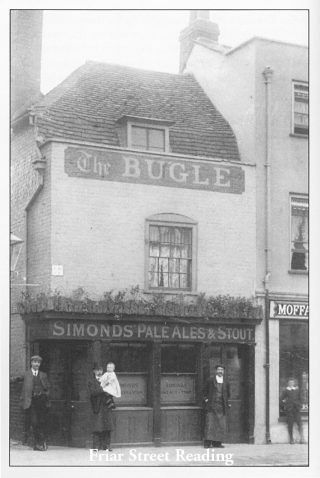 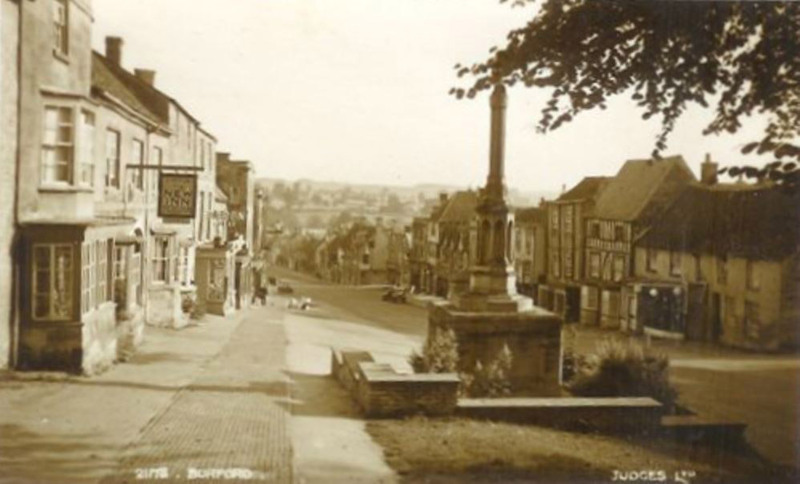 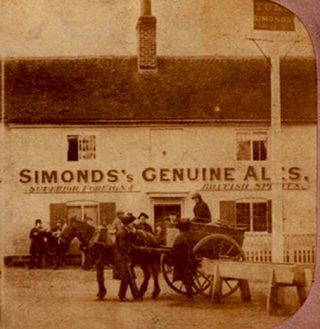 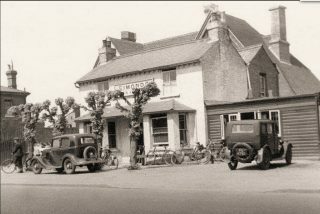 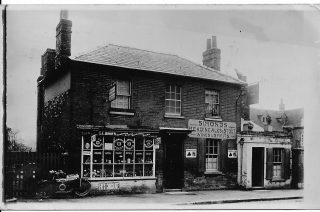 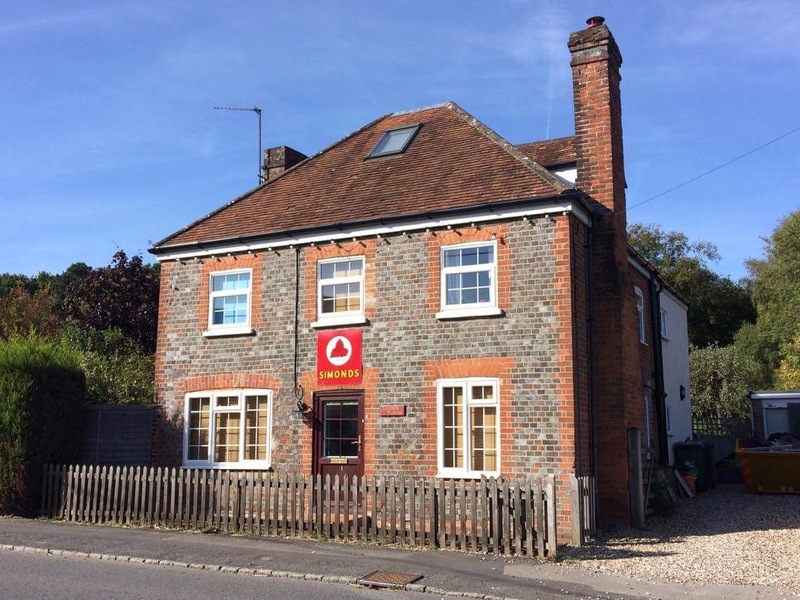 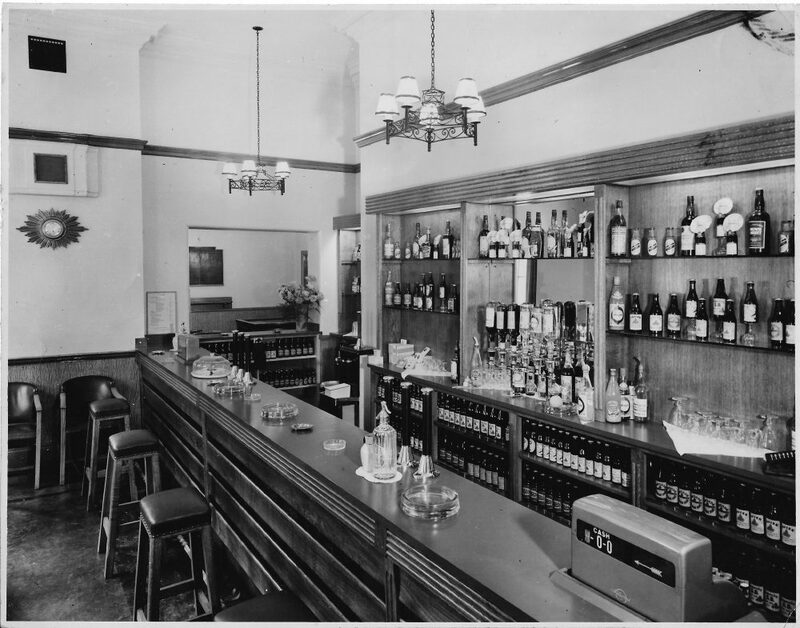 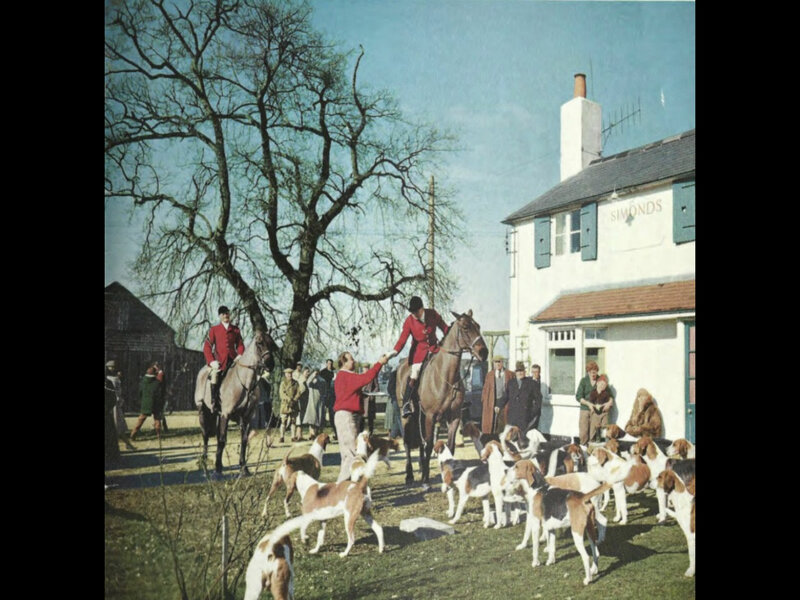 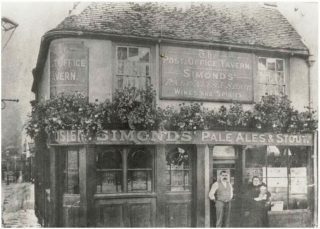 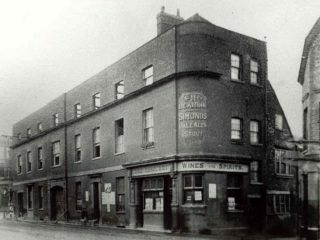 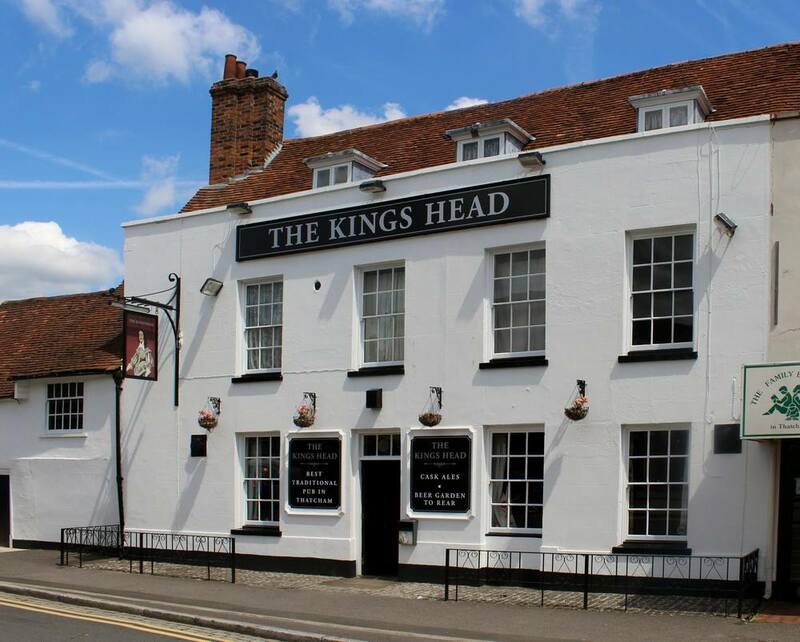 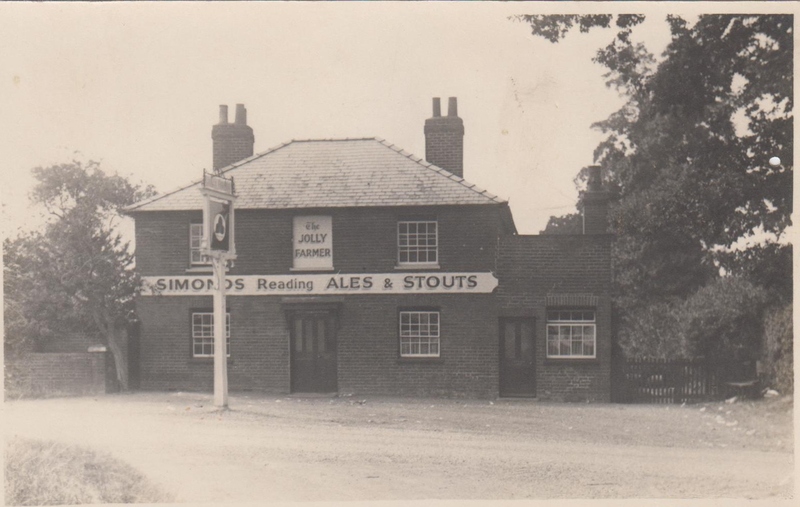 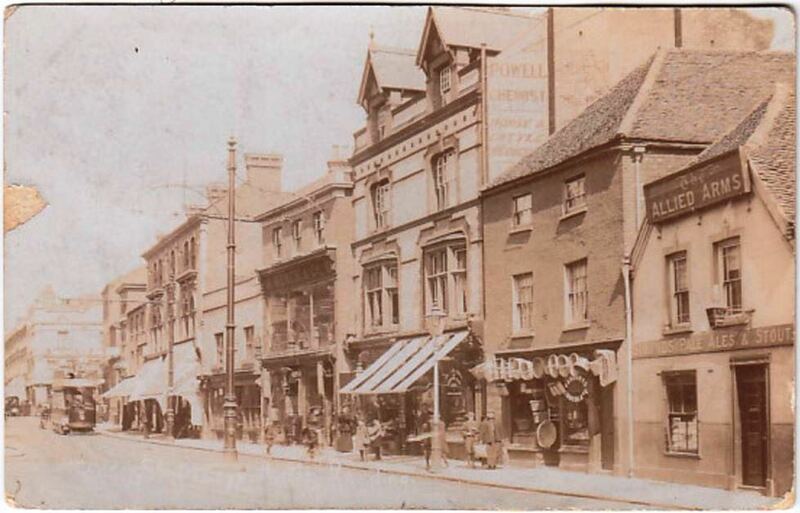 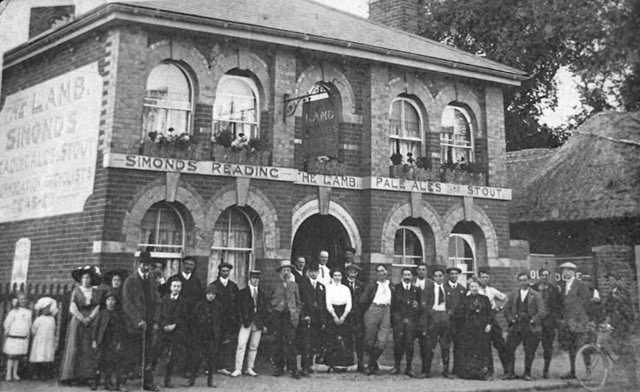 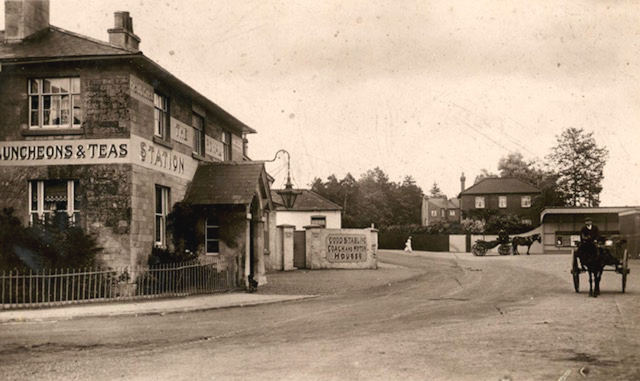 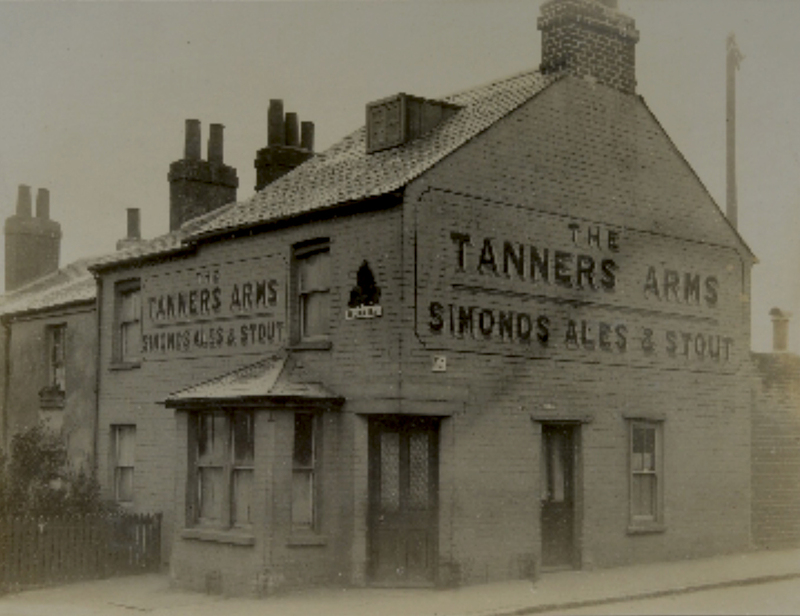 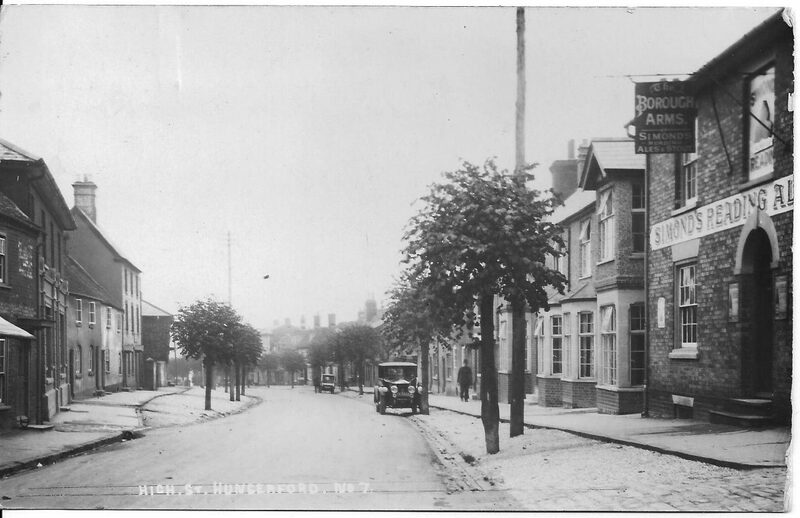 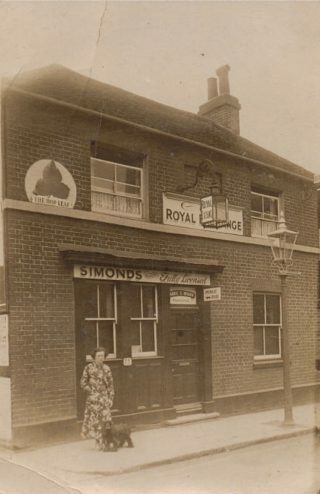 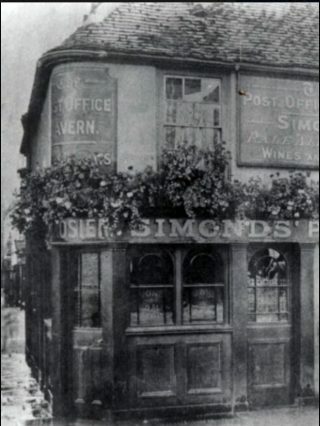 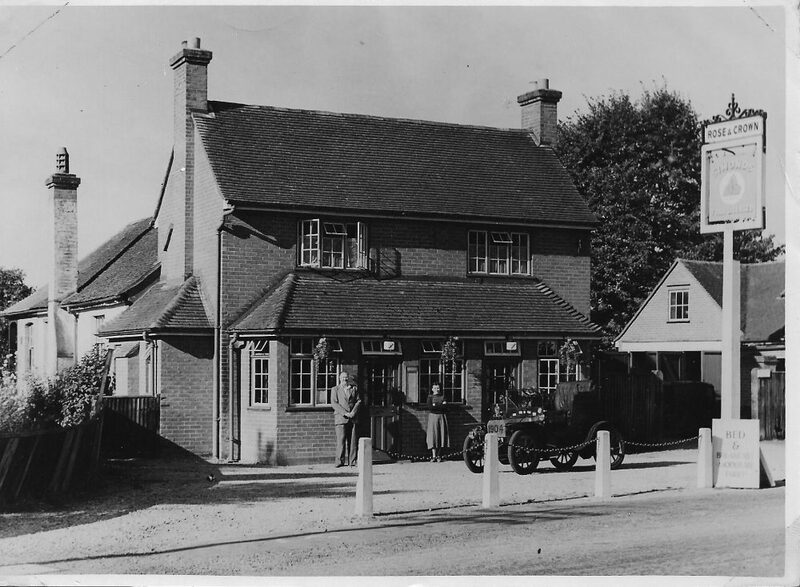 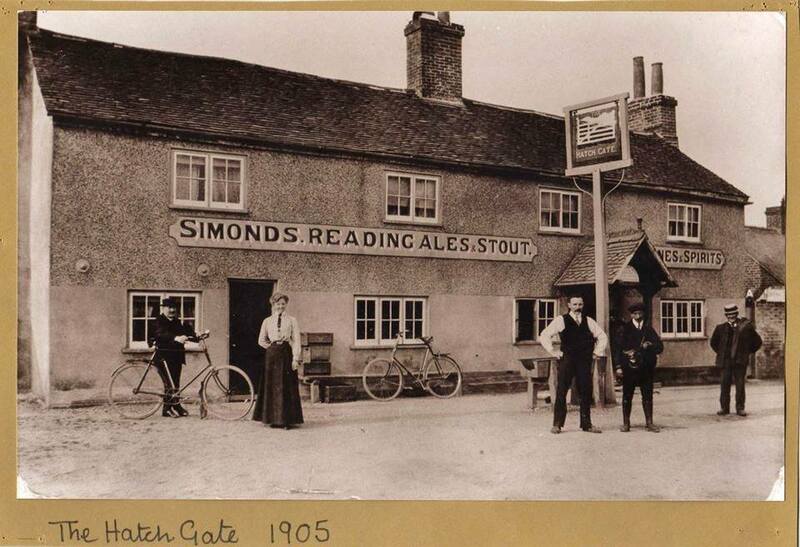 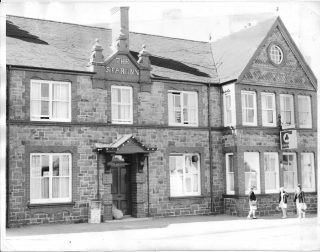 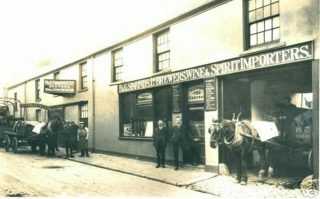 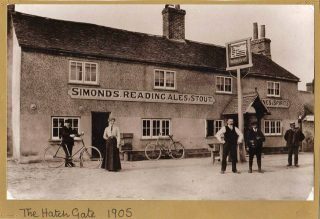 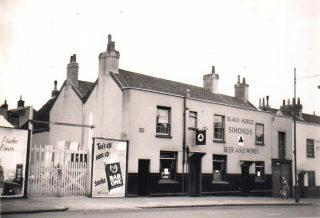 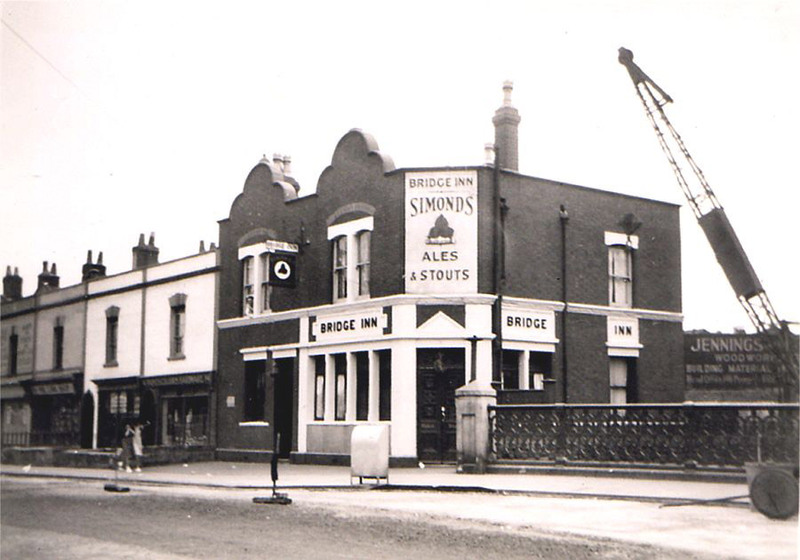 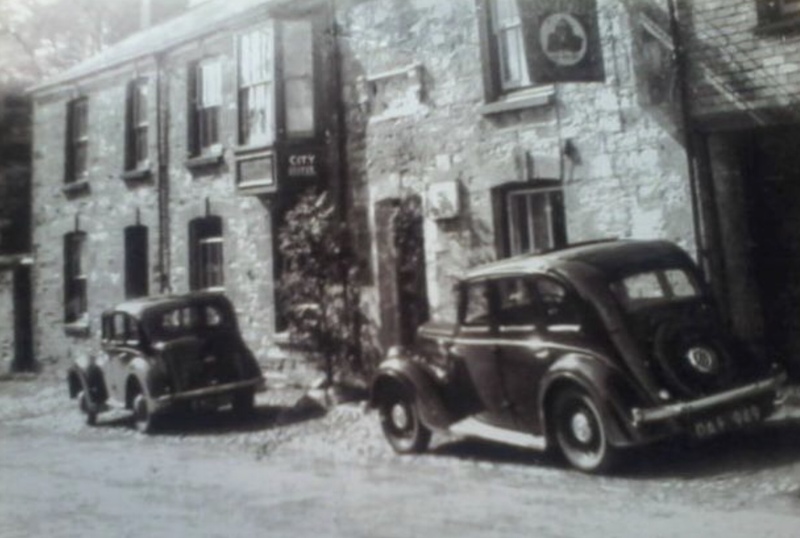 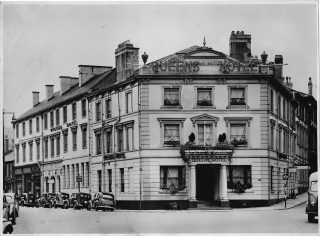 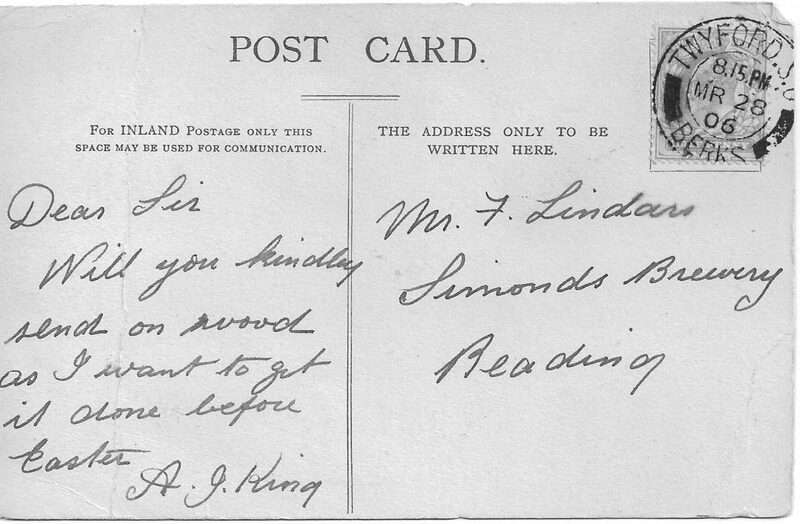 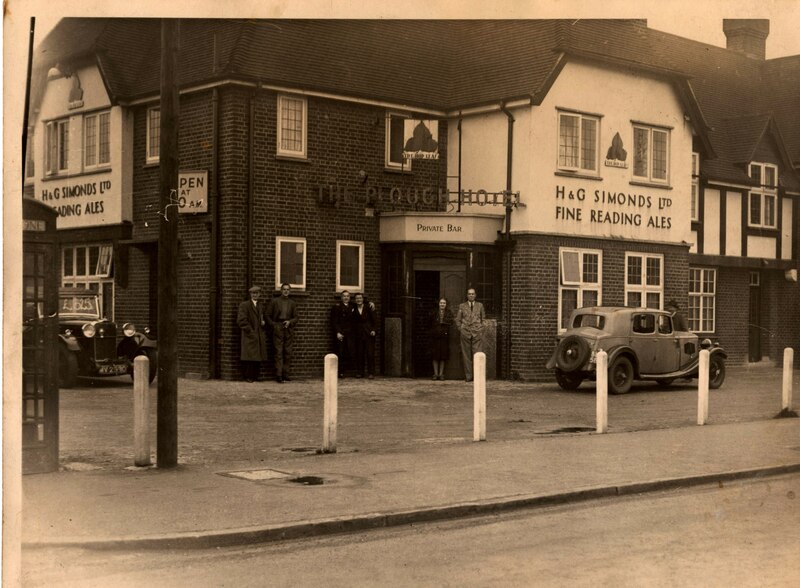 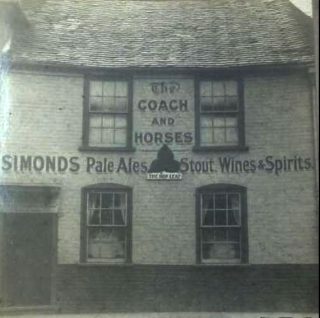 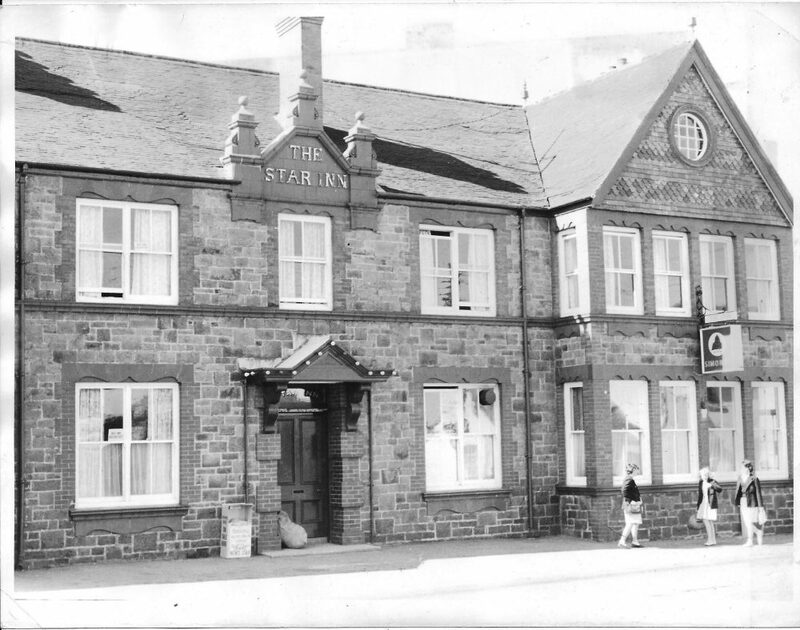 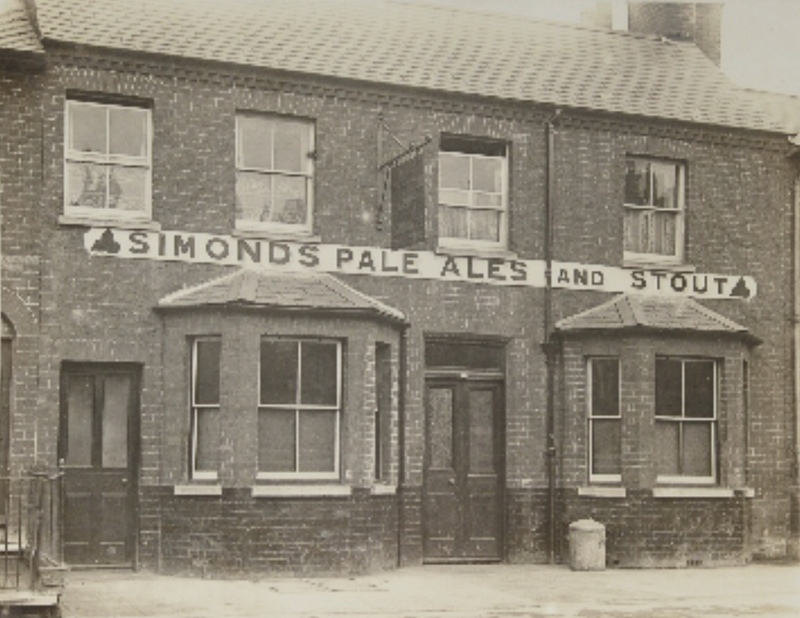 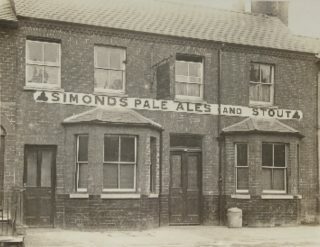 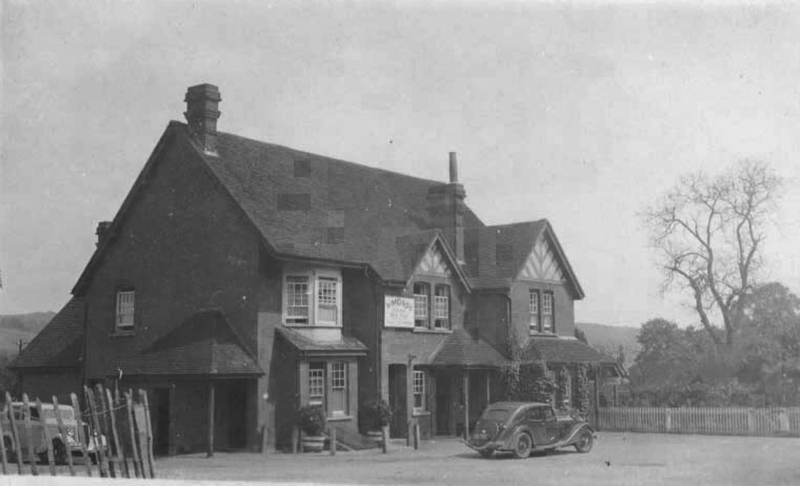 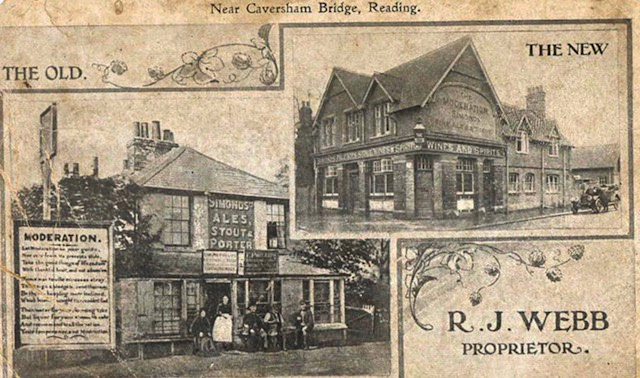 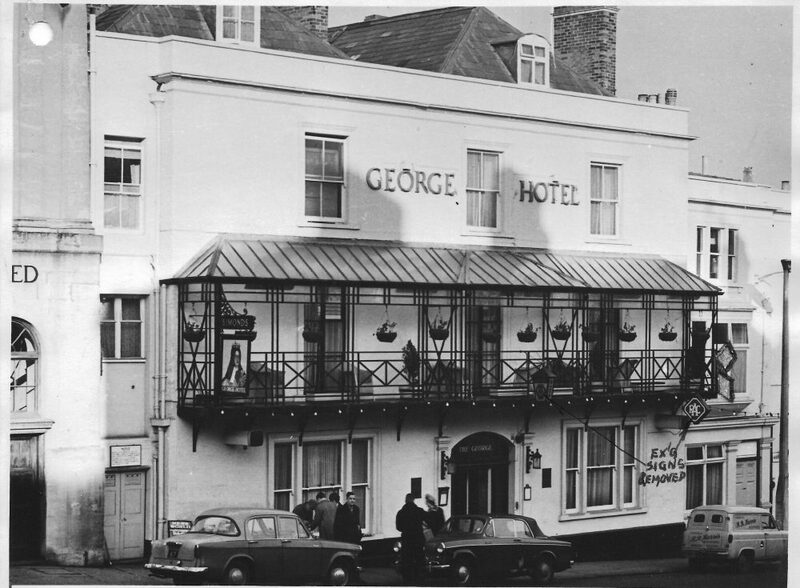 Here is a great selection of the pubs and properties of H&G Simonds Ltd. 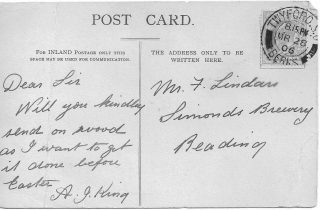 If you can add to it – please send me information or images to show here. 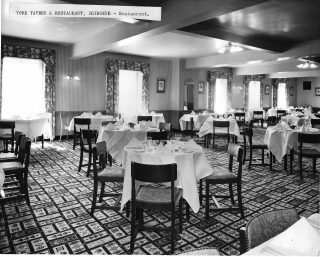 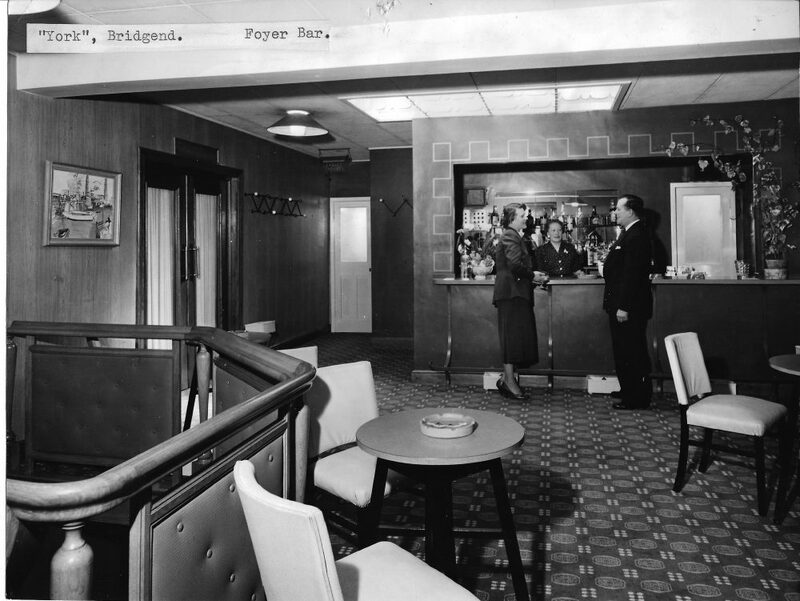 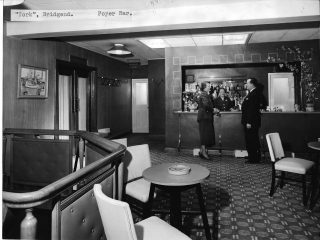 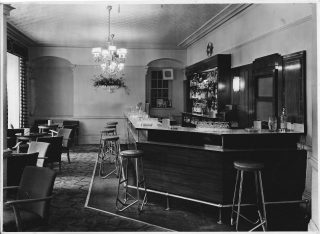 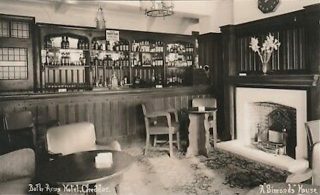 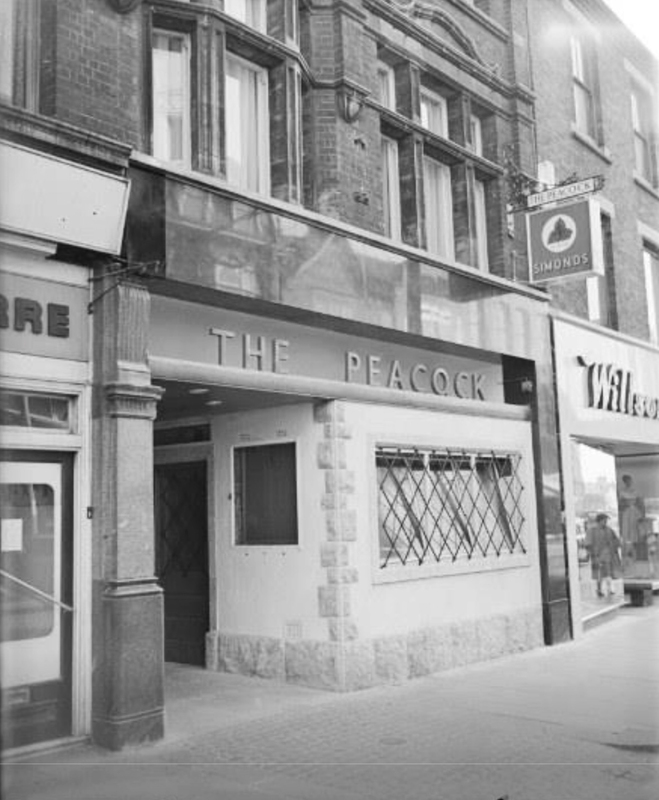 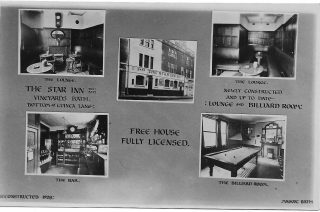 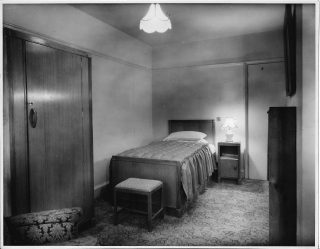 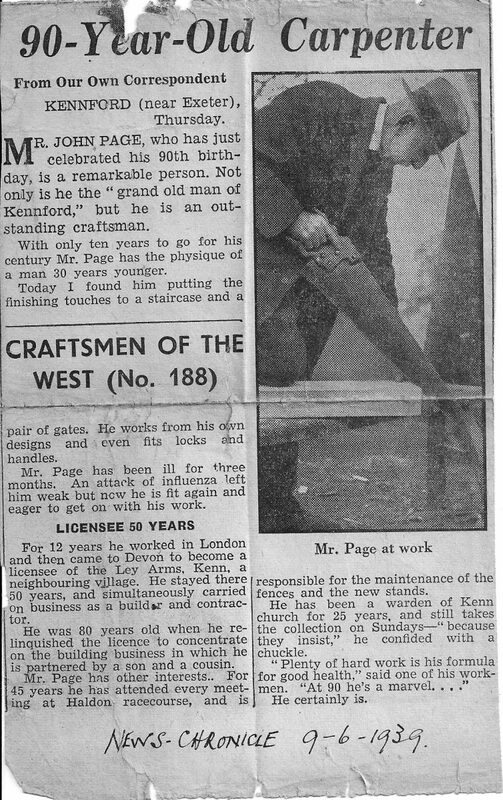 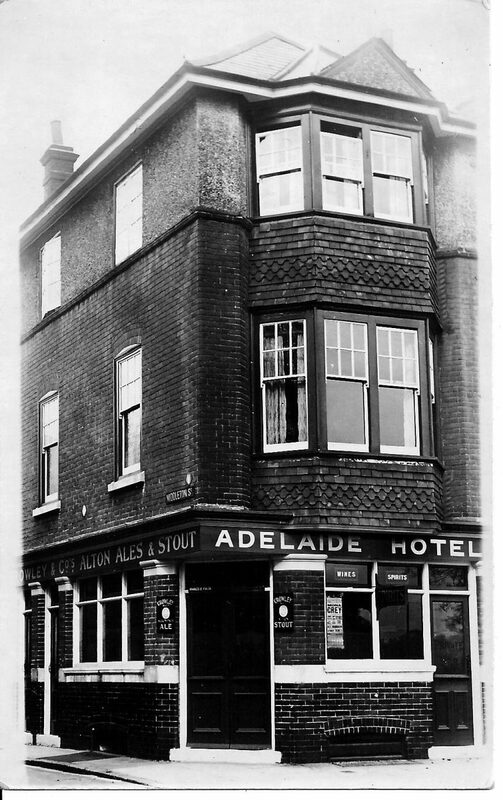 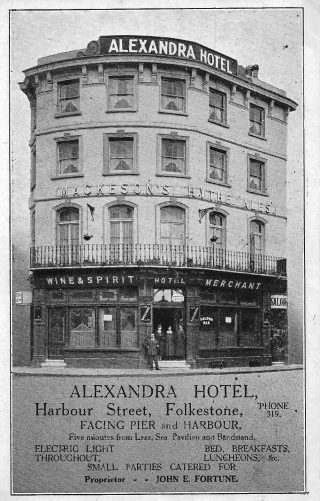 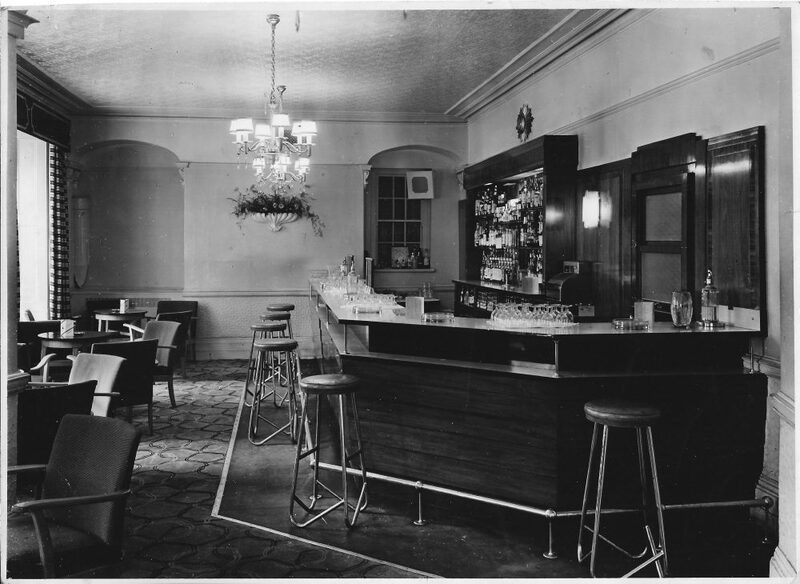 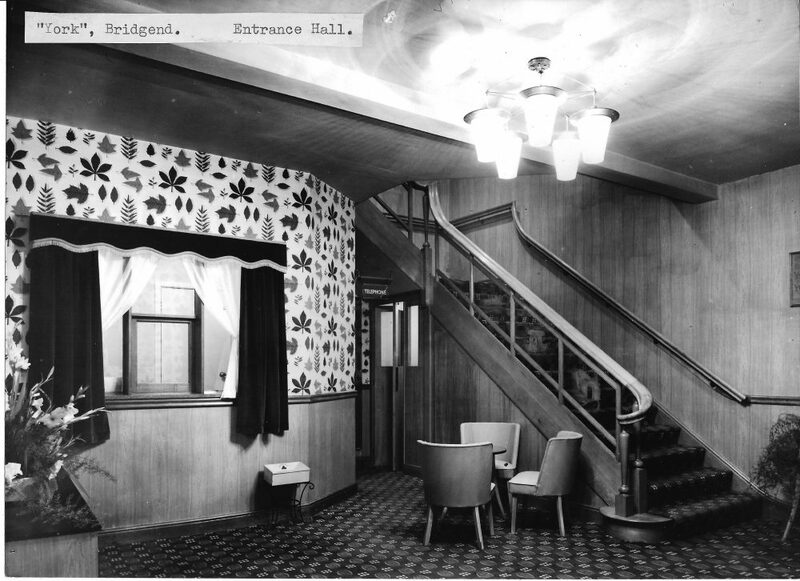 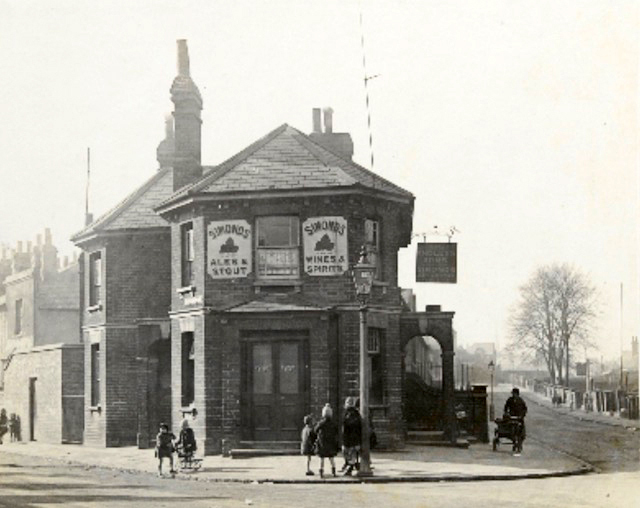 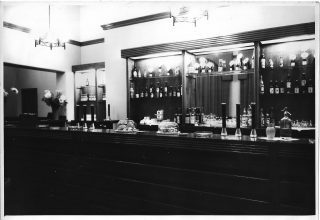 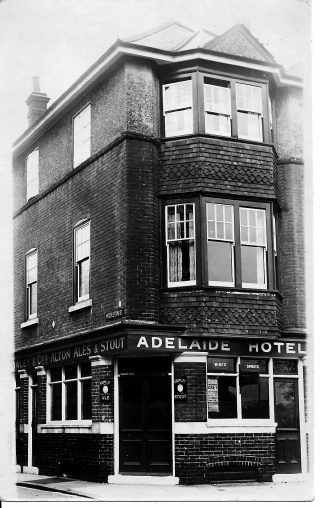 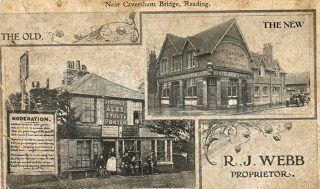 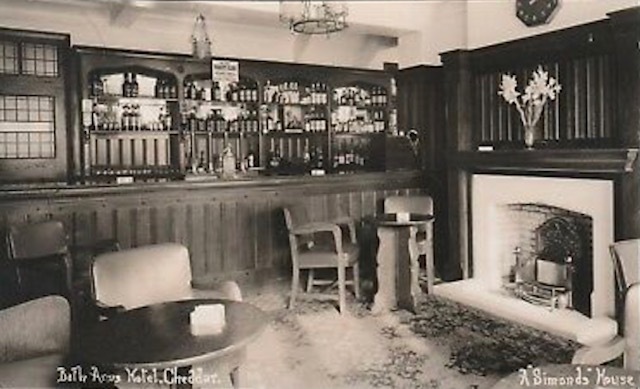 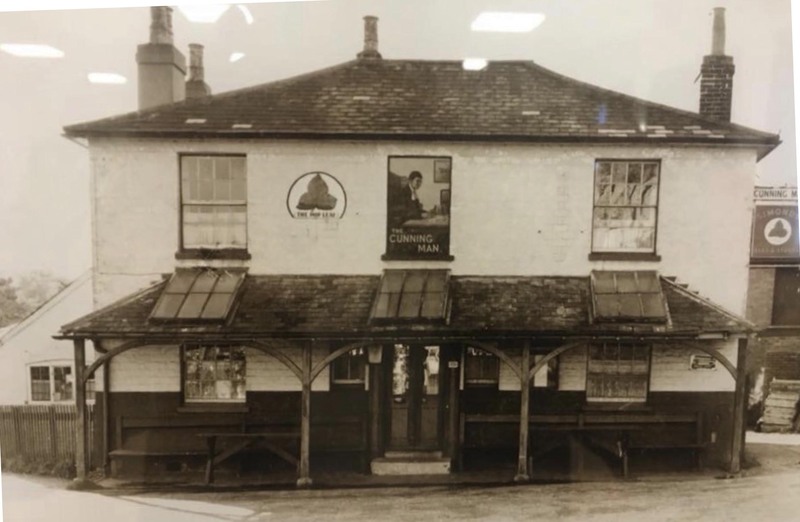 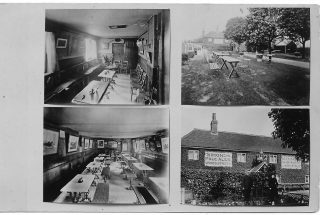 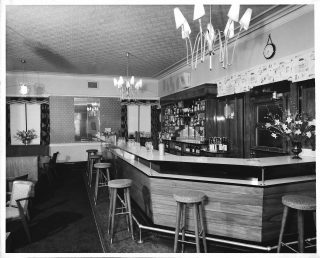 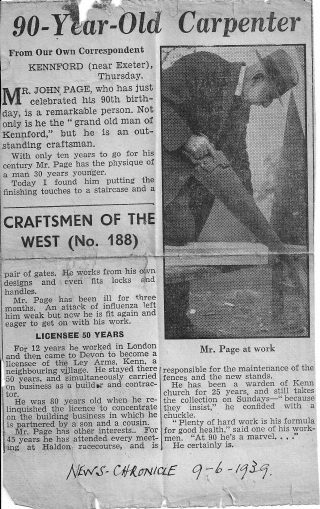 If you are searching for more information, then the in-house magazine that was published from 1926 – 1960, ‘The Hop Leaf Gazette’ always carried articles on new and refurbished pubs and there are also some interesting websites that list ‘lost pubs’. 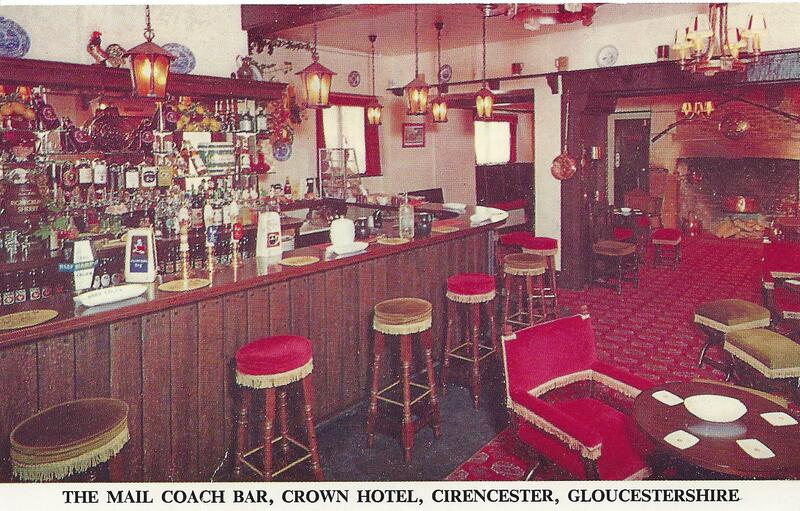 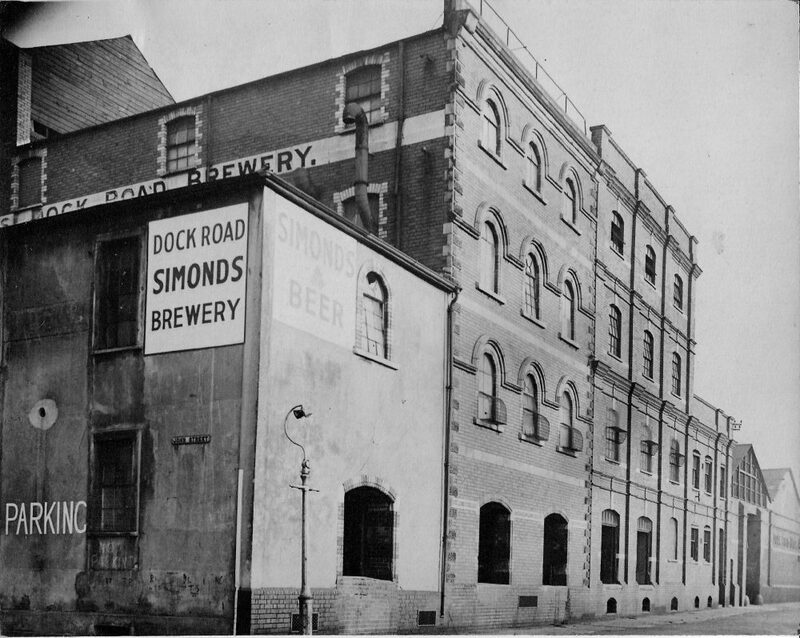 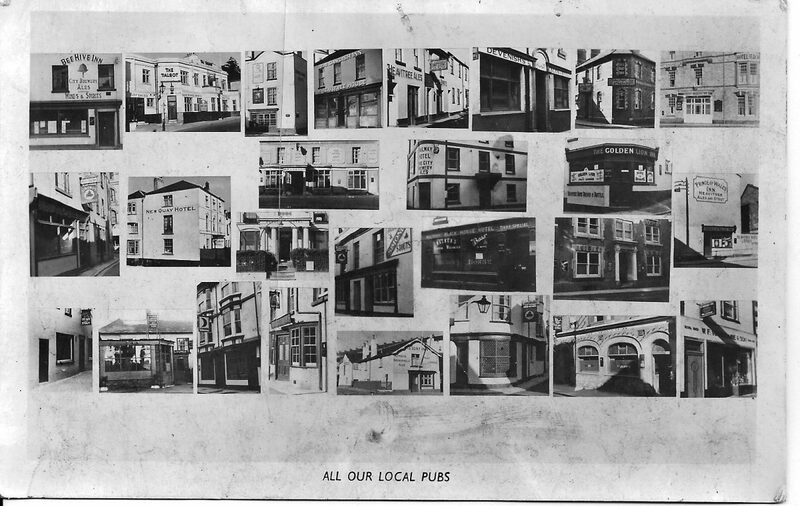 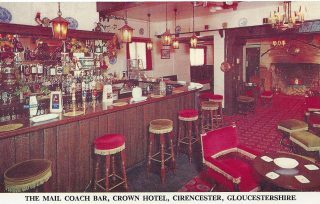 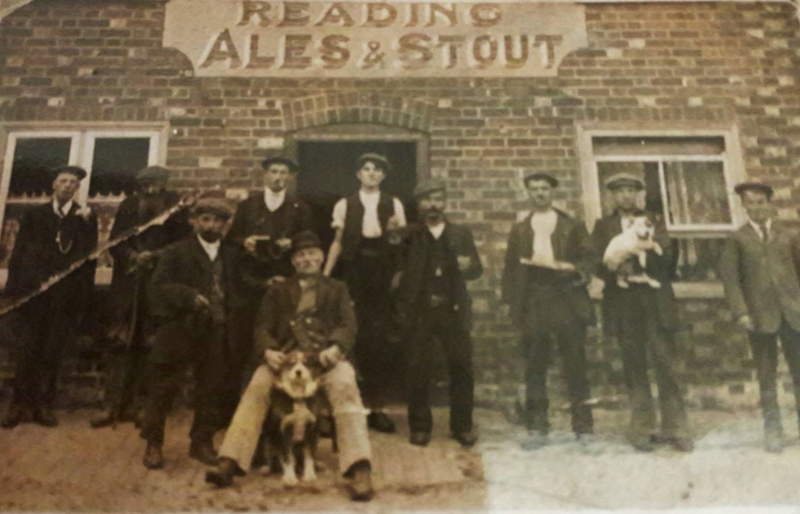 Bristol pubs merited their own page, as does the photo album of the Brewery’s in house design department. 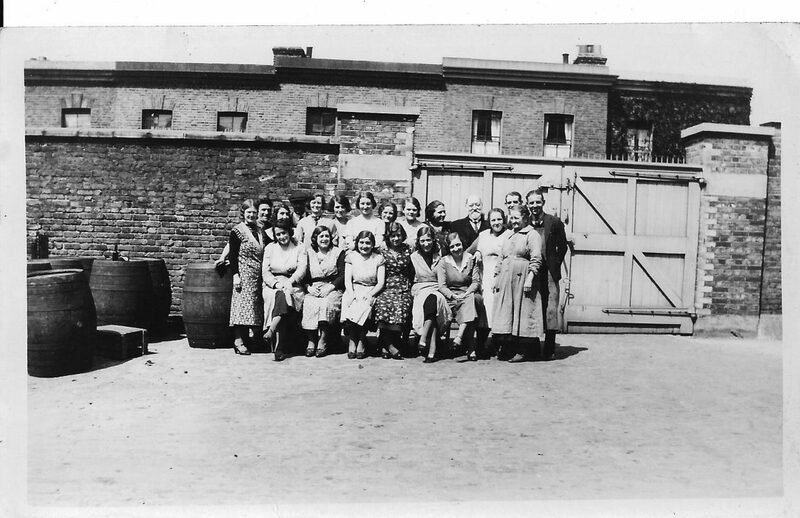 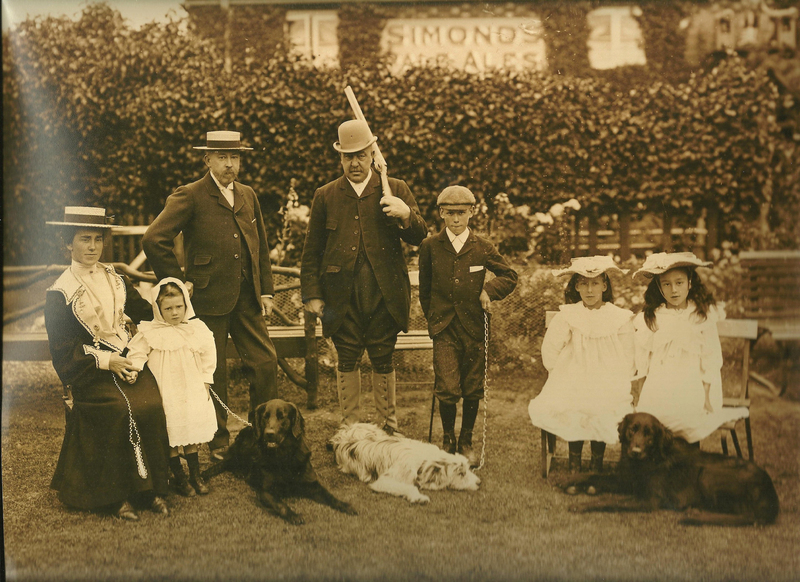 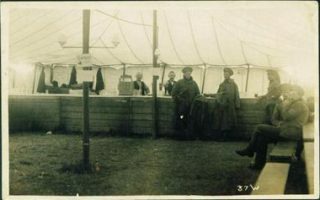 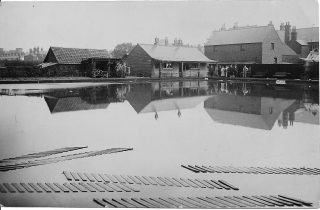 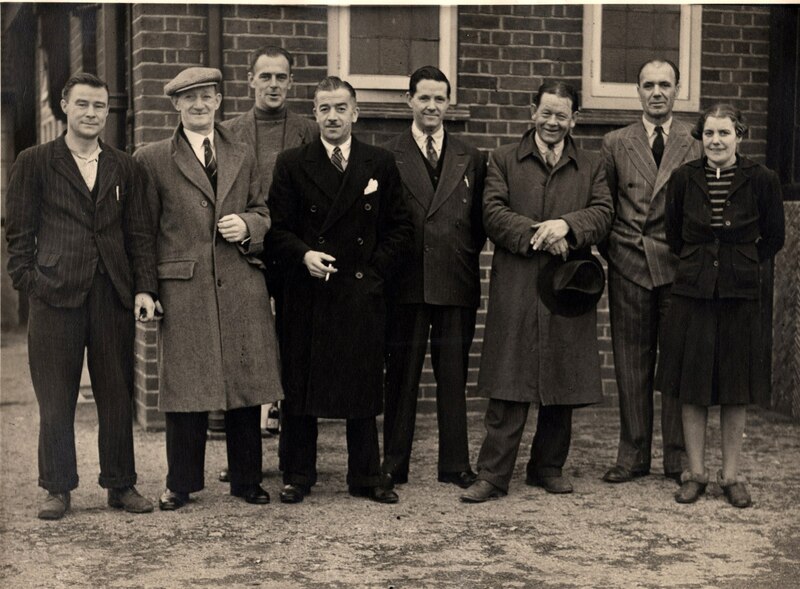 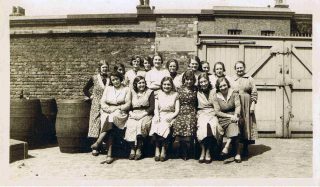 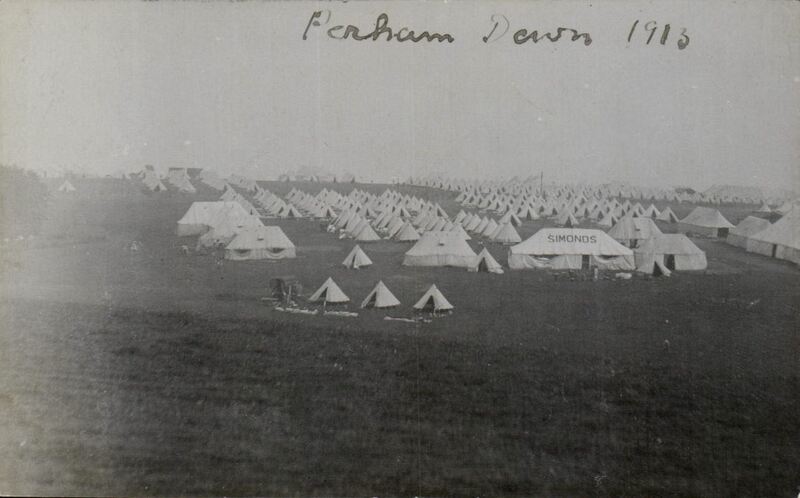 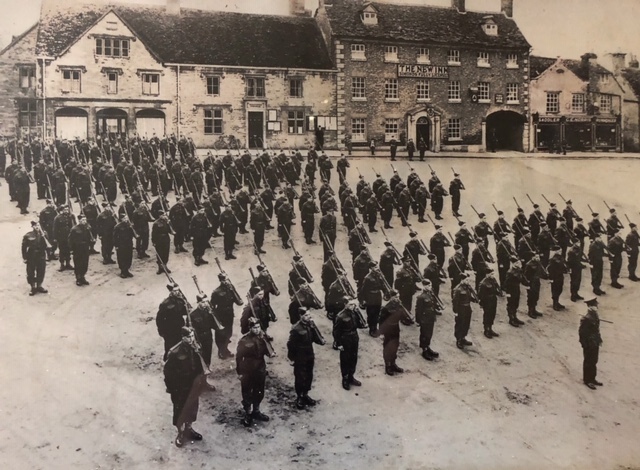 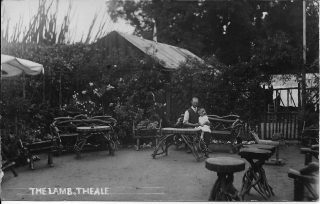 Unidentified images are tagged ‘X’ at the bottom – can you help us to identify any? 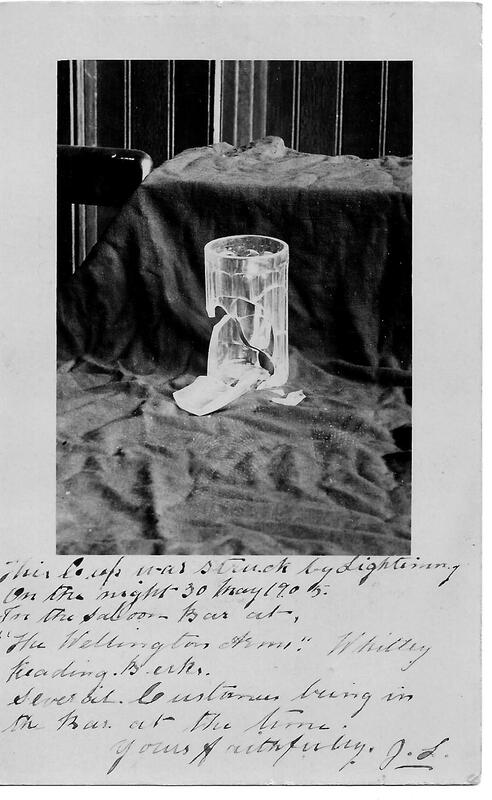 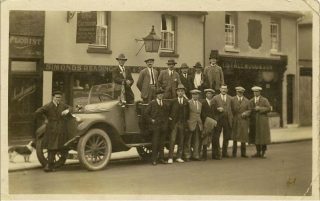 With particular thanks to John Berry, who has now contributed 100’s of images from his own research! 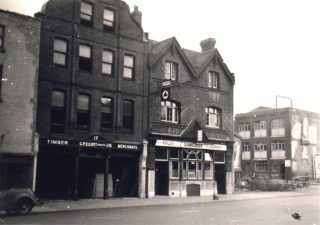 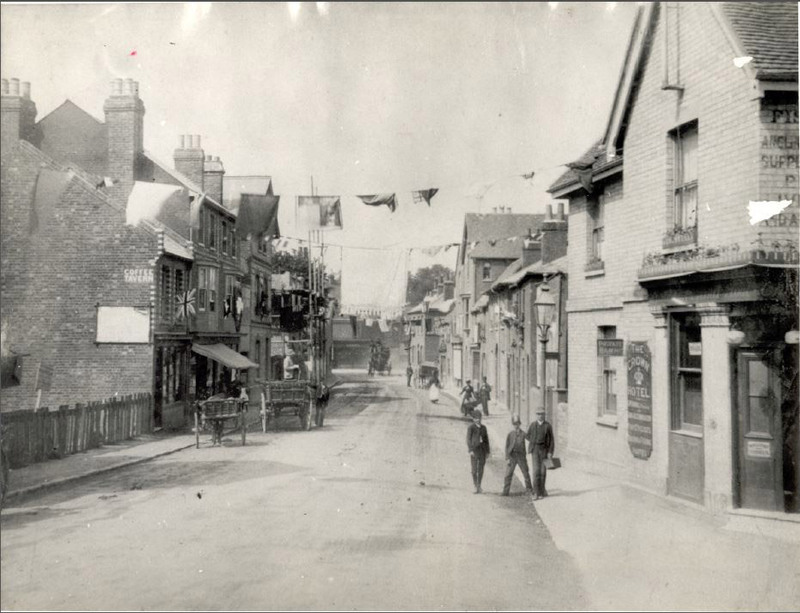 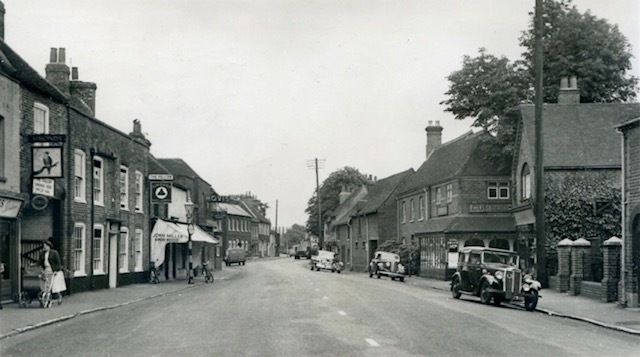 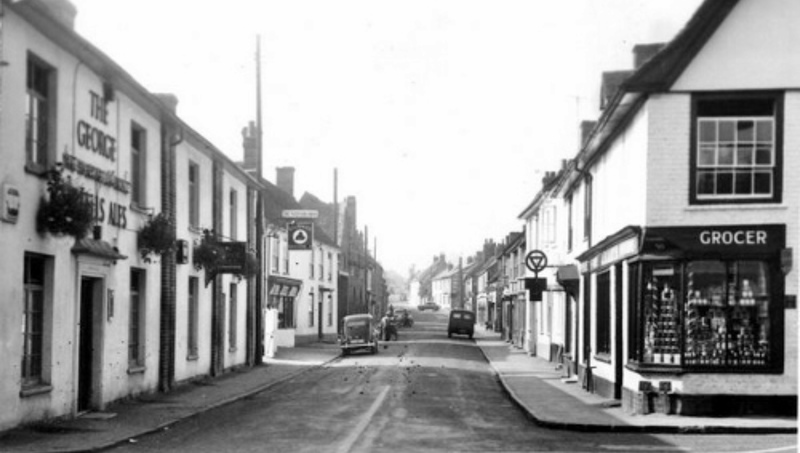 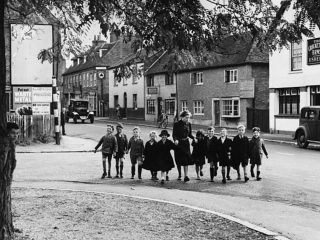 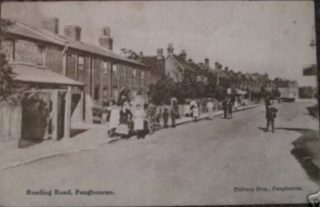 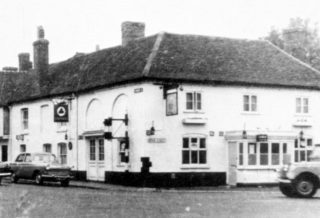 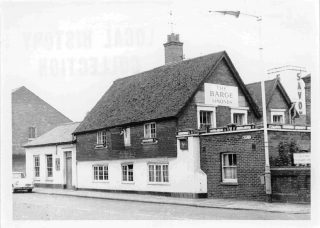 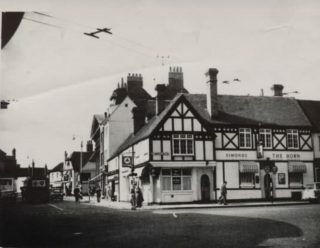 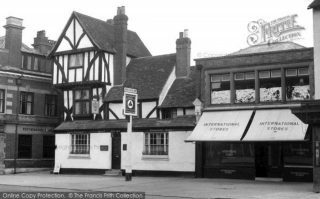 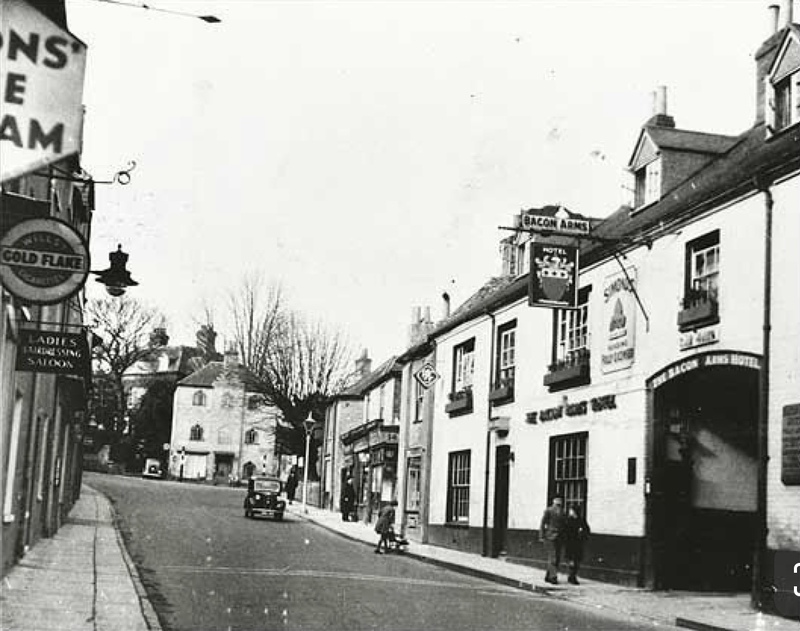 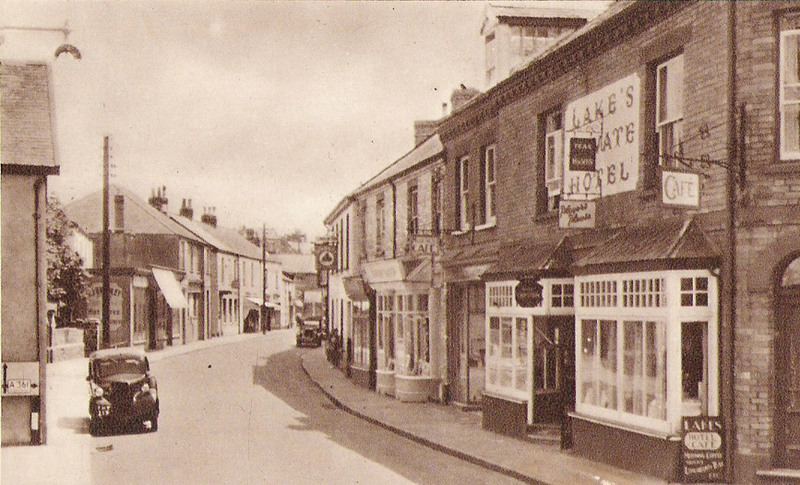 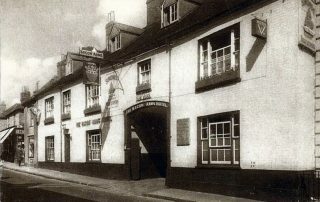 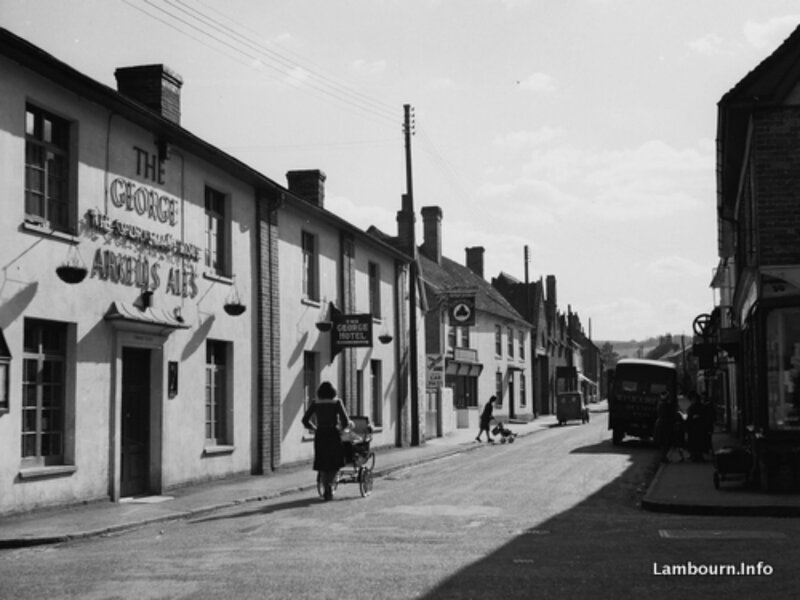 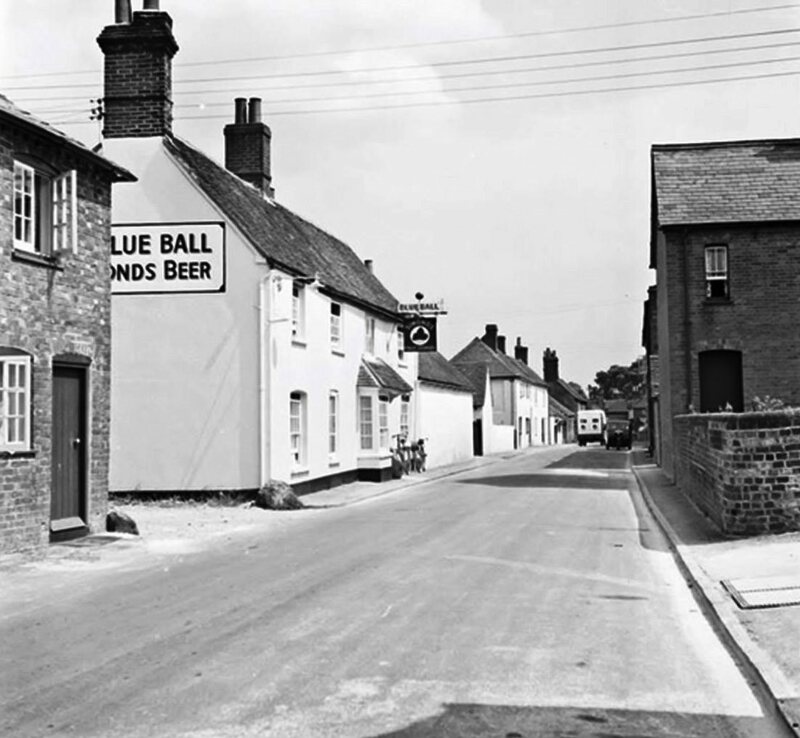 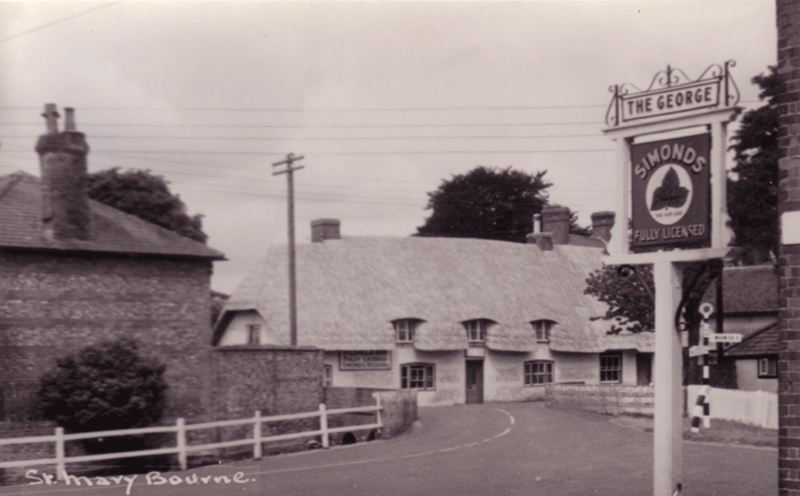 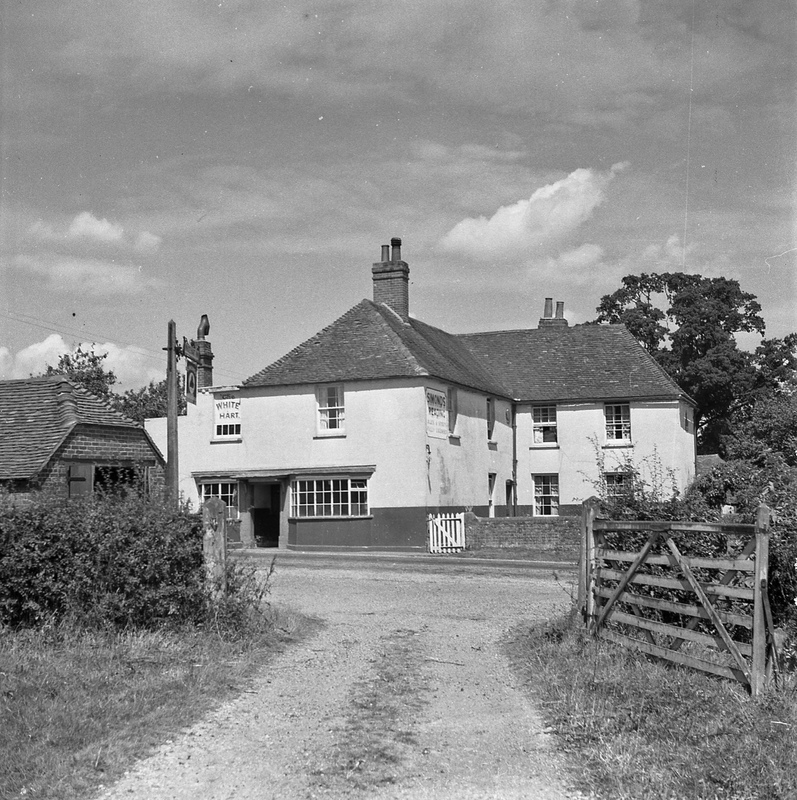 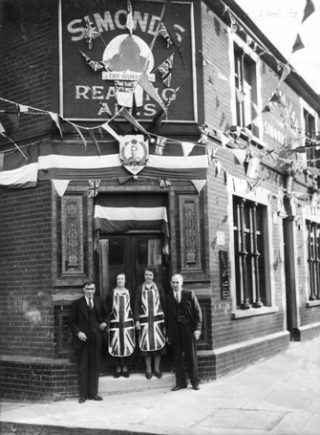 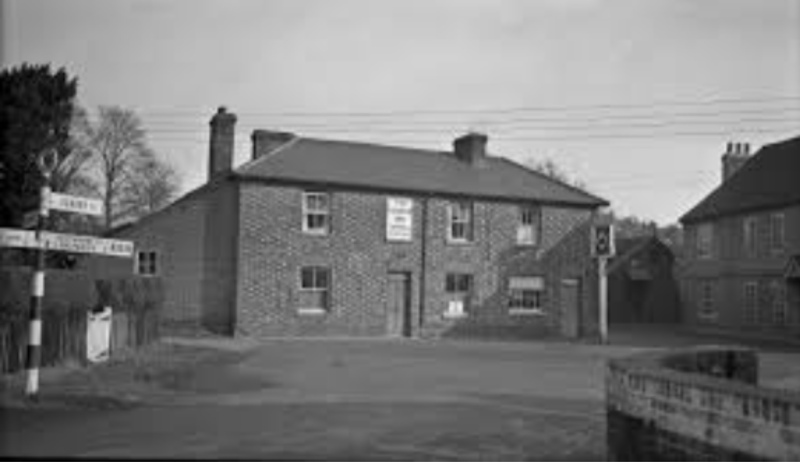 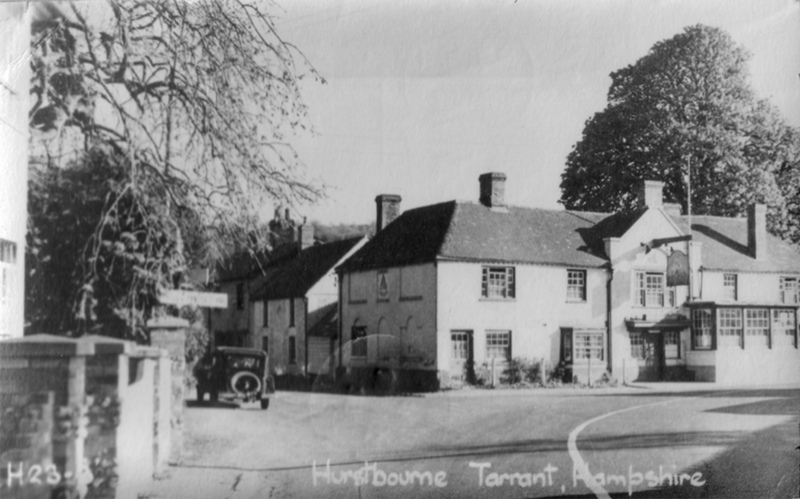 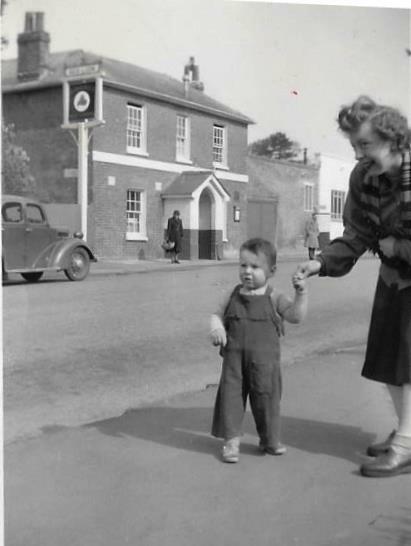 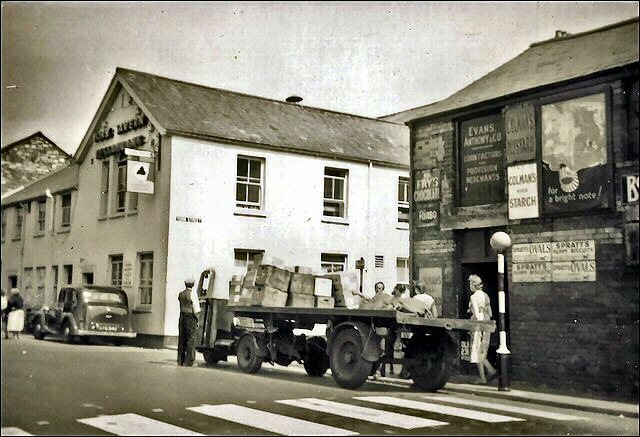 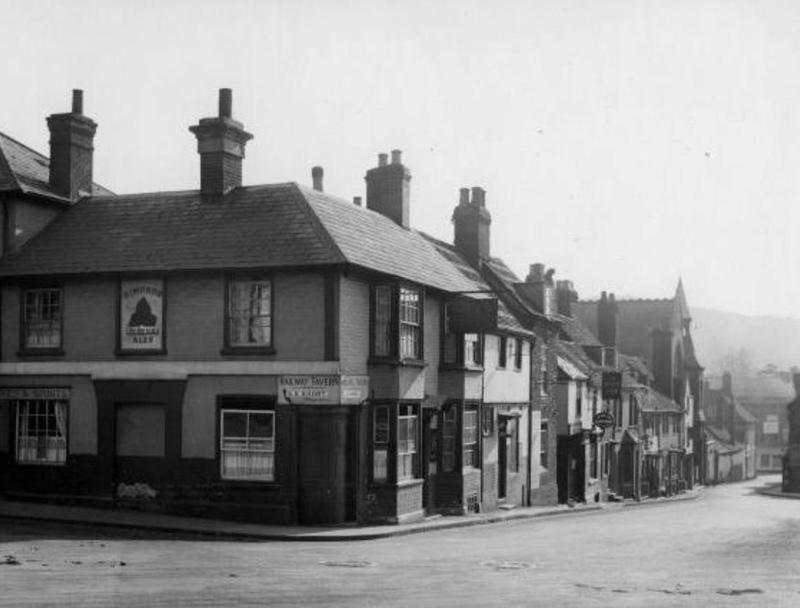 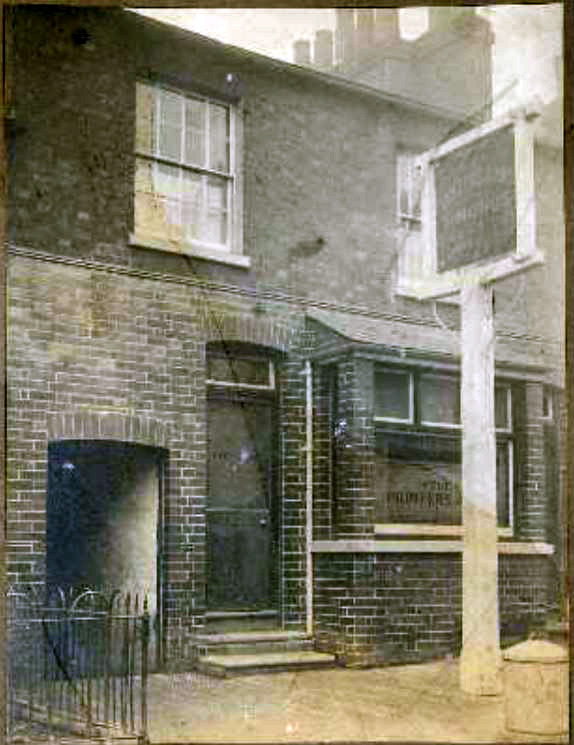 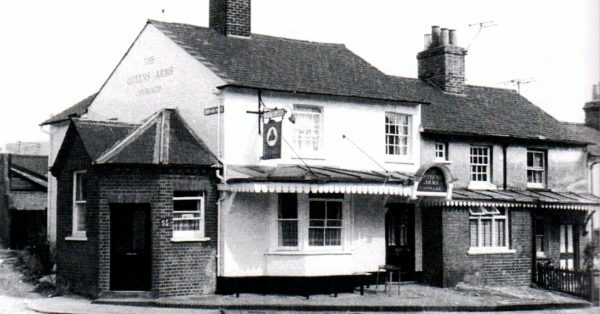 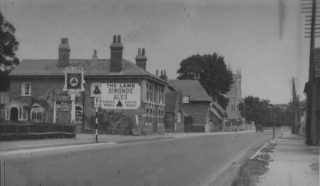 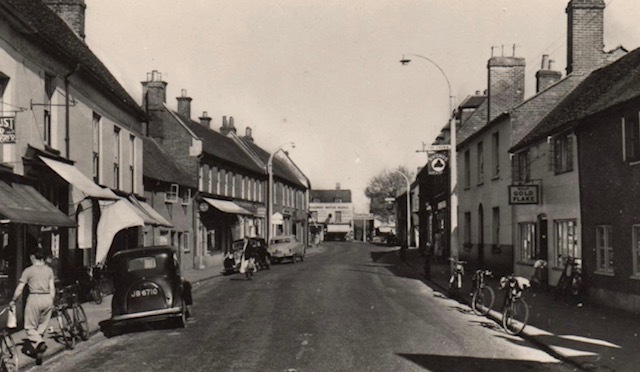 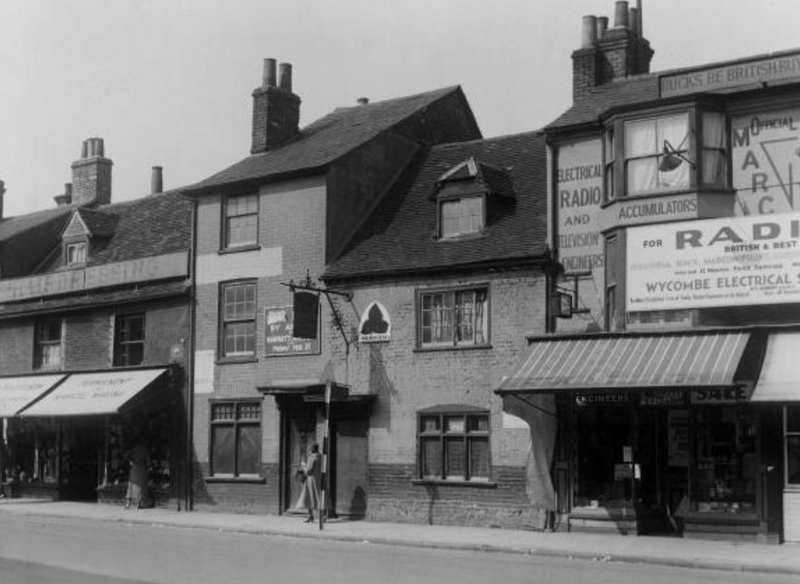 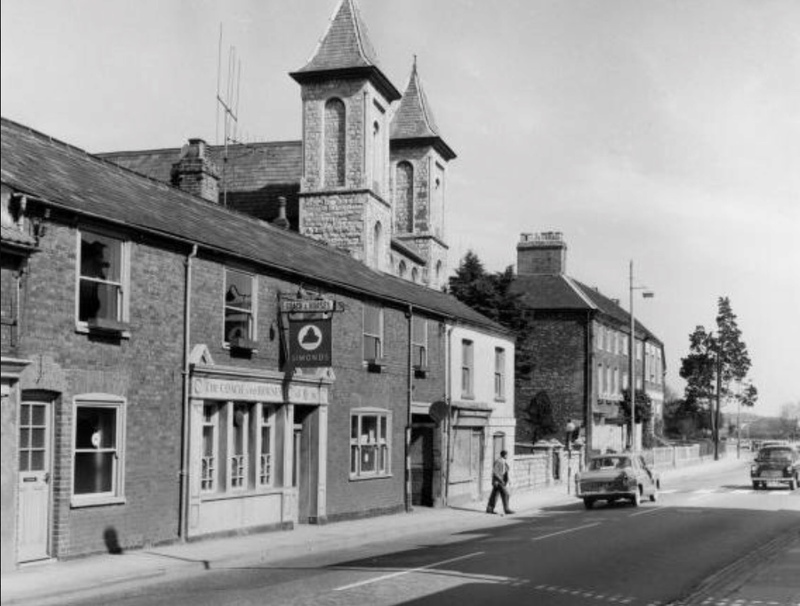 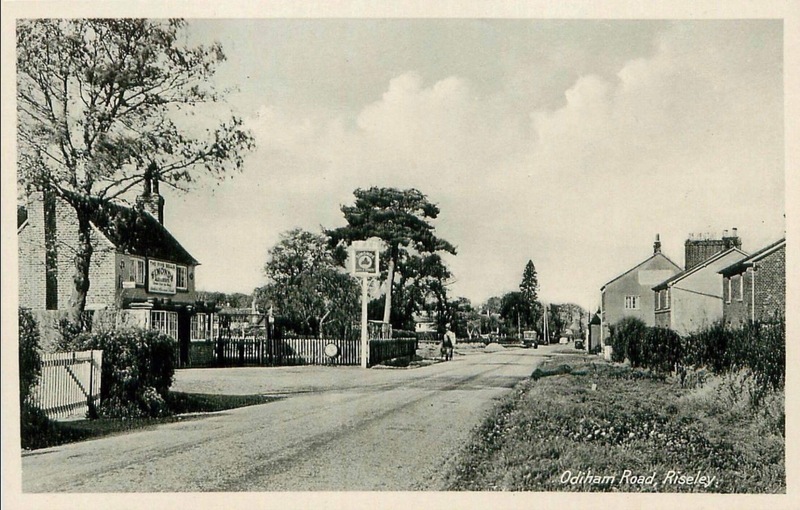 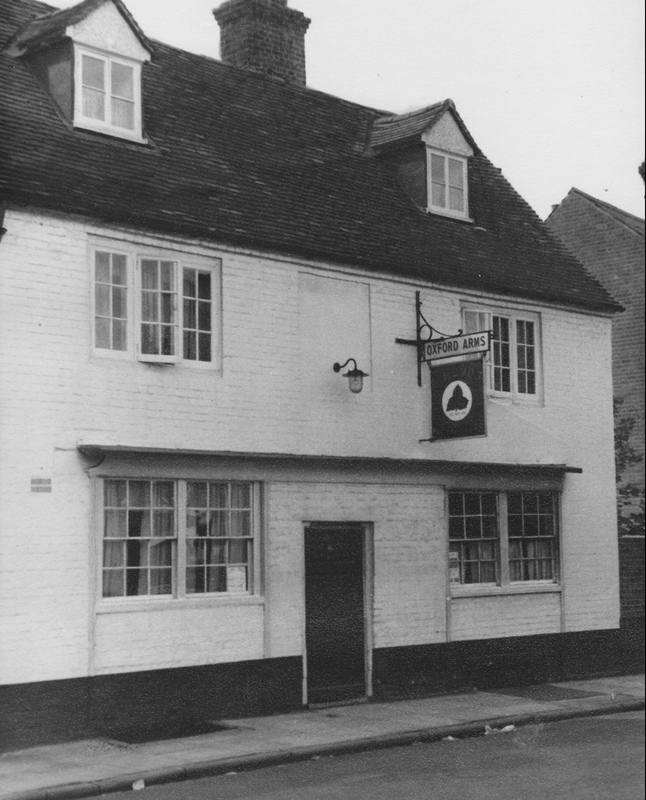 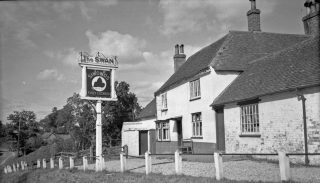 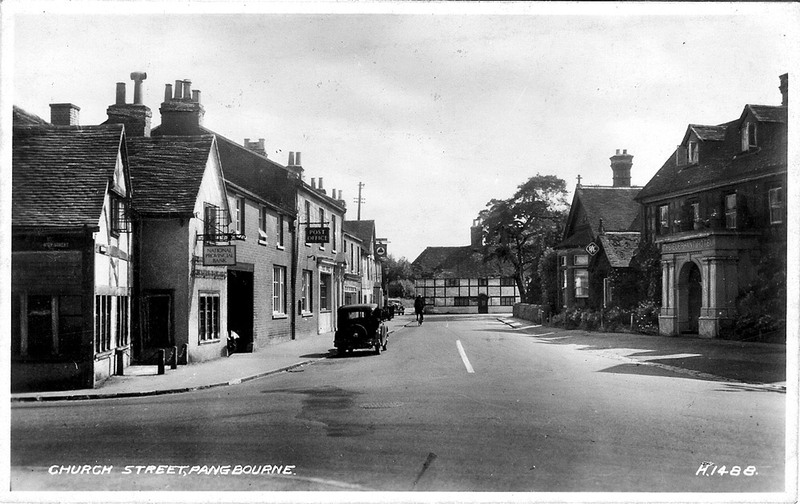 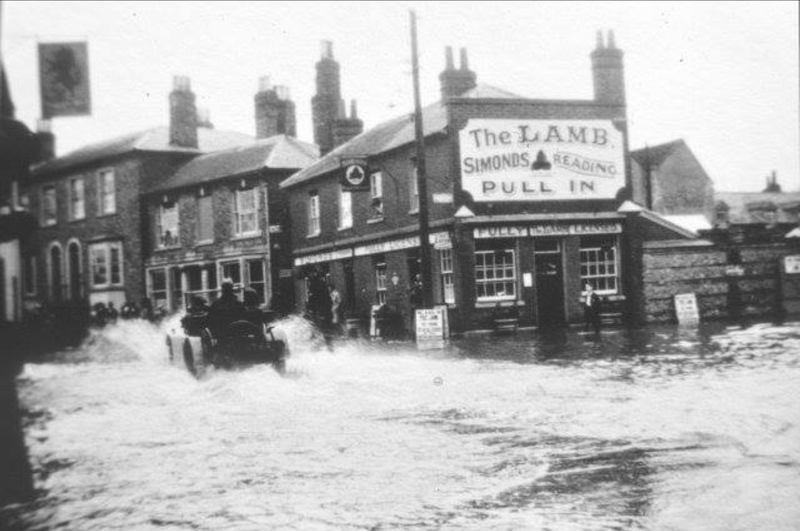 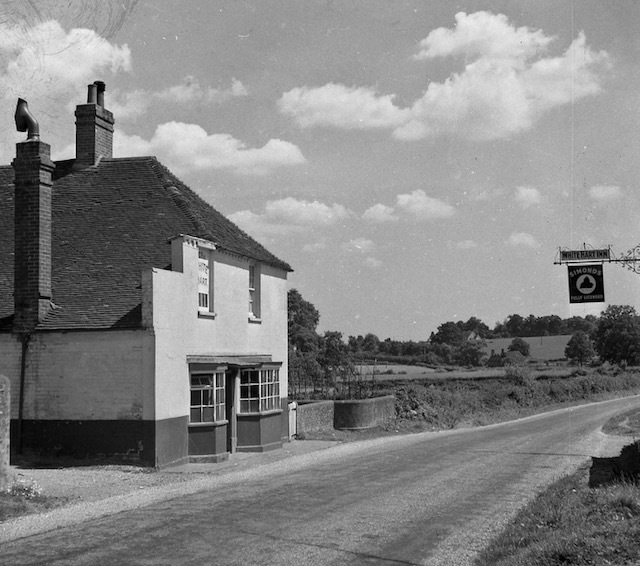 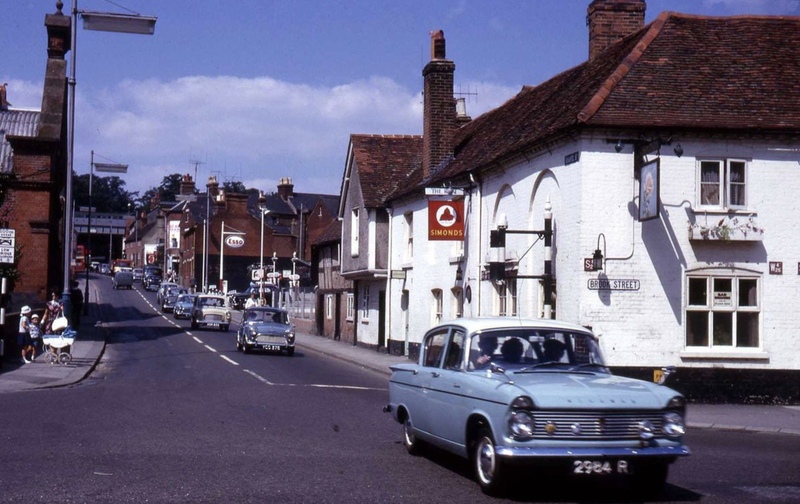 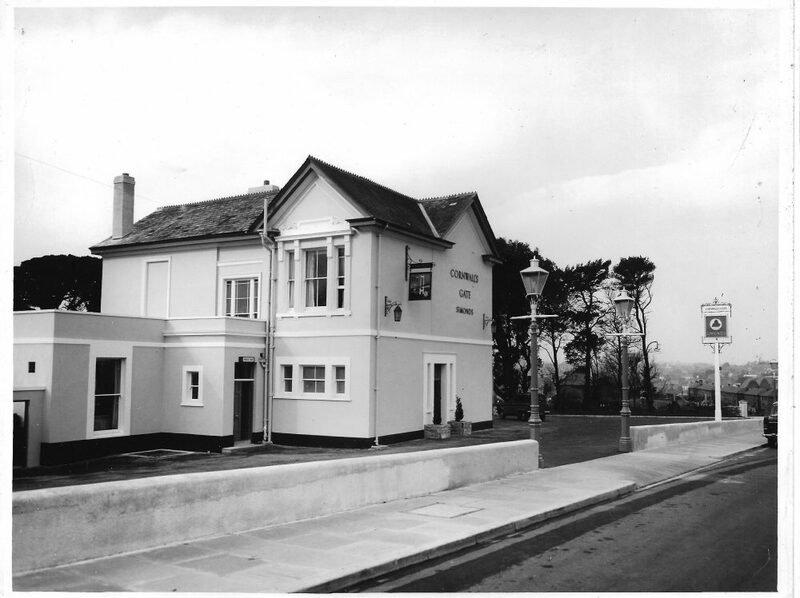 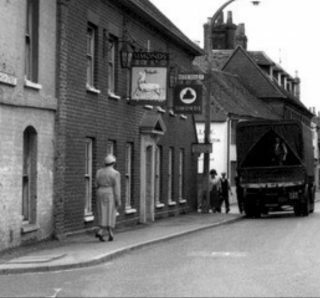 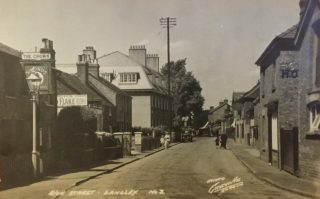 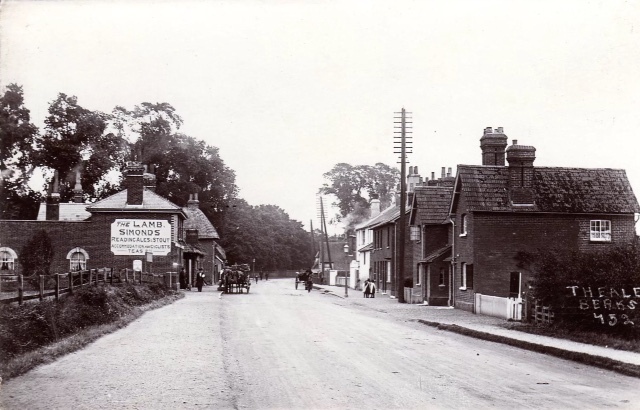 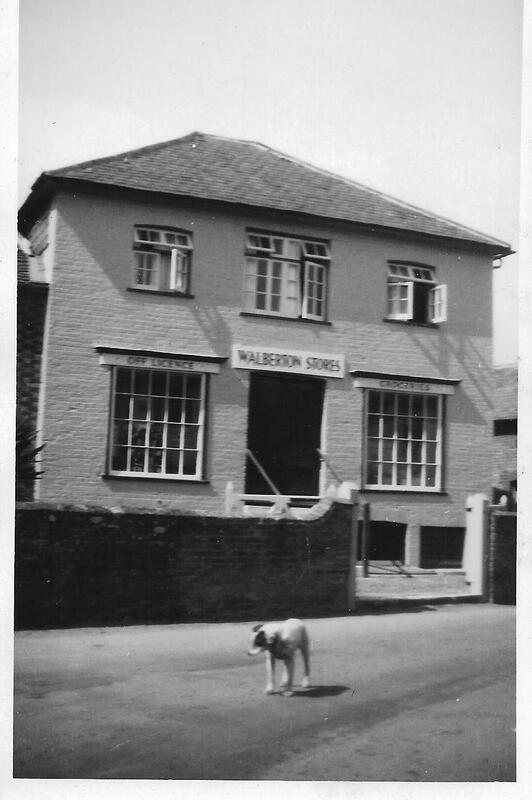 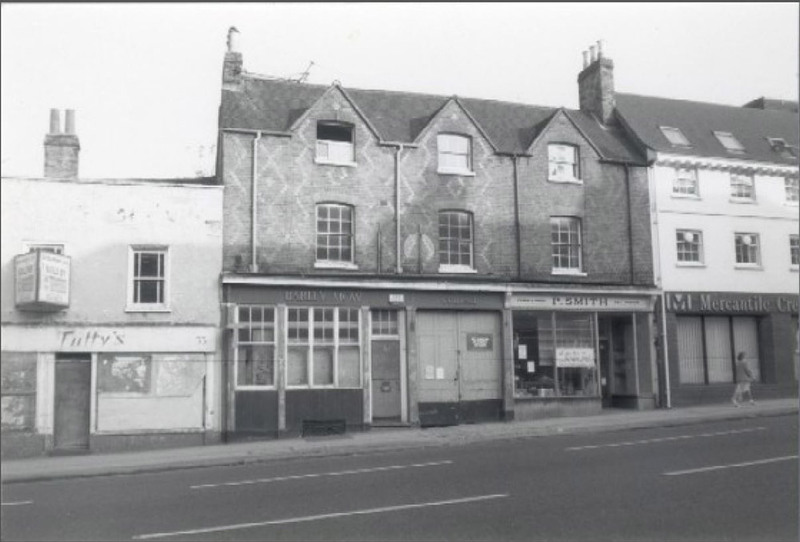 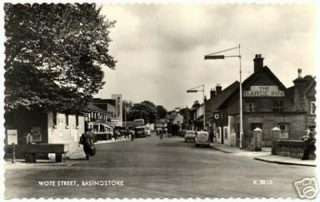 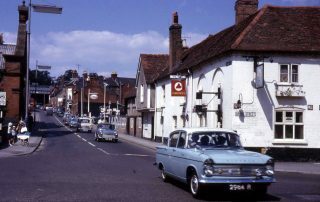 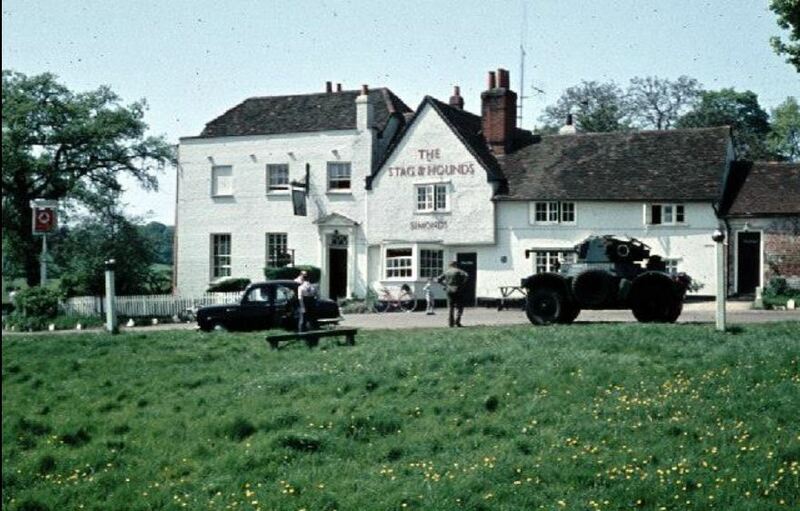 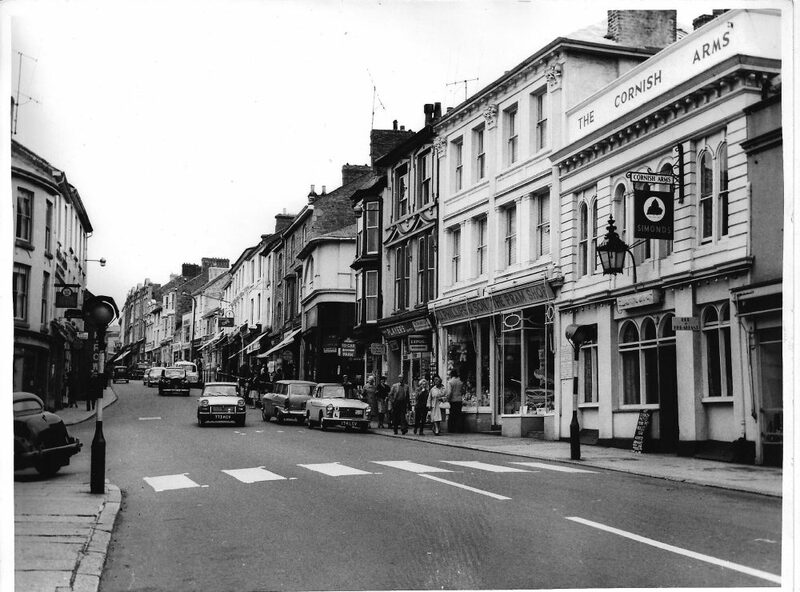 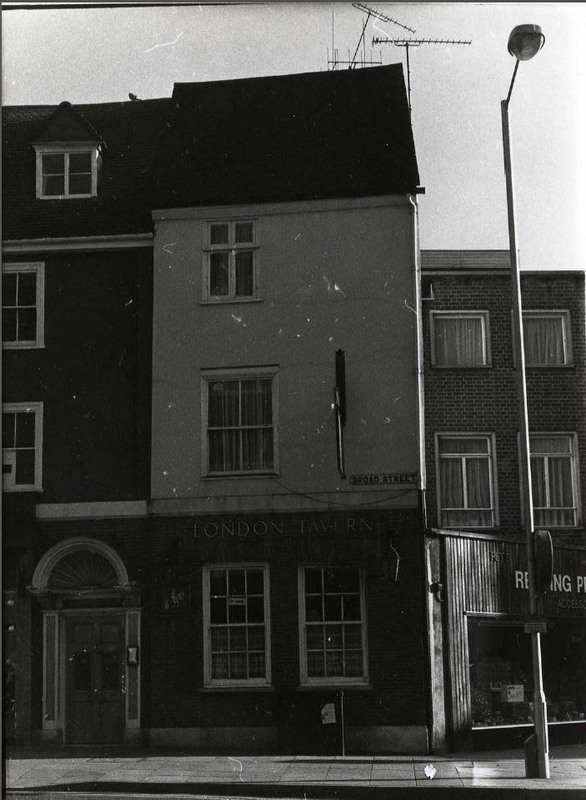 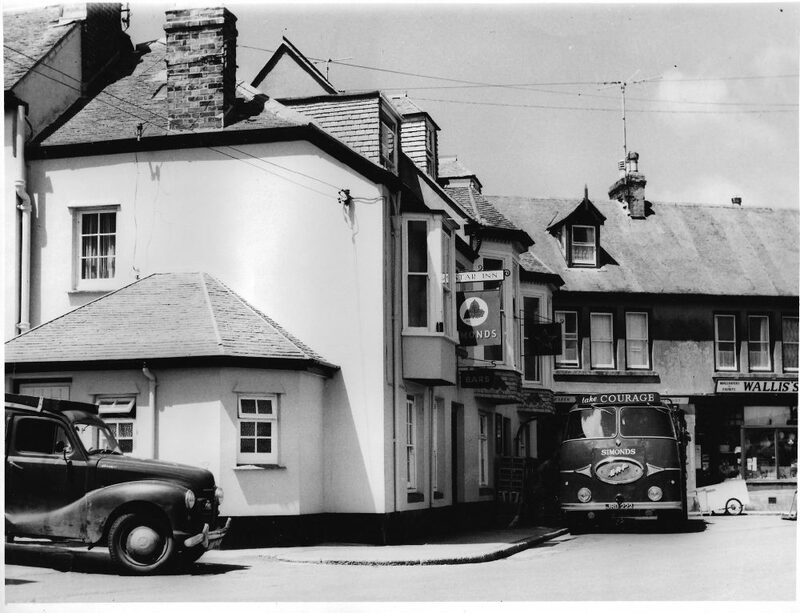 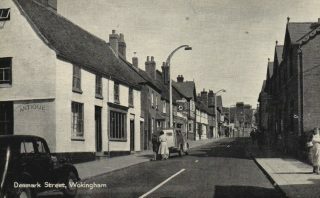 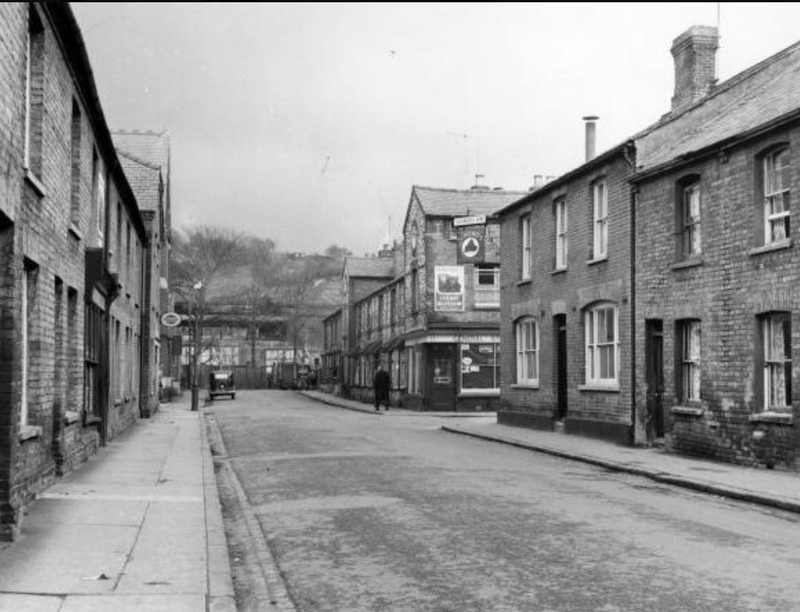 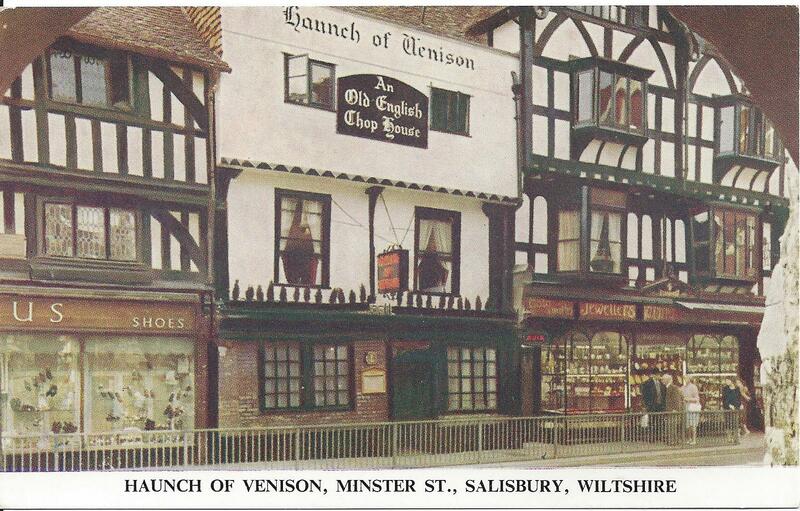 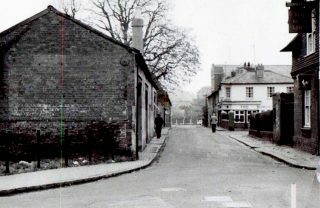 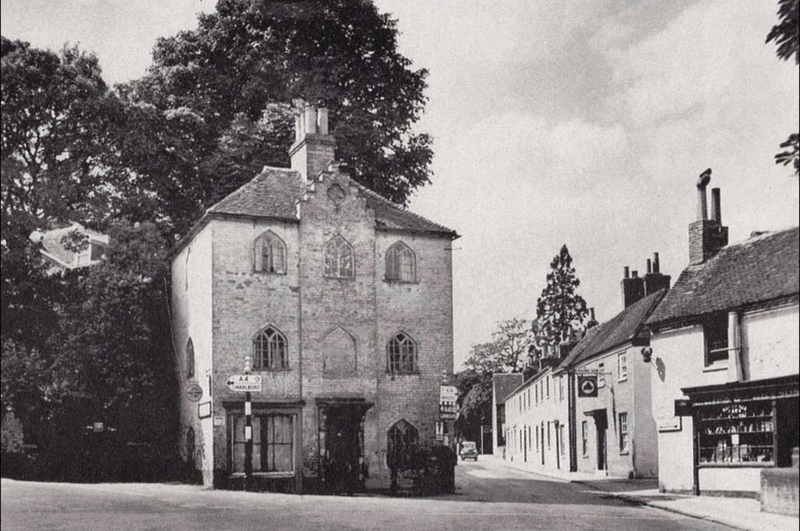 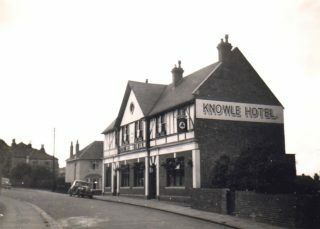 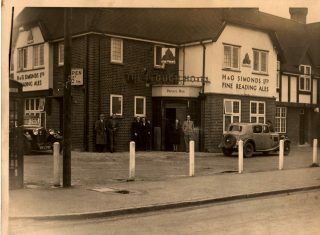 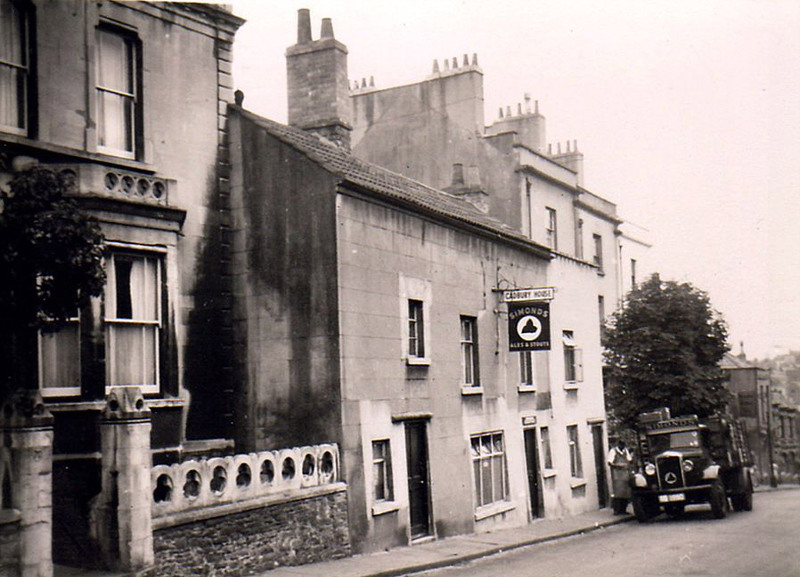 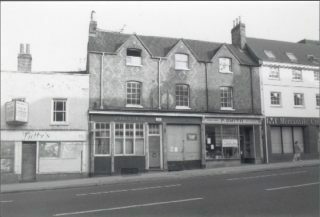 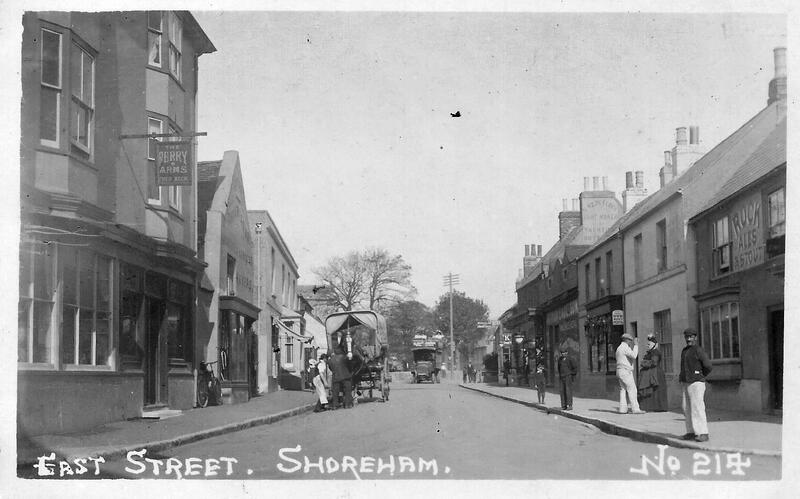 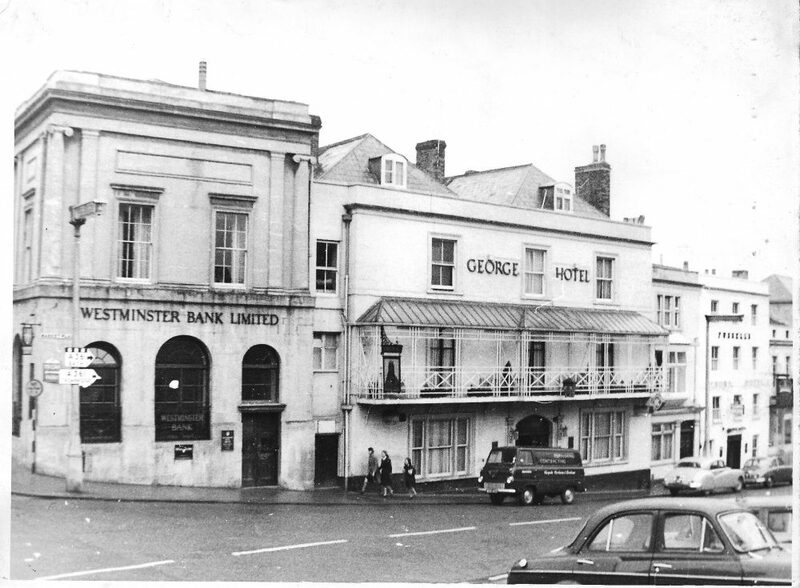 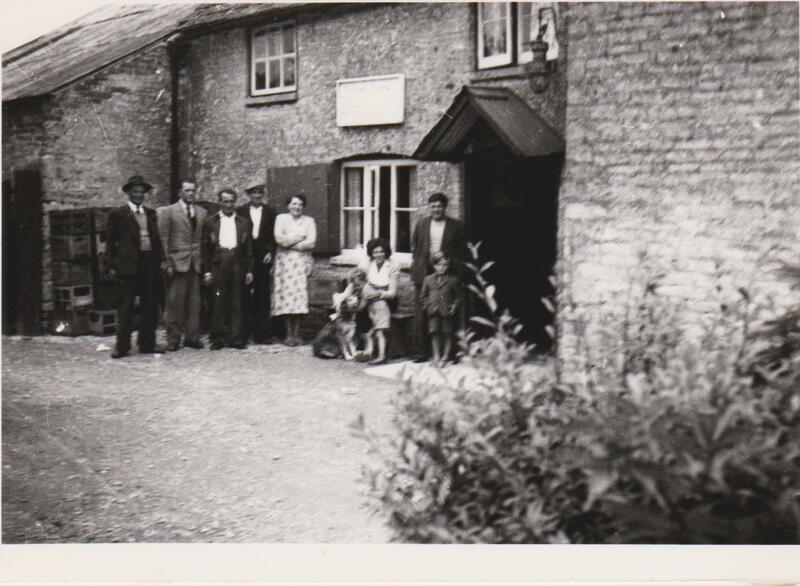 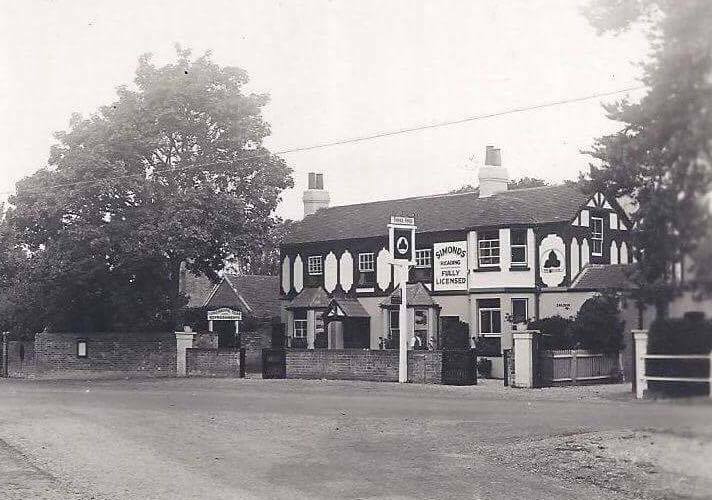 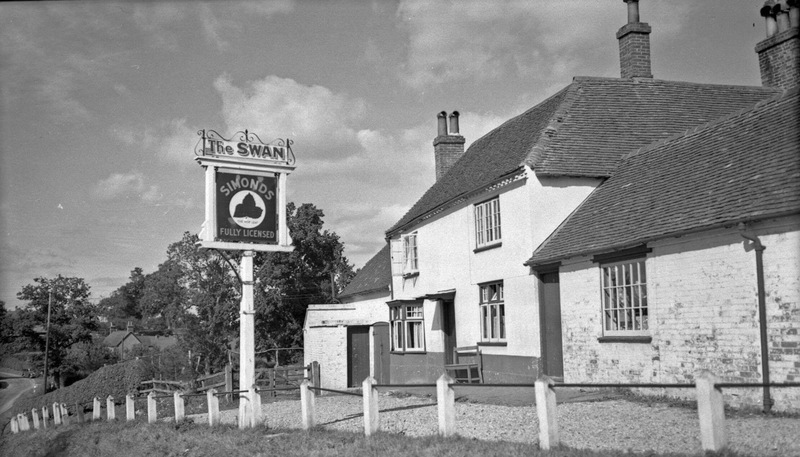 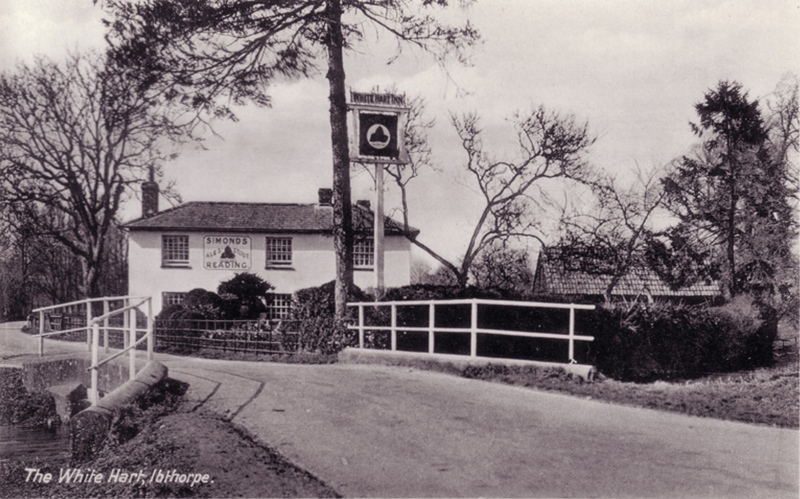 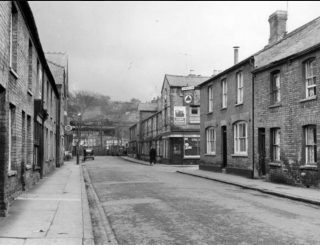 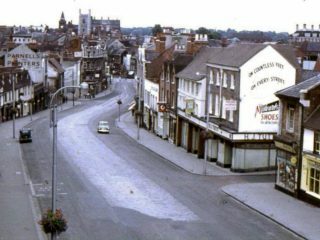 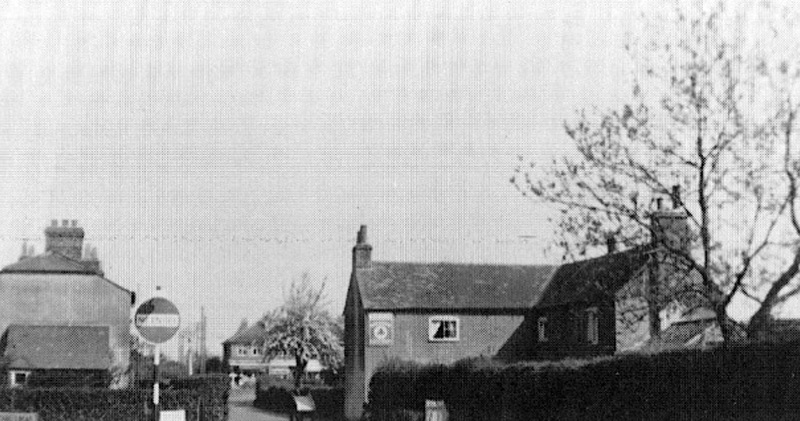 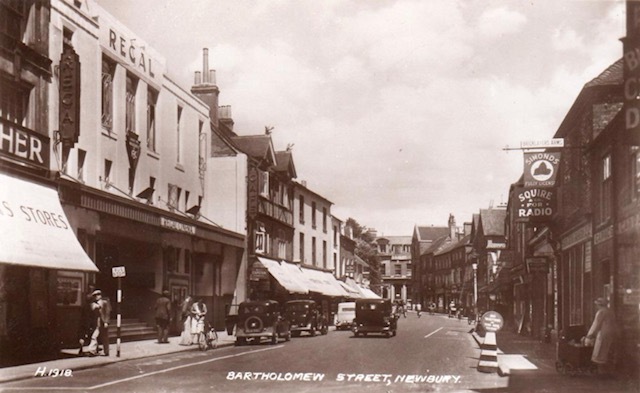 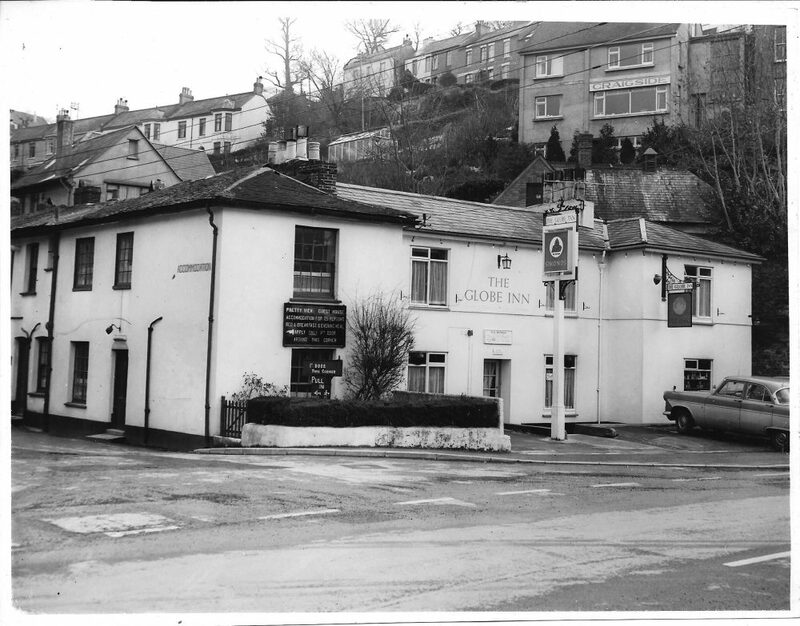 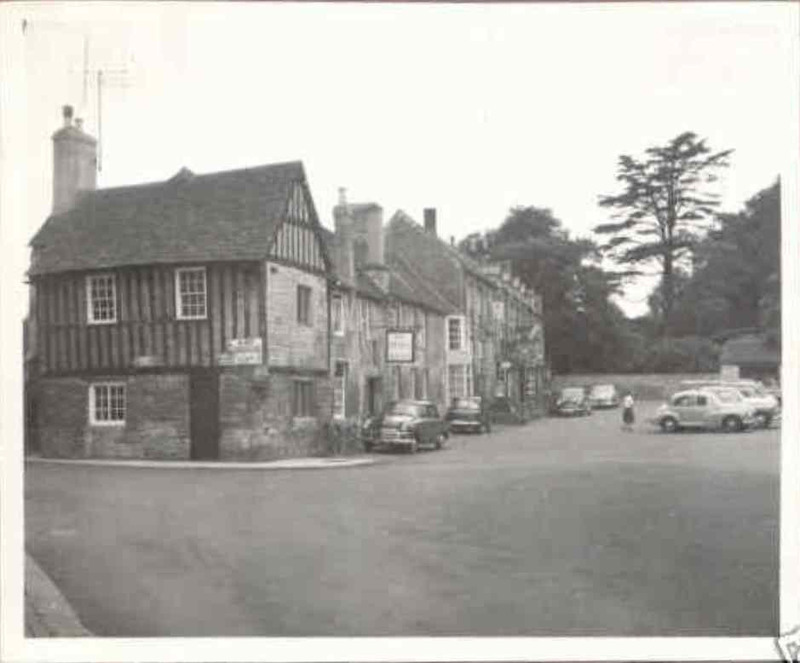 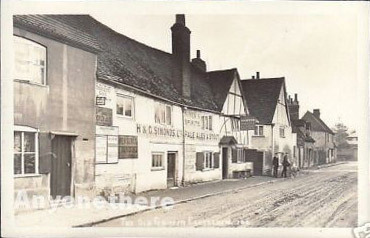 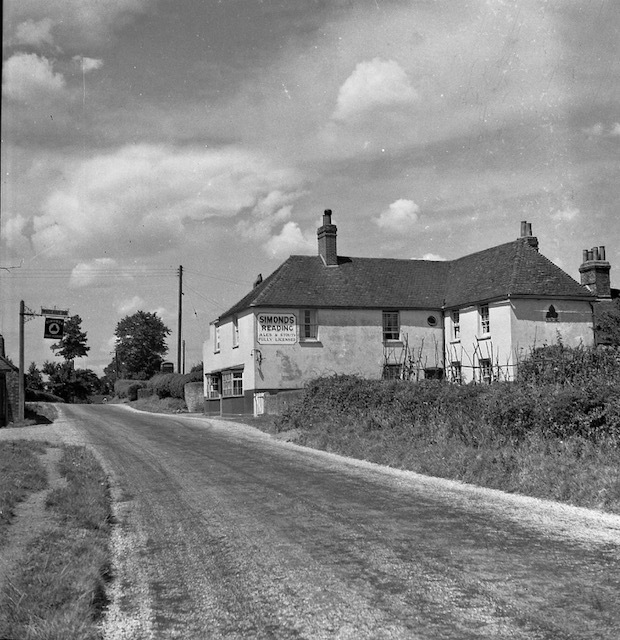 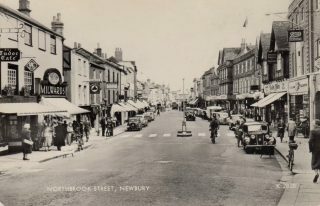 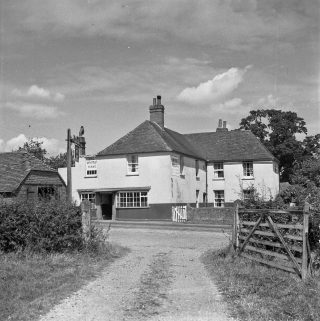 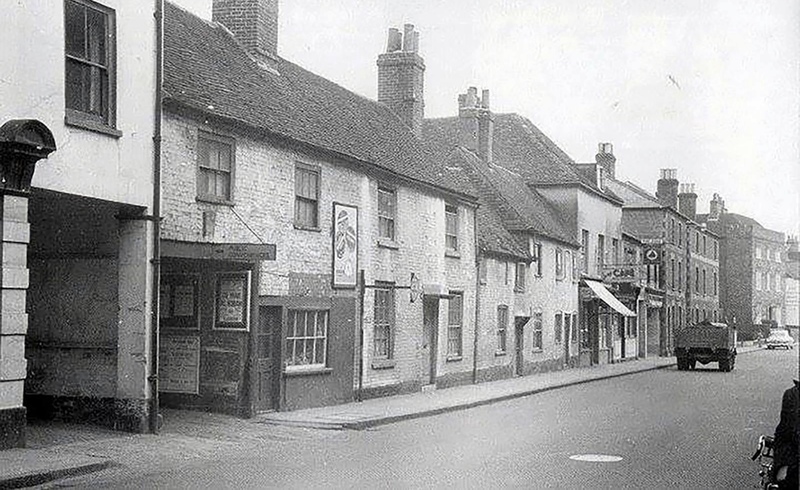 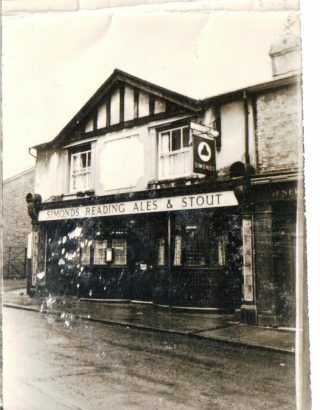 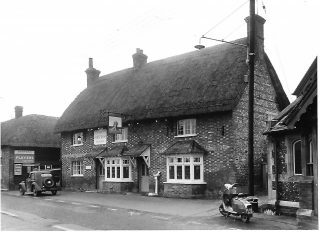 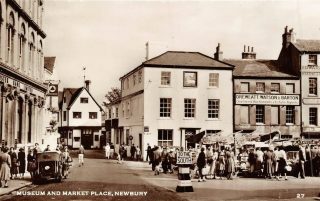 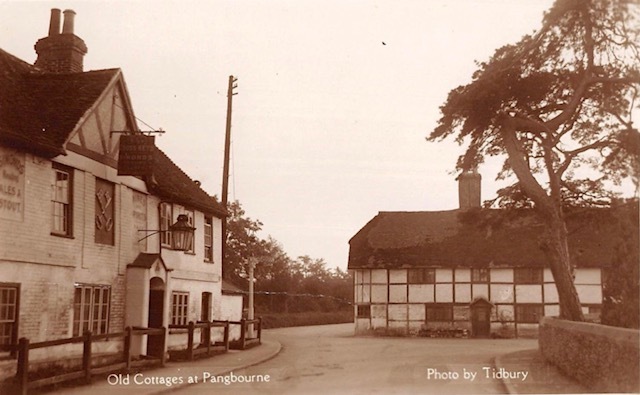 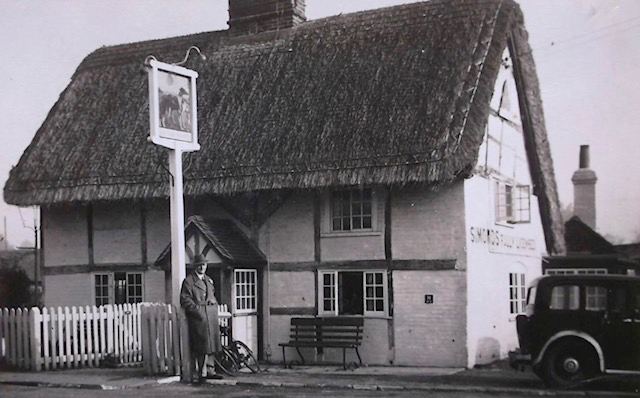 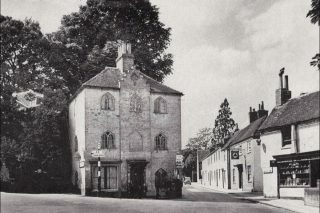 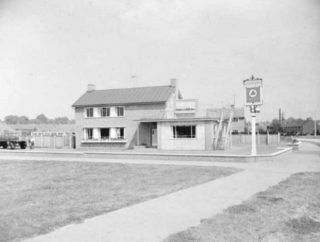 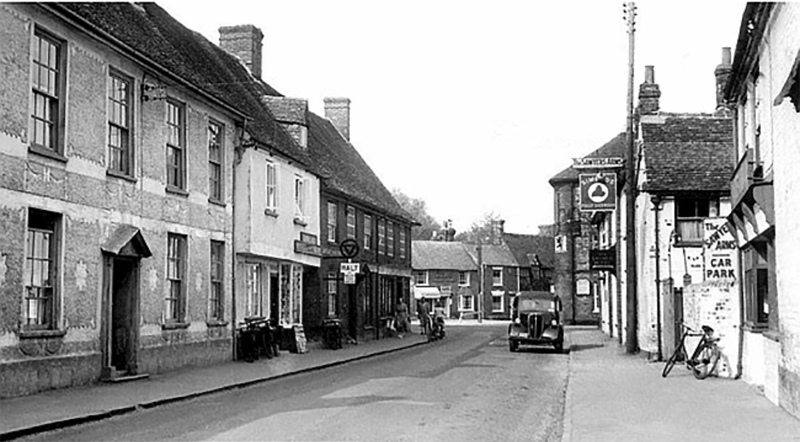 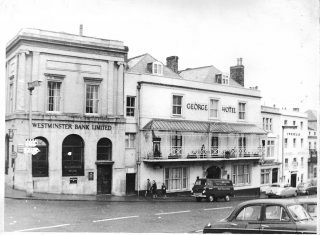 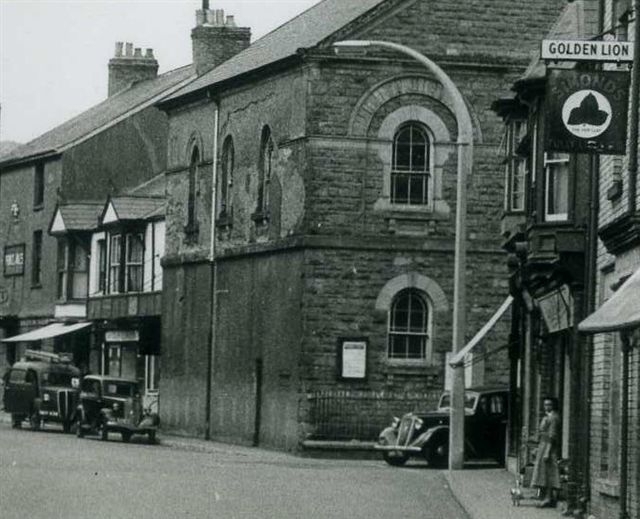 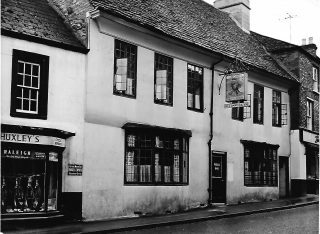 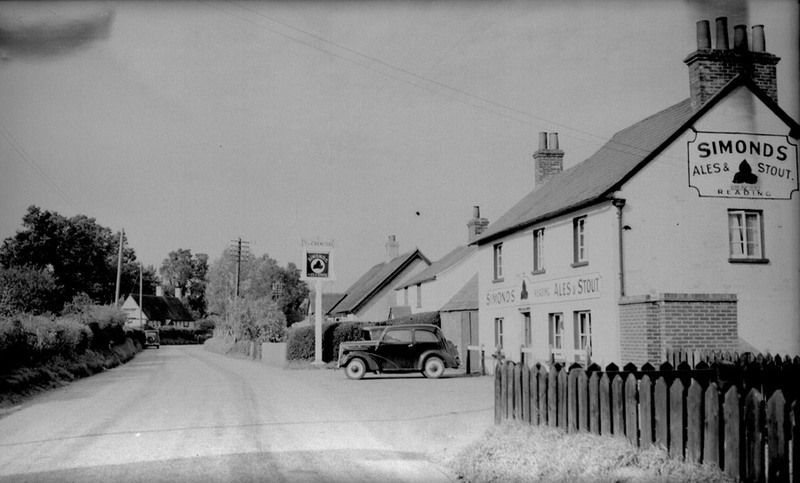 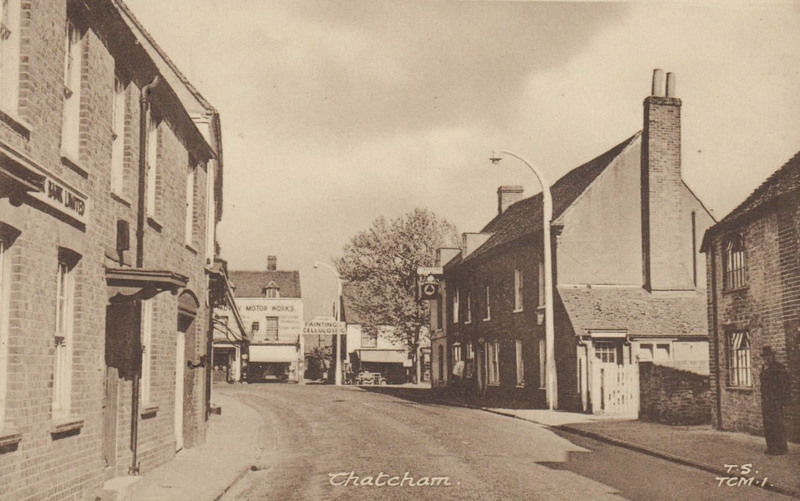 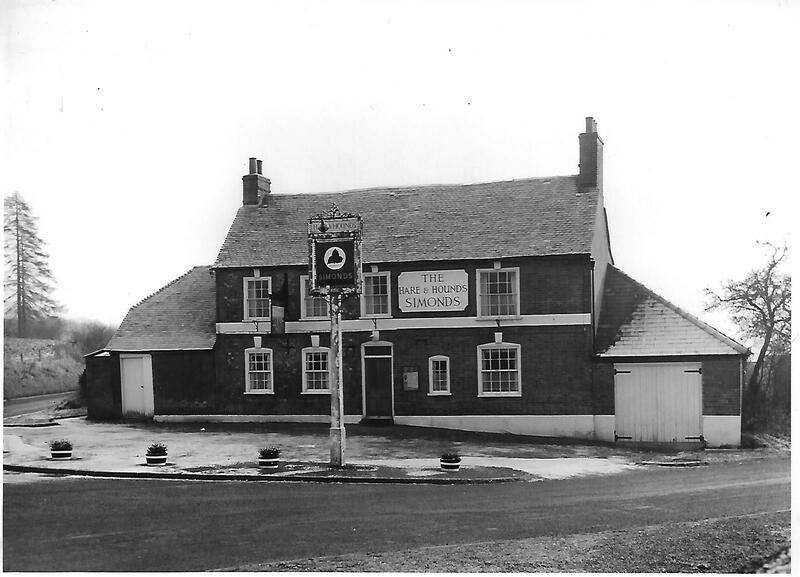 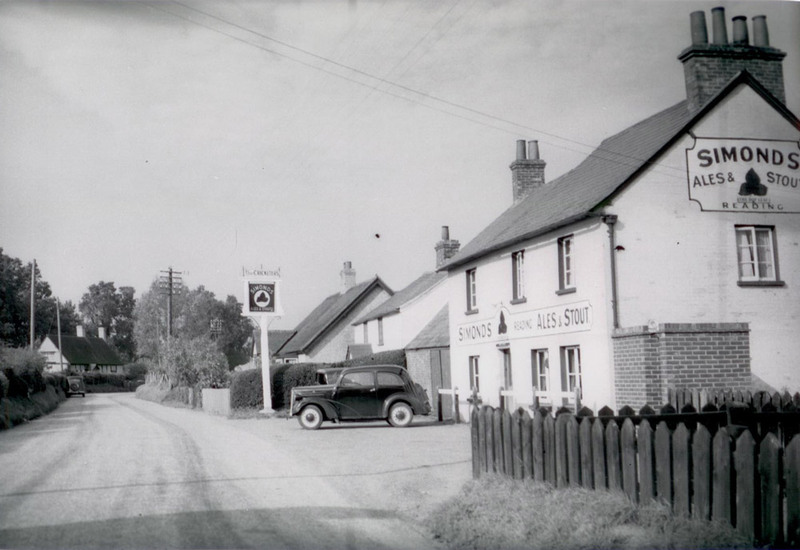 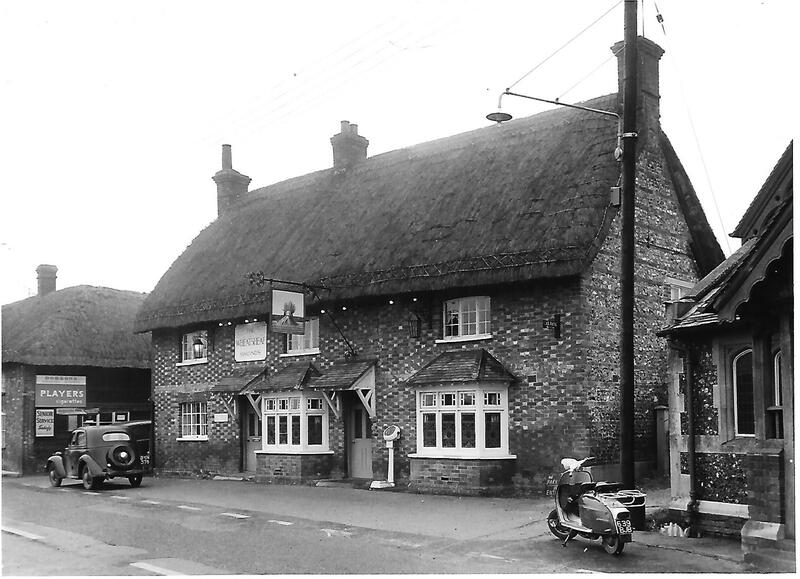 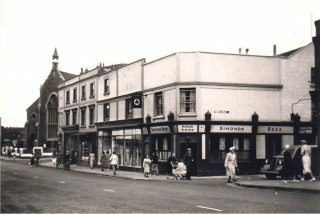 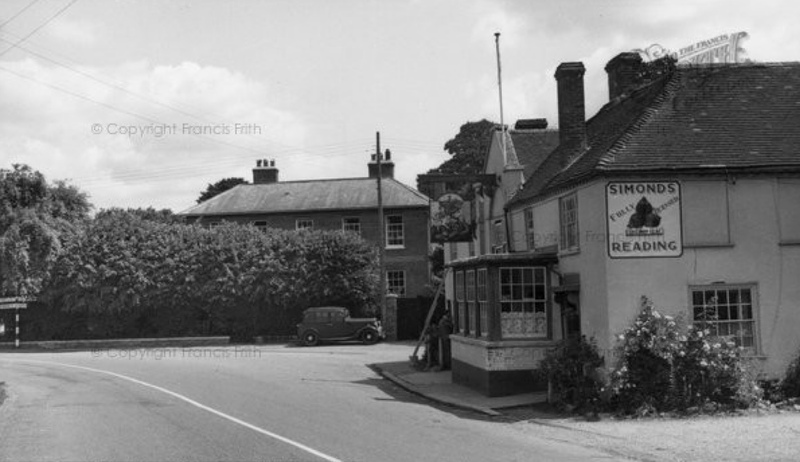 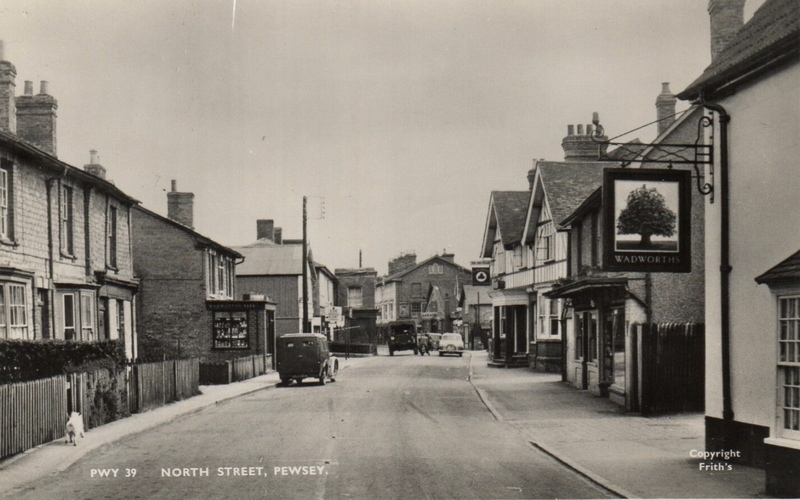 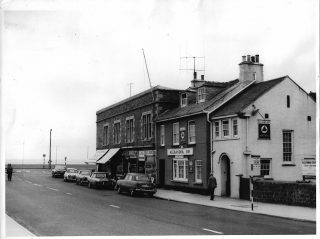 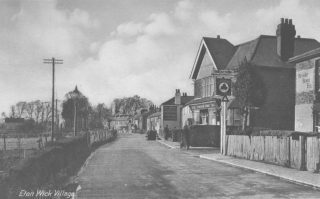 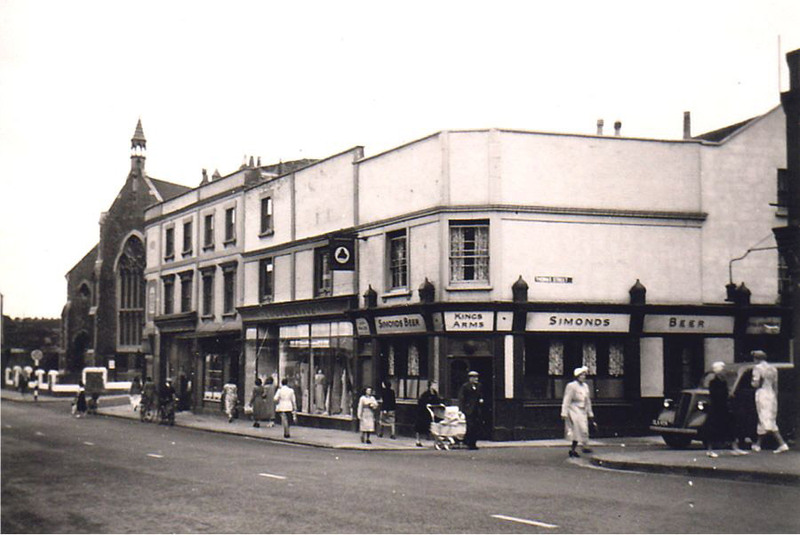 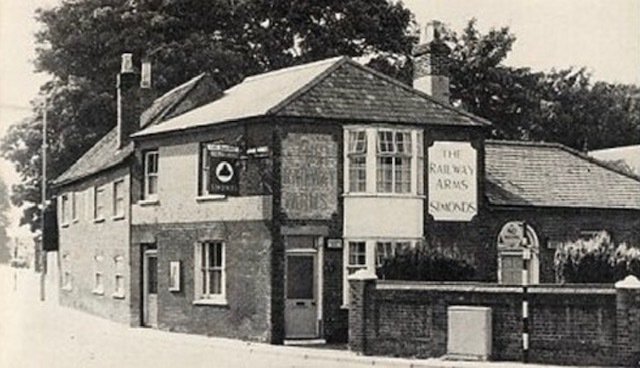 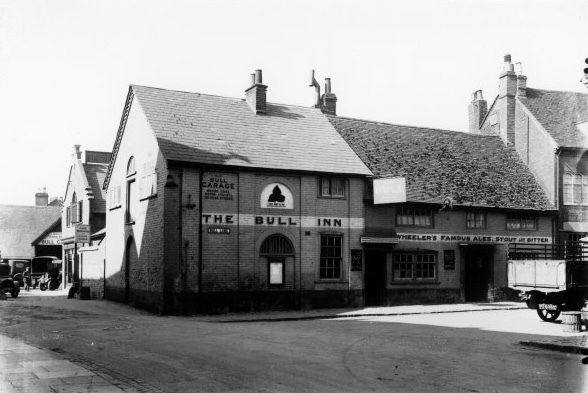 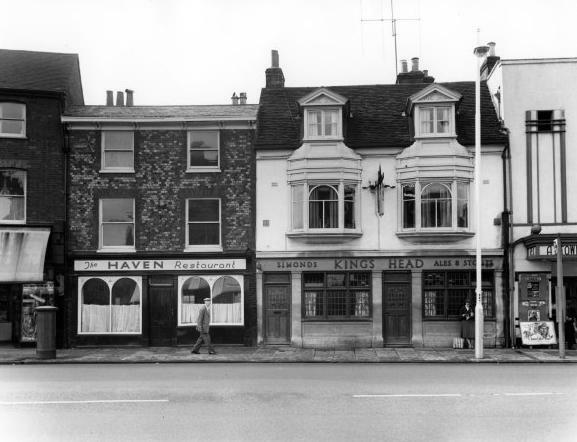 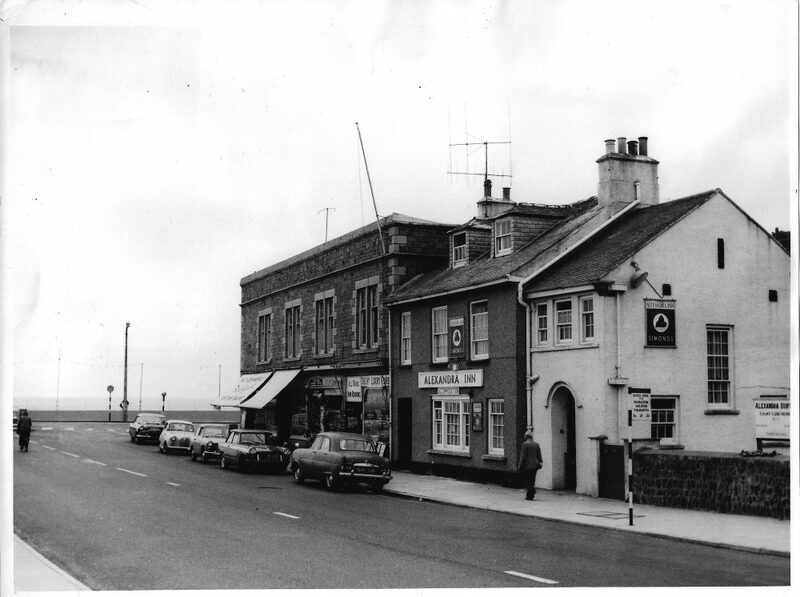 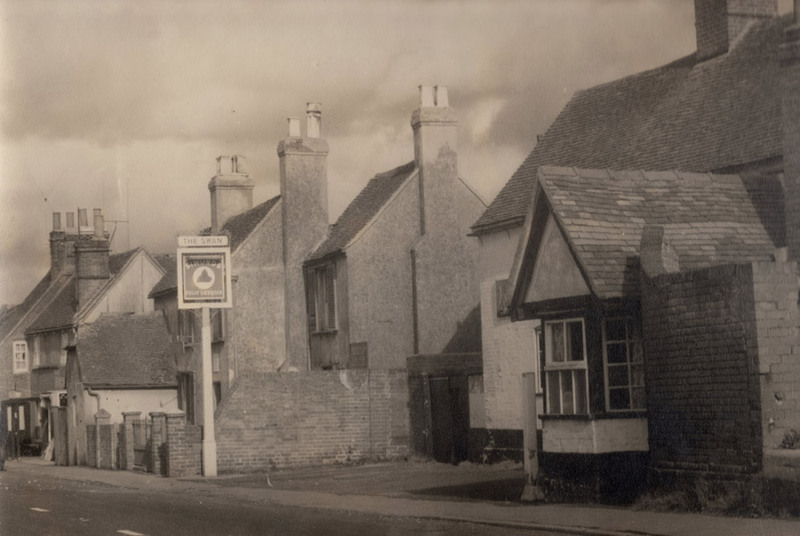 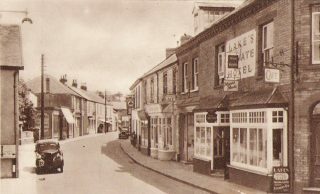 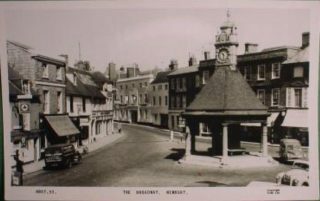 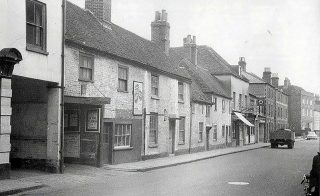 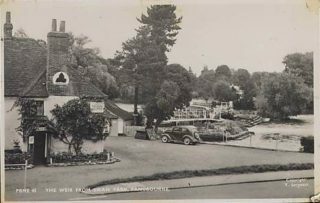 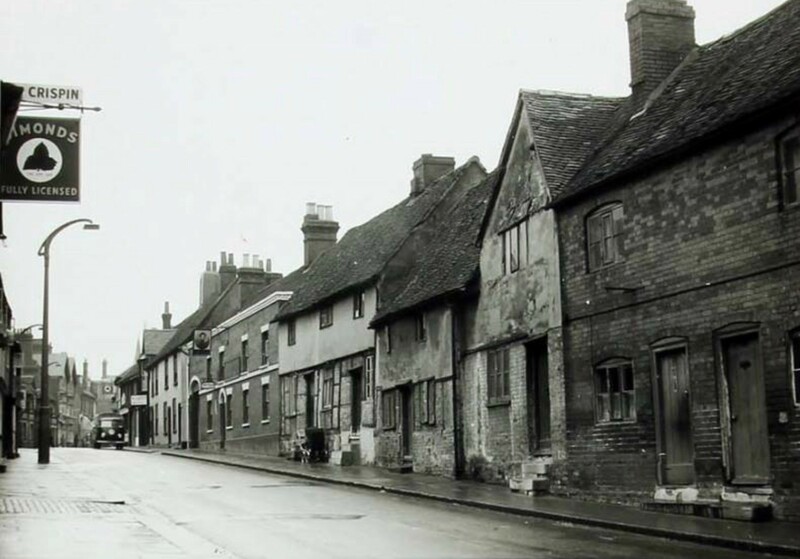 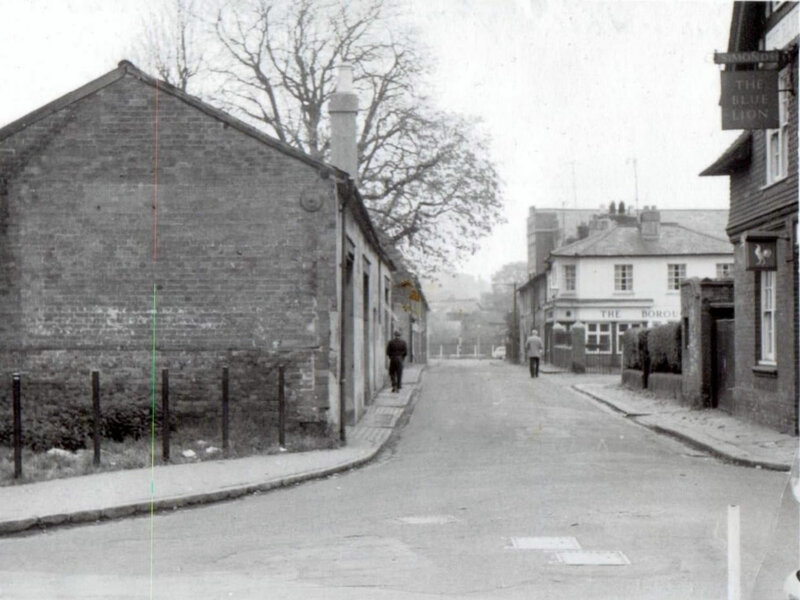 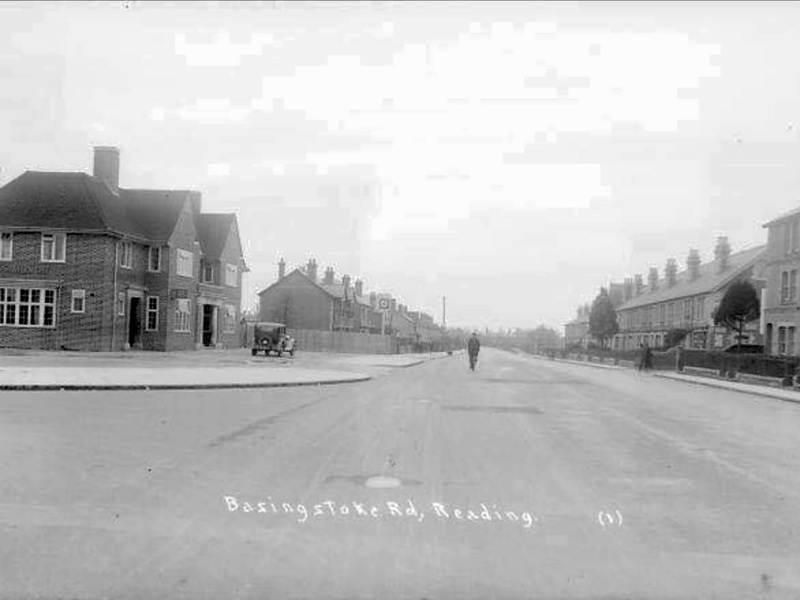 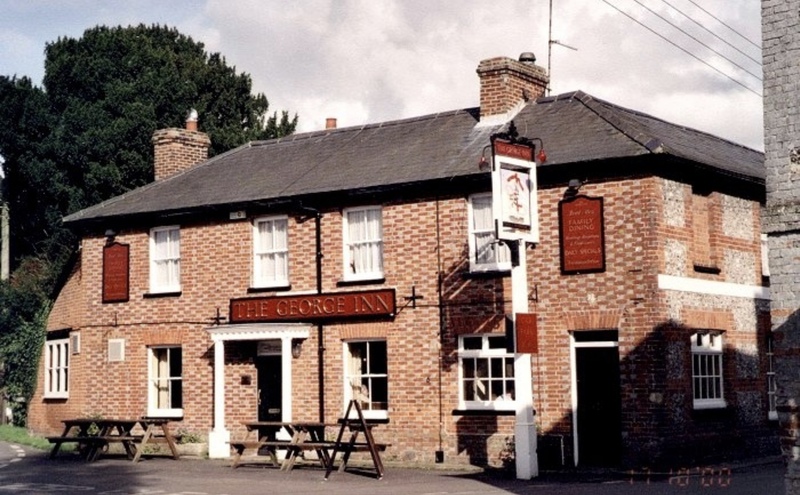 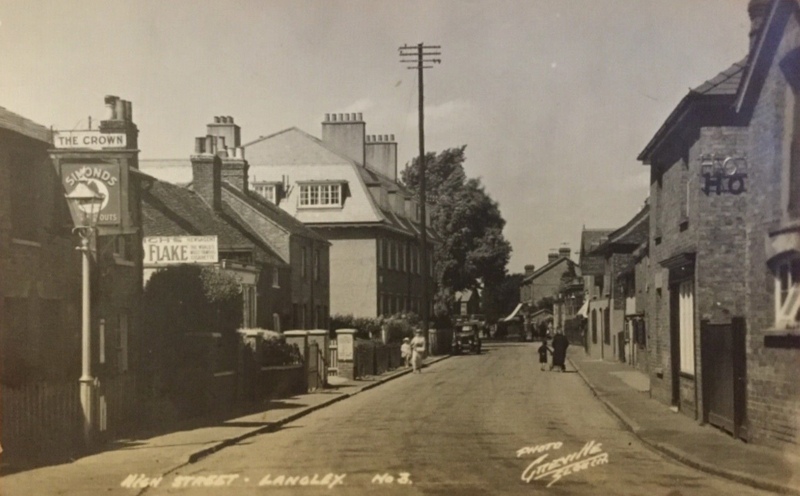 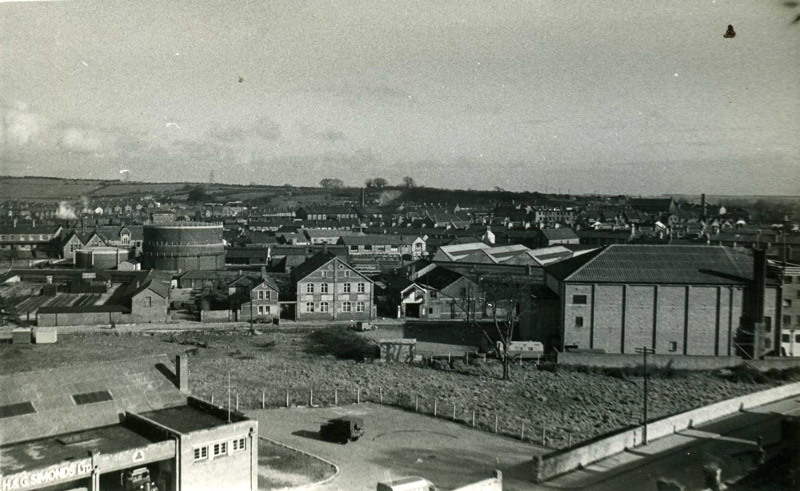 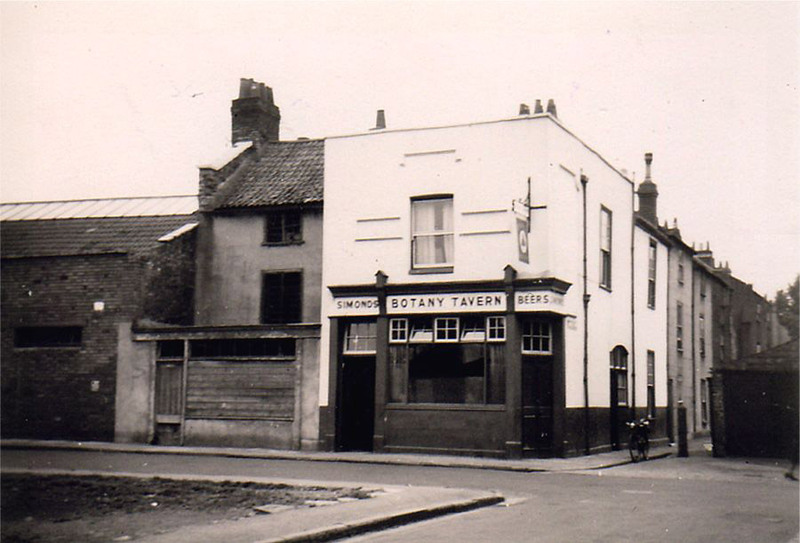 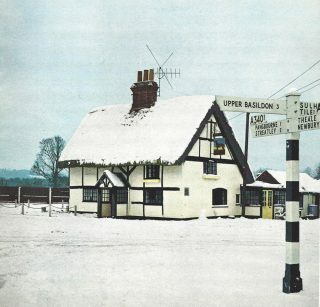 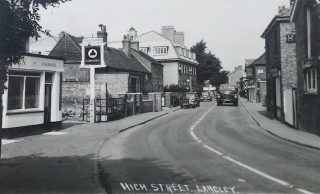 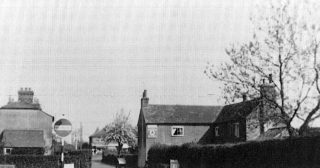 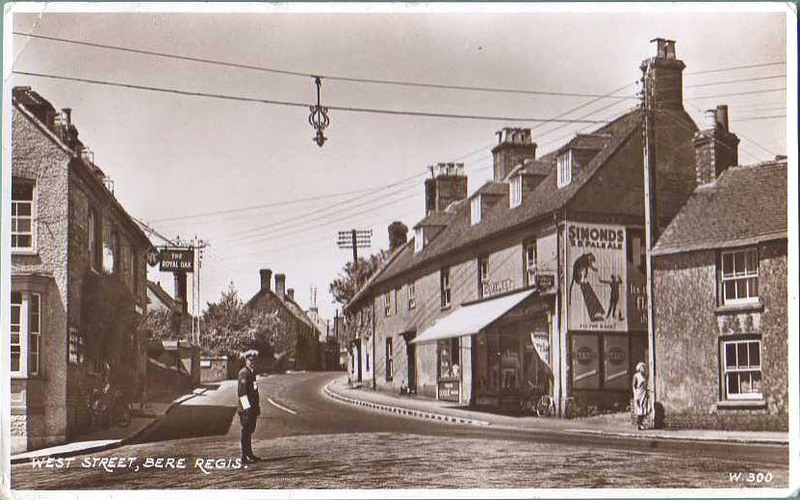 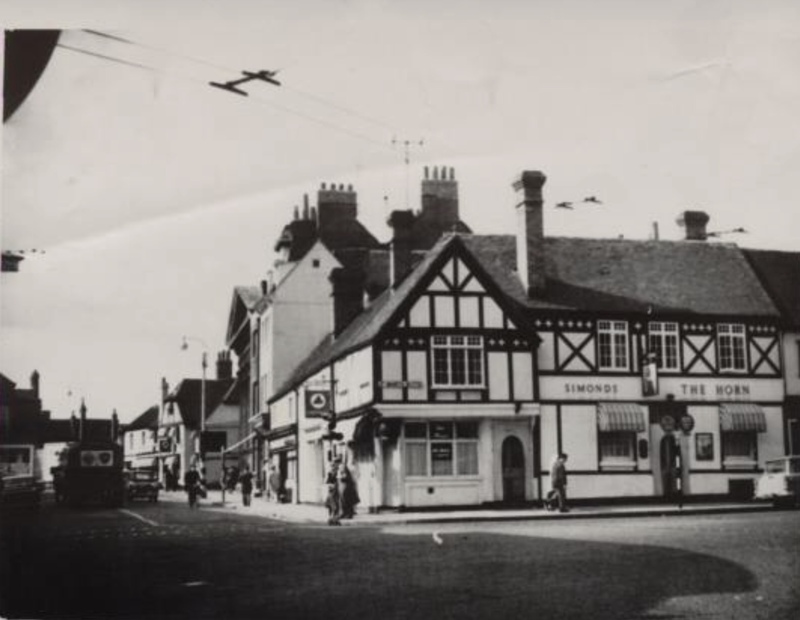 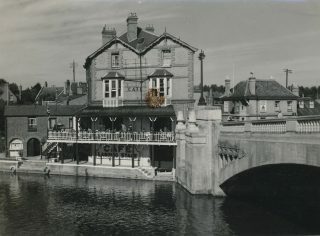 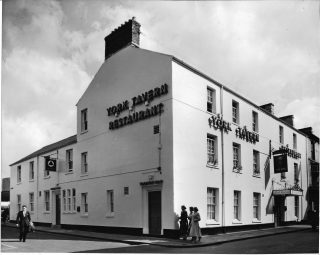 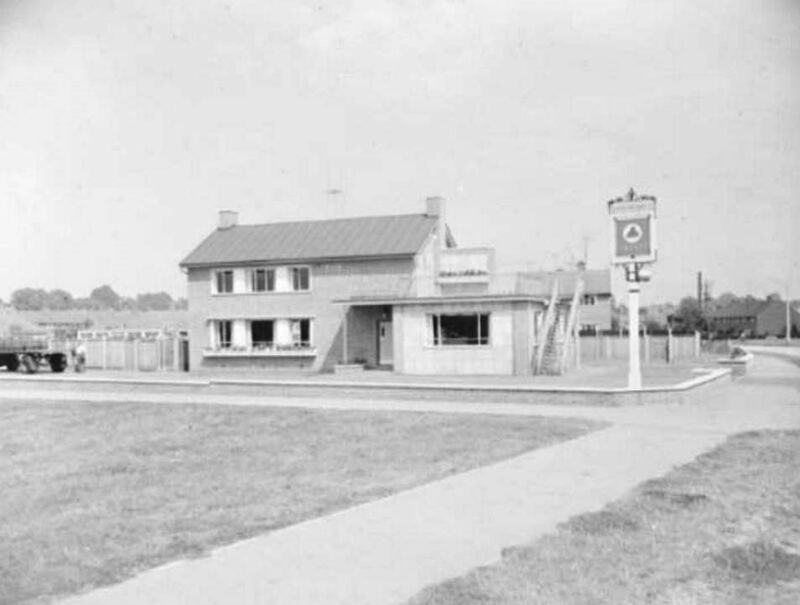 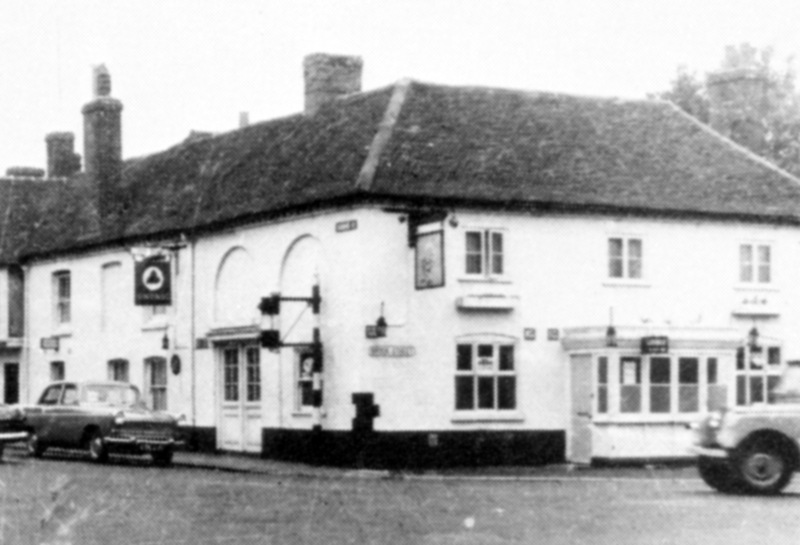 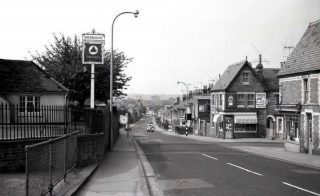 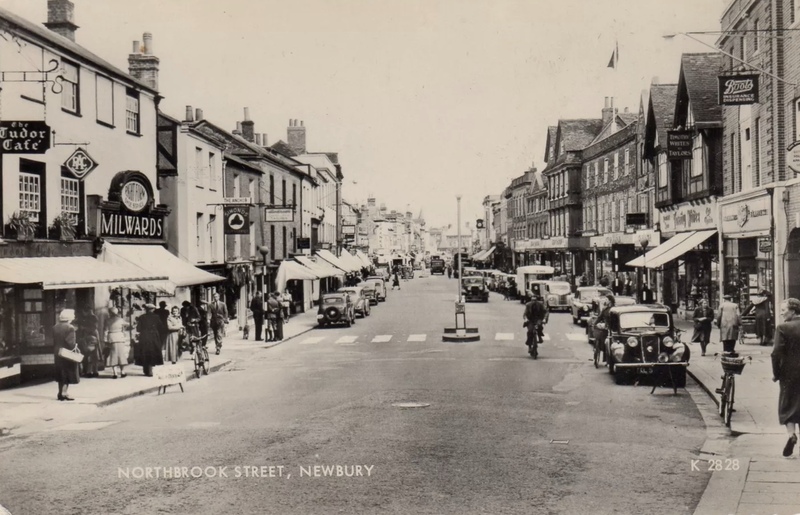 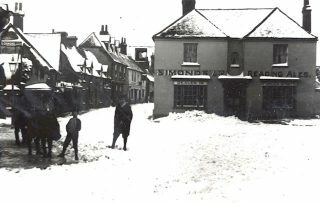 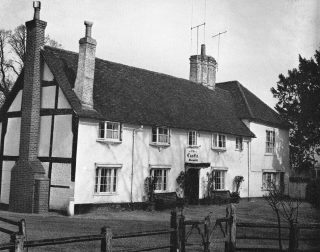 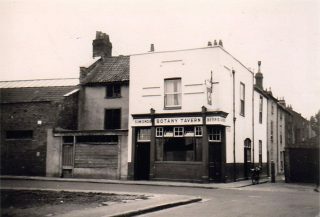 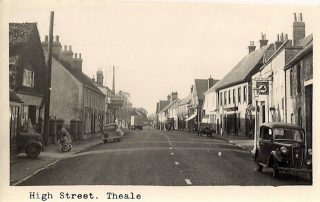 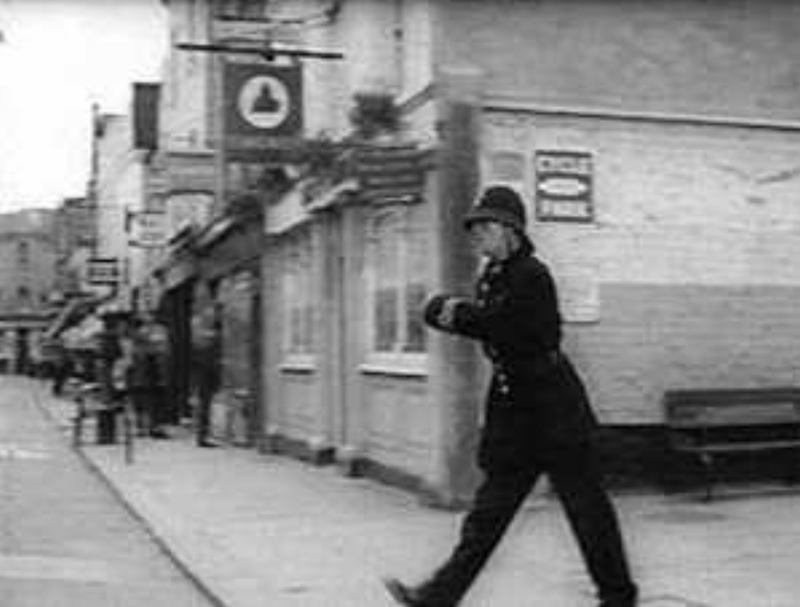 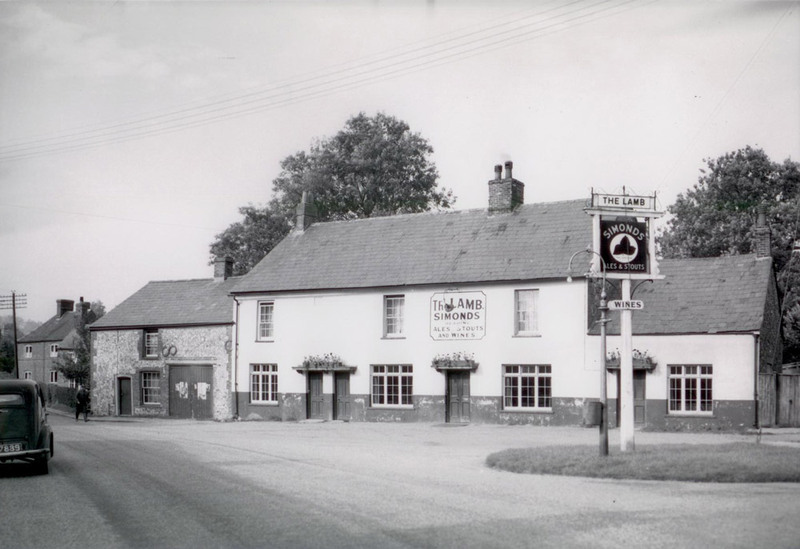 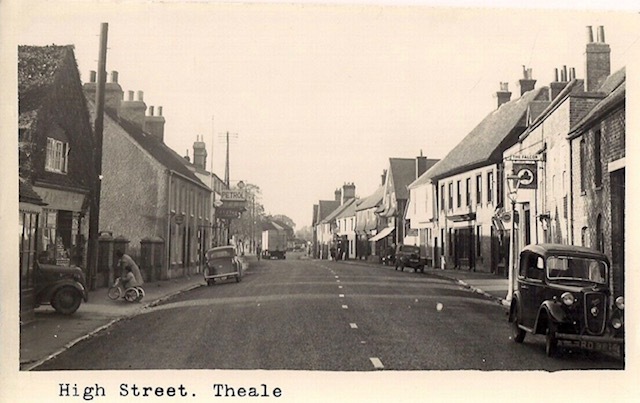 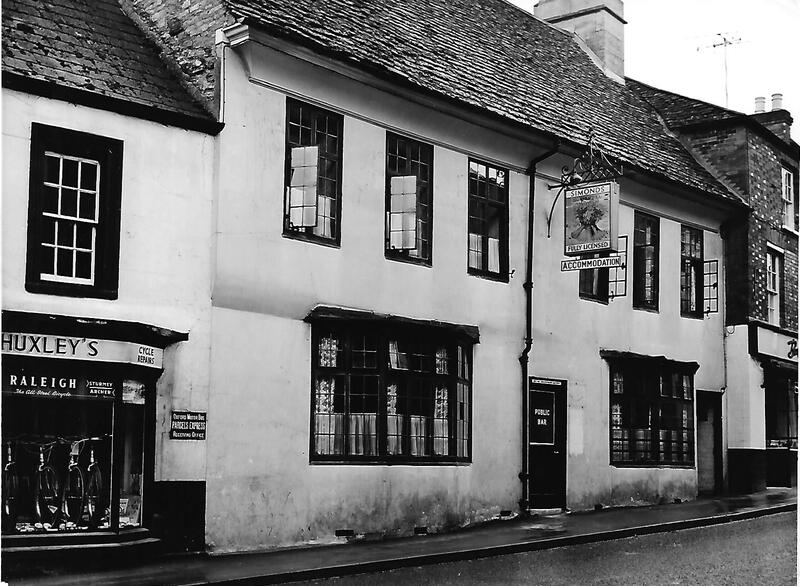 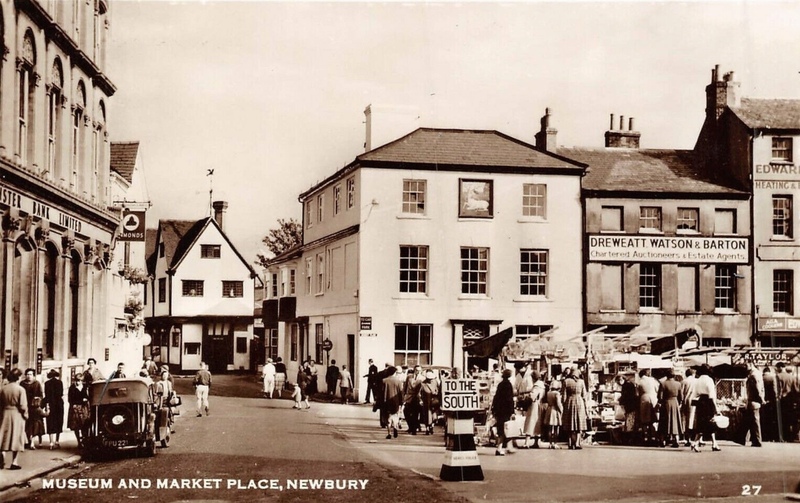 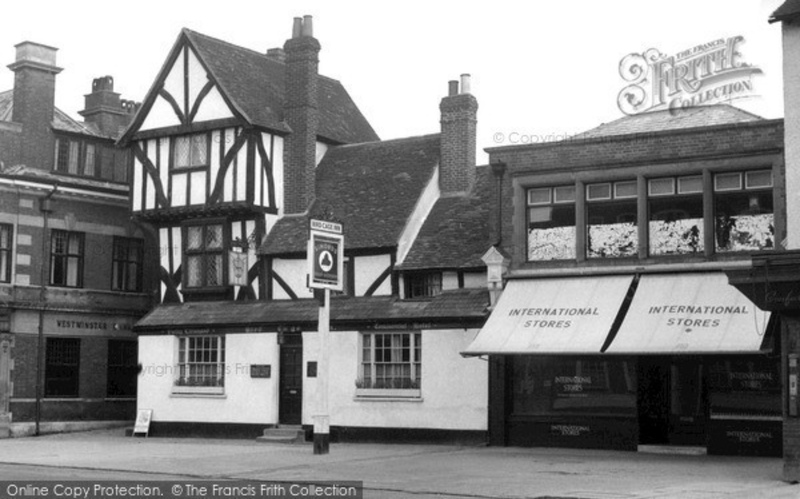 Basingstoke, Bunnian Place, The Queens Arms 1965. 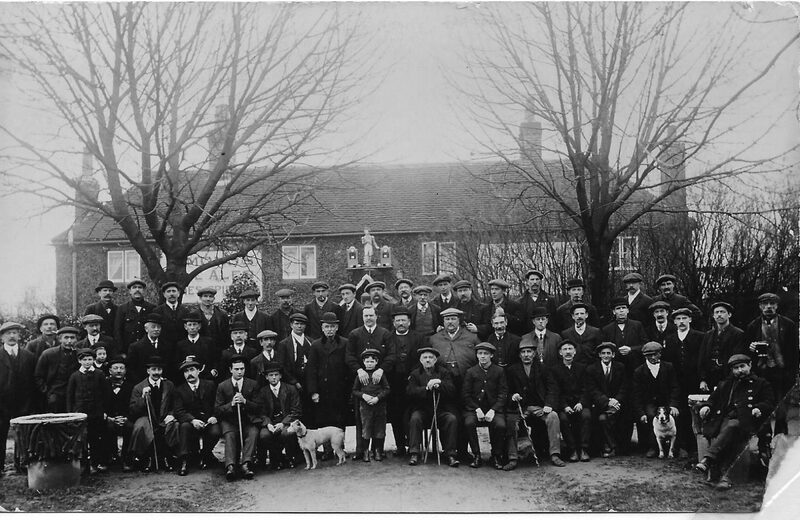 Labelled The Fox, Cane End but seems to be The Pack Saddle at Chazey Heath ! 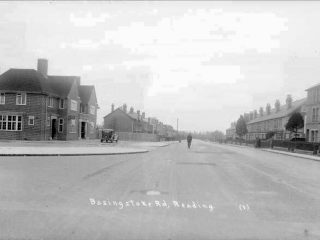 Reading, Bedford Rd. 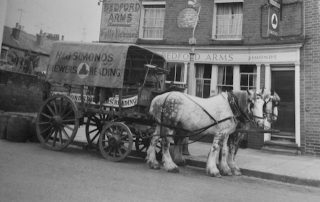 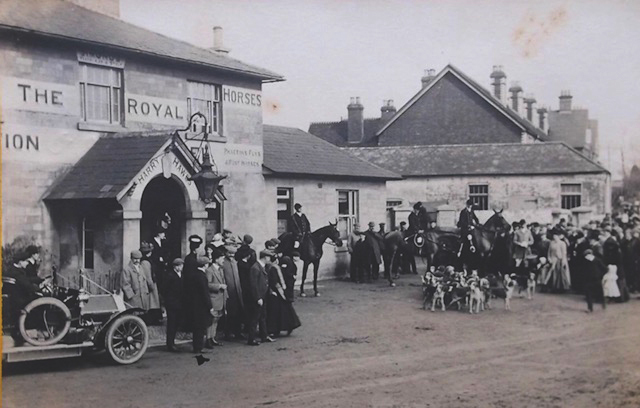 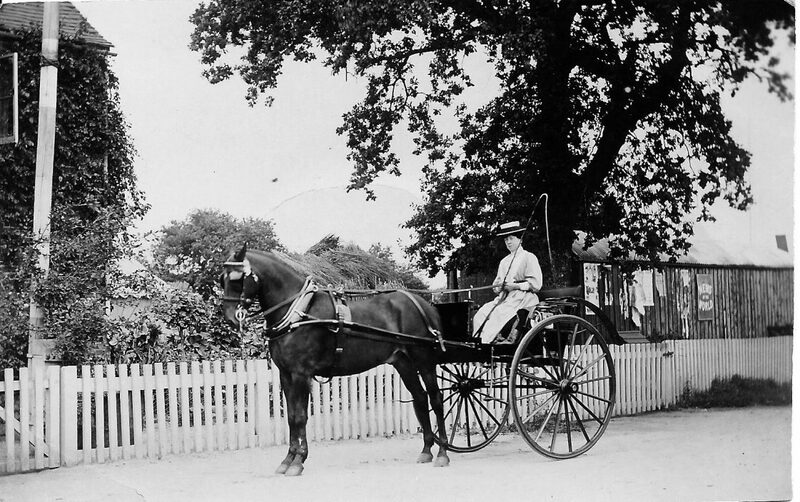 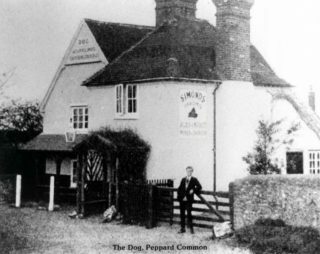 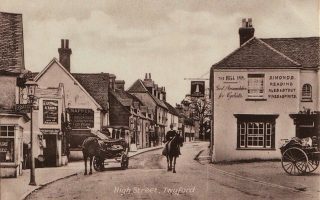 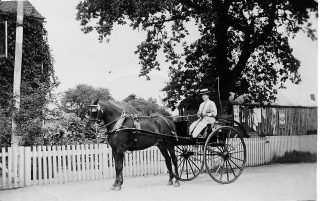 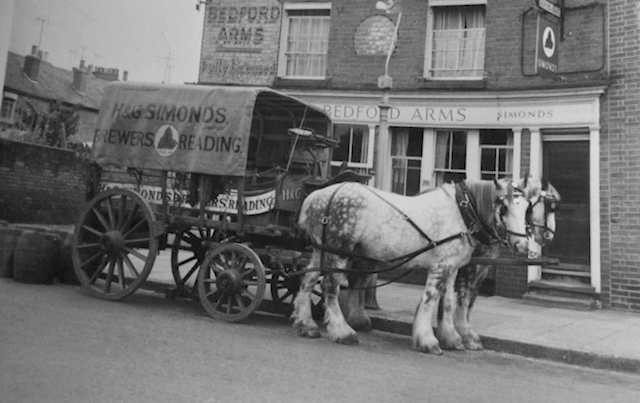 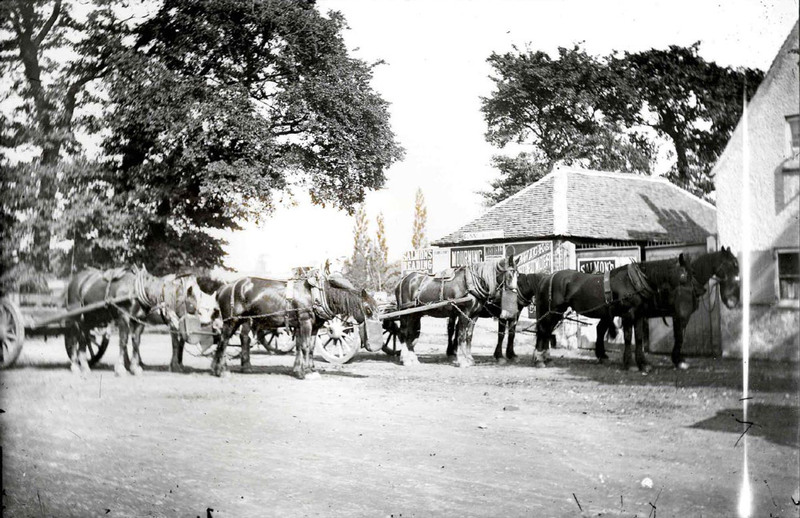 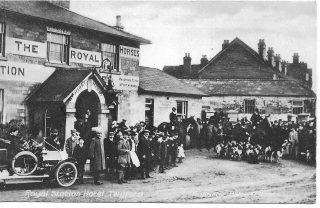 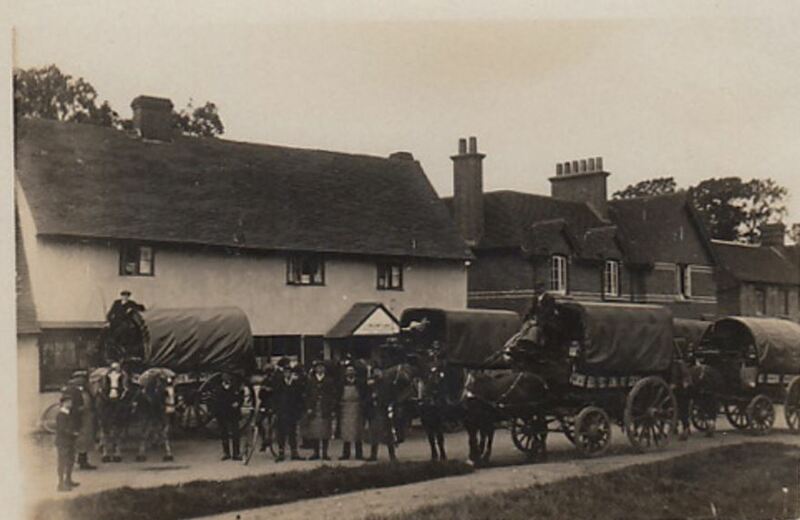 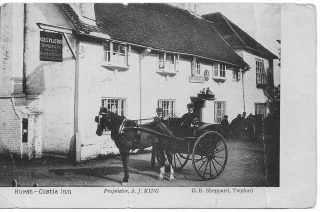 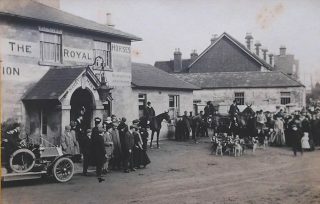 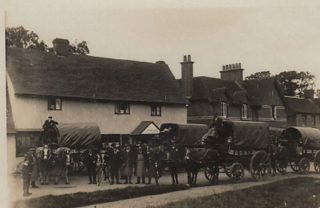 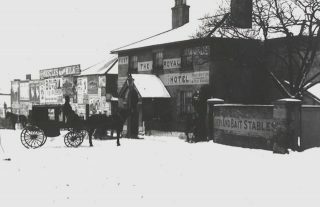 The Bedford Arms, with dray horse ‘Champion’. 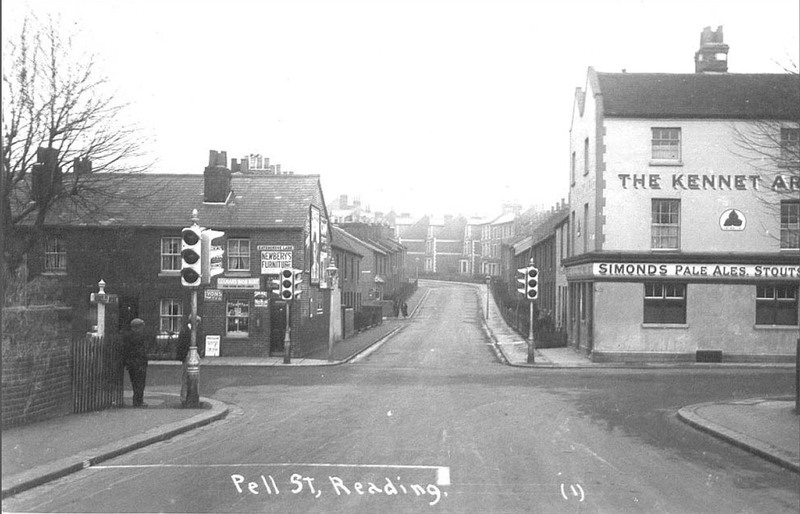 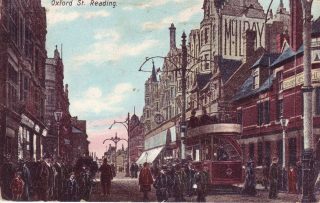 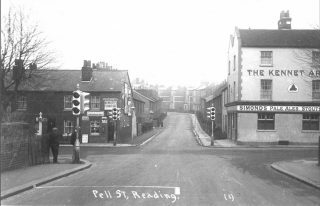 Reading, 22 Bridge St. 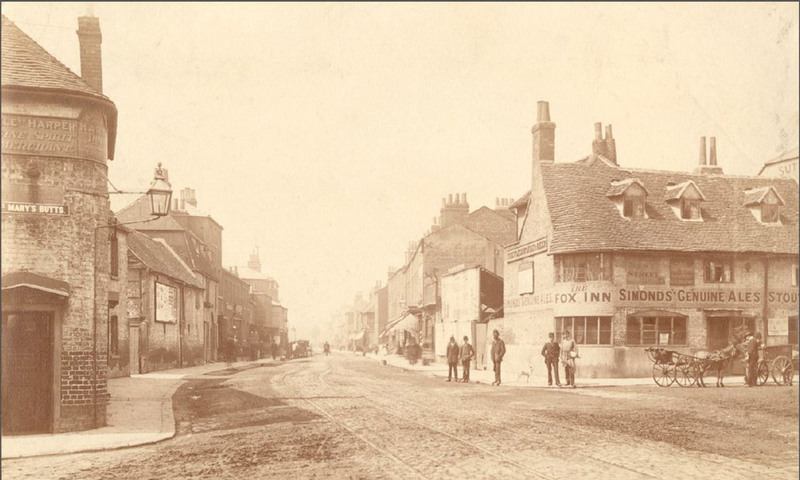 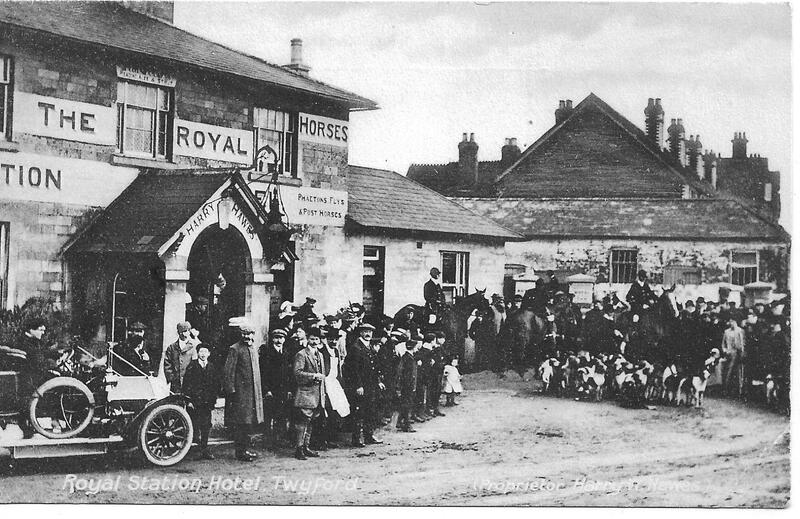 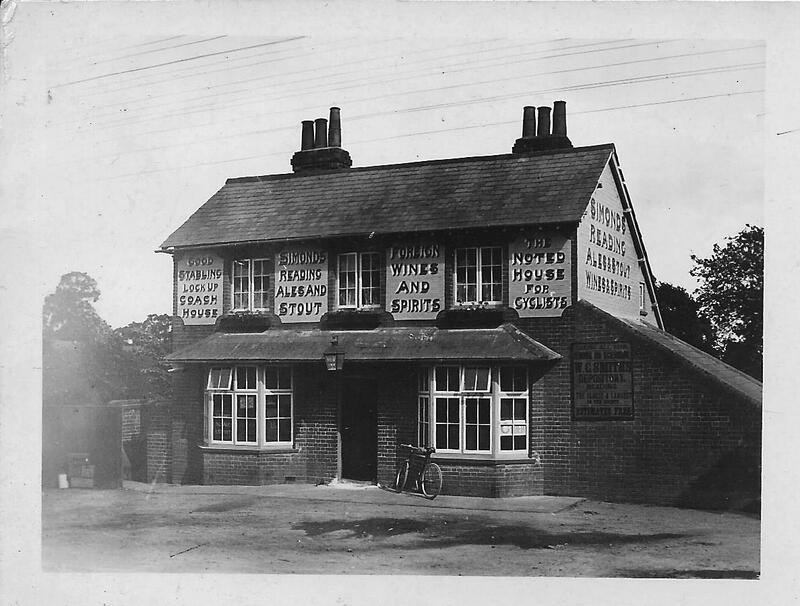 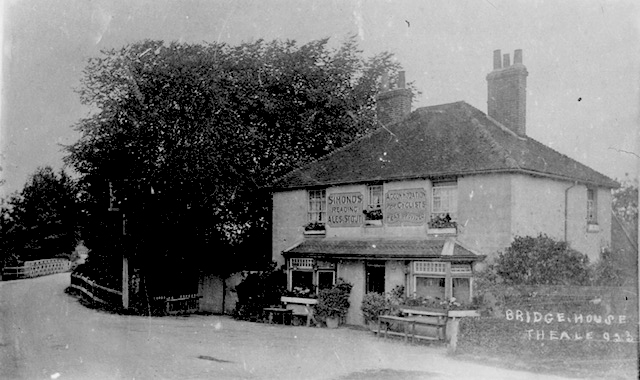 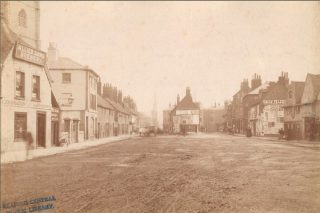 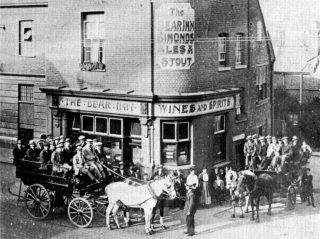 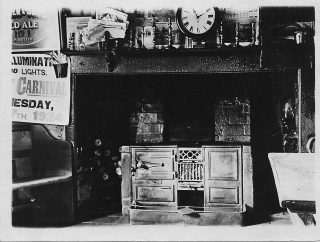 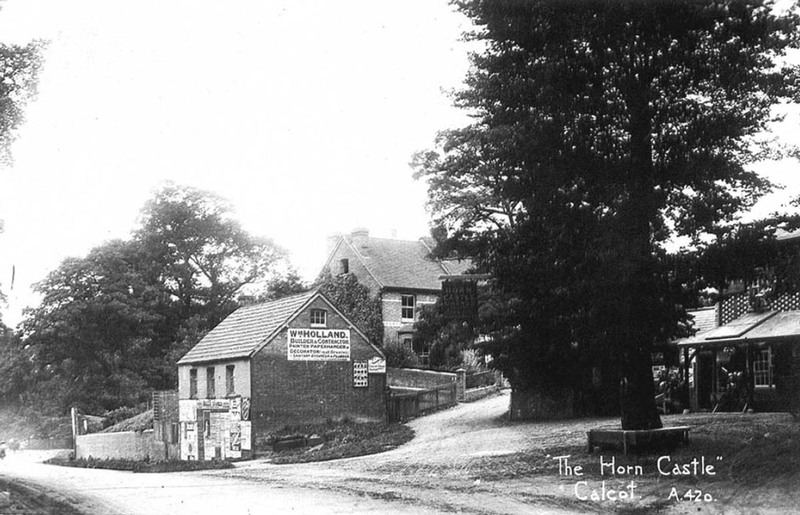 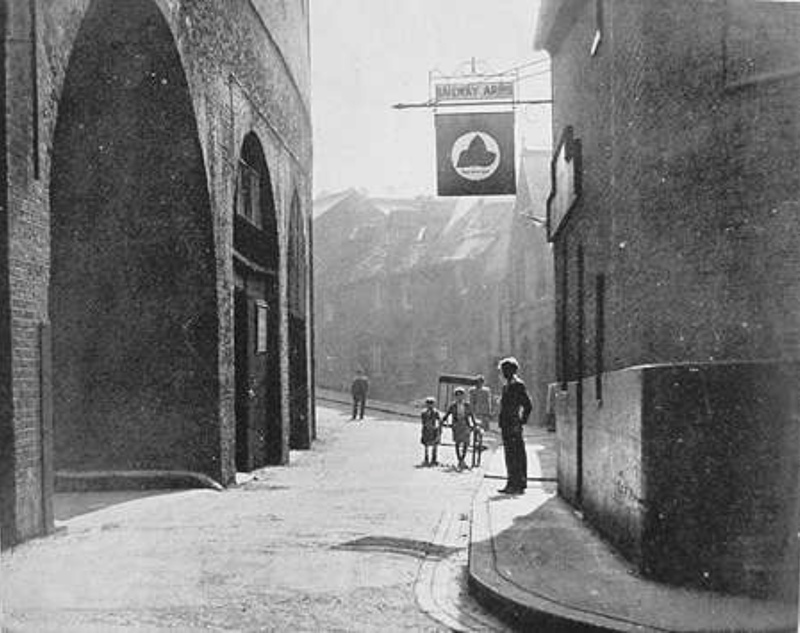 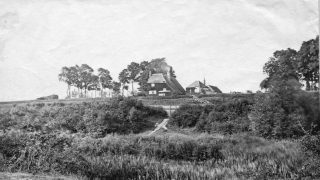 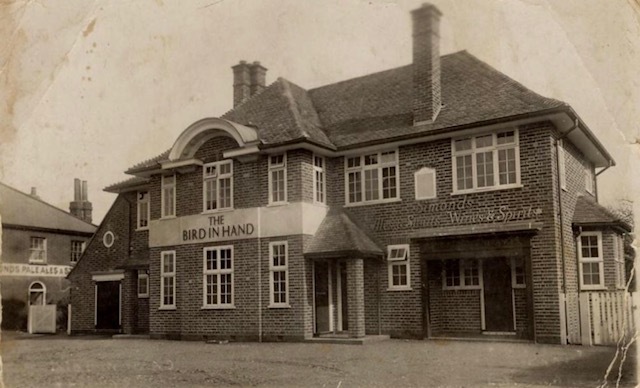 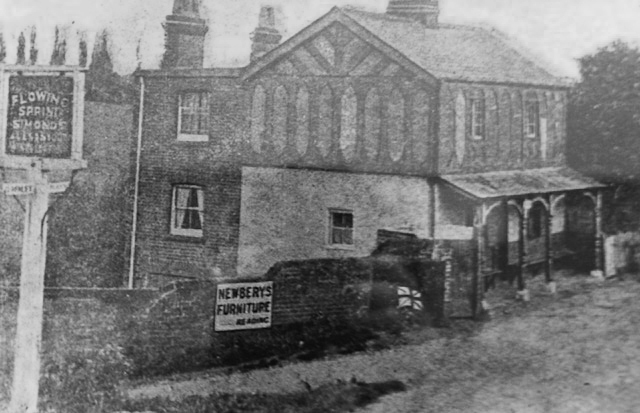 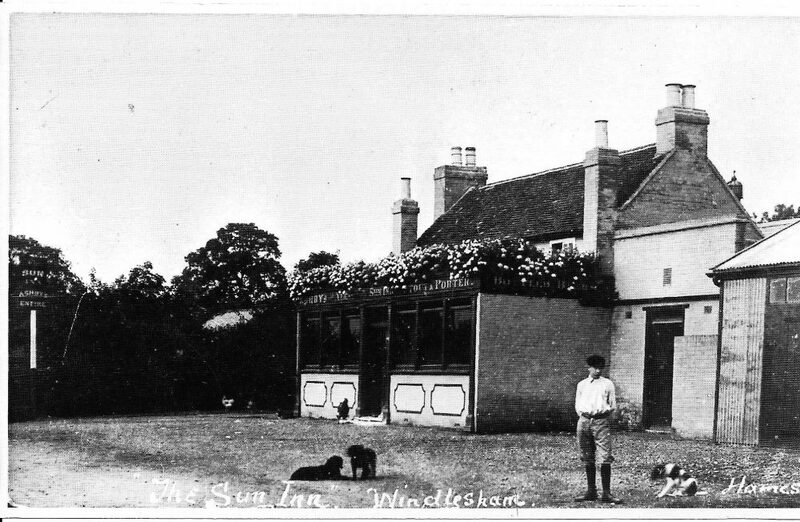 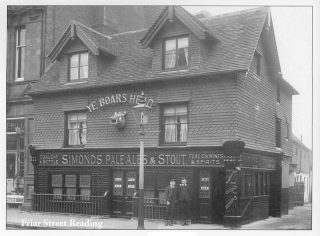 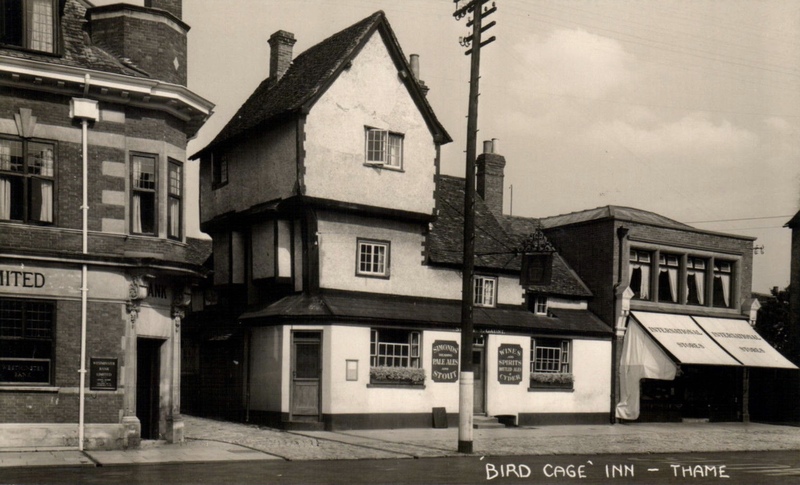 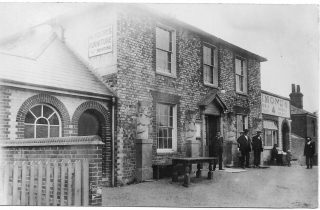 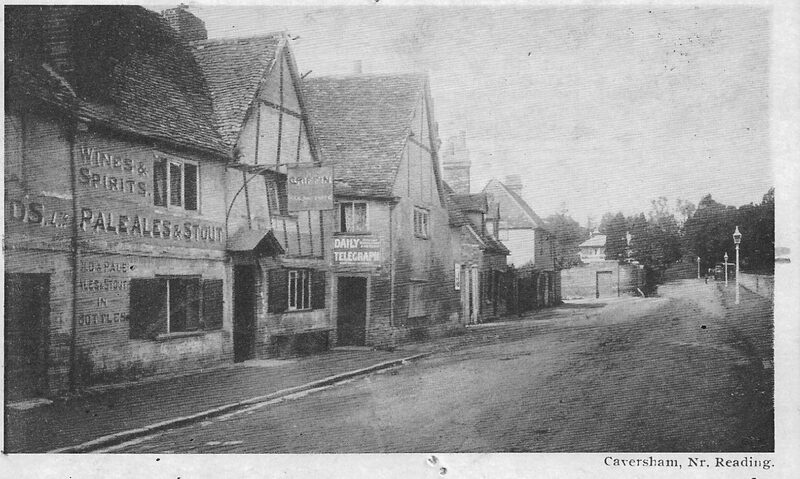 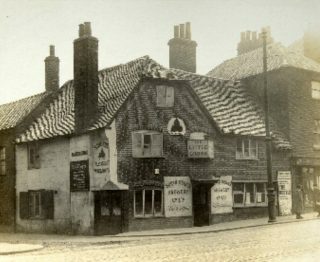 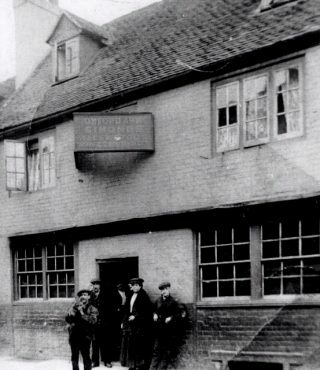 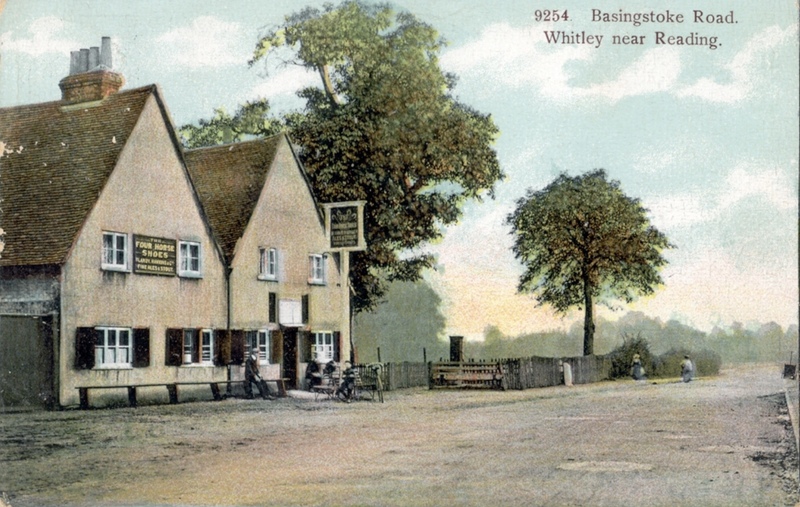 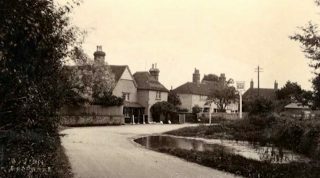 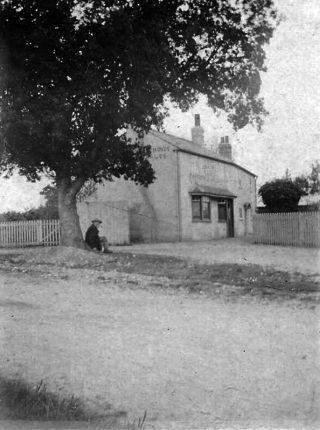 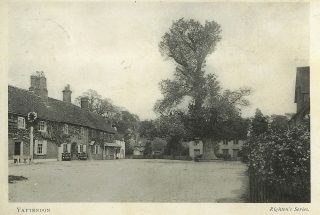 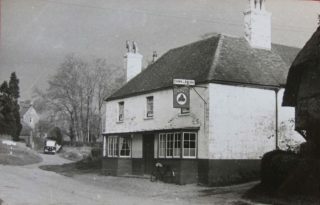 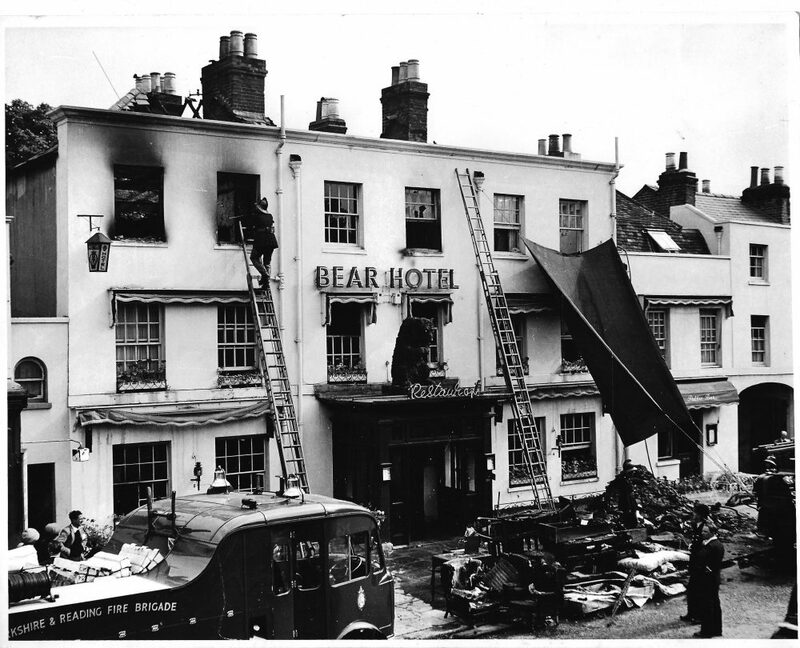 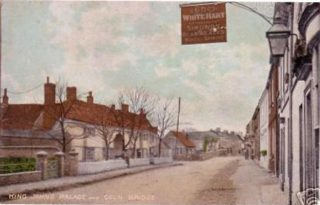 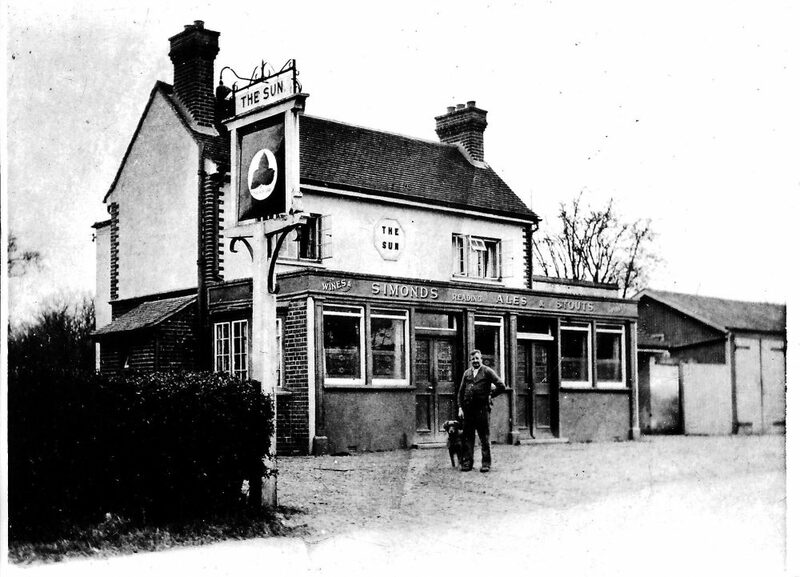 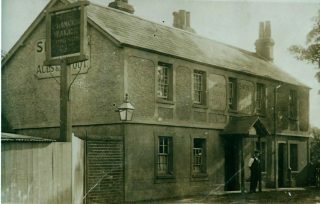 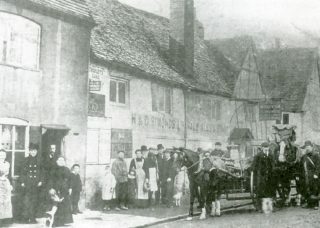 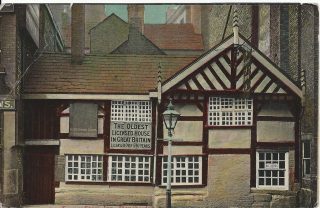 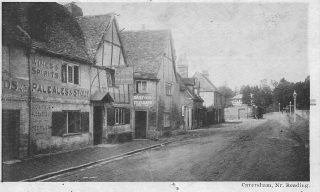 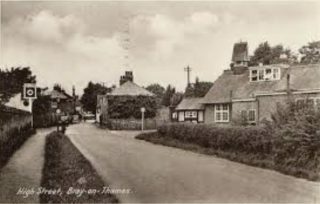 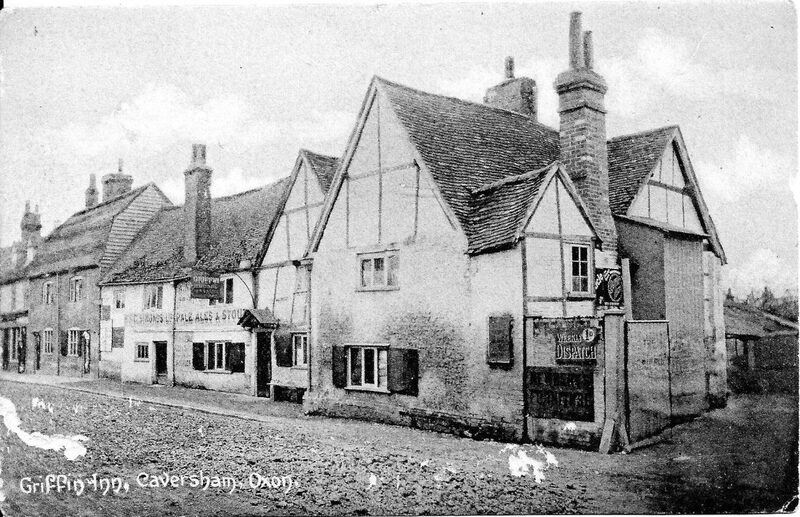 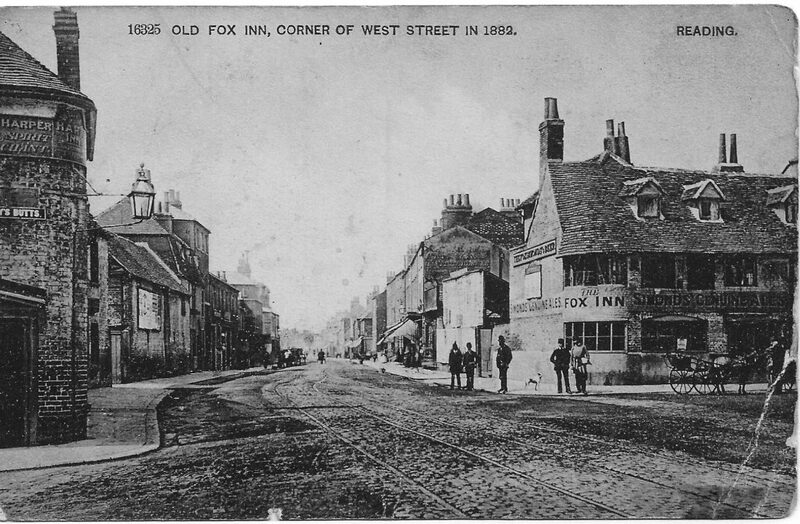 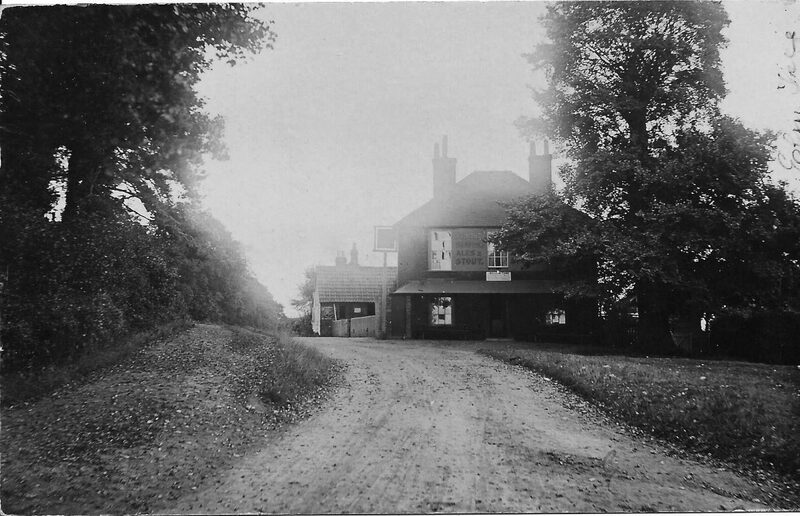 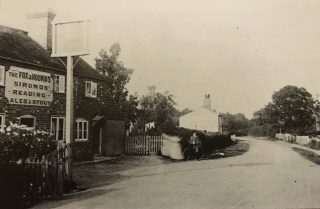 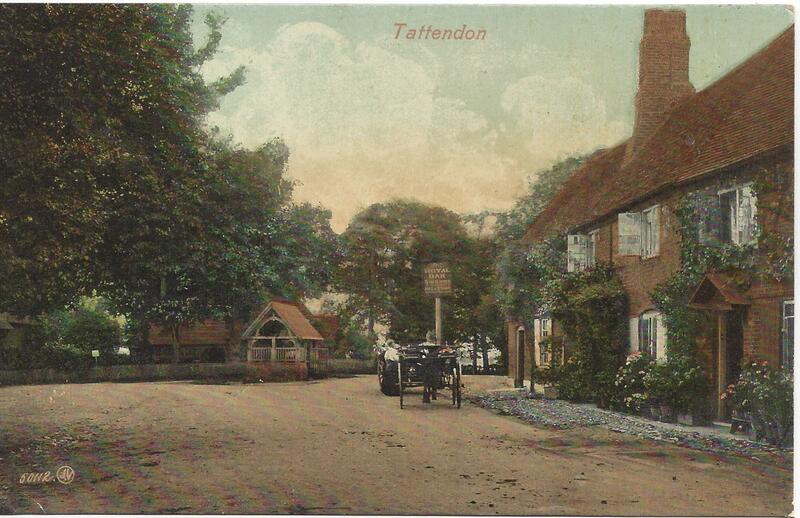 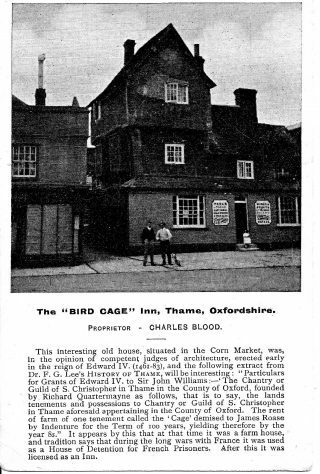 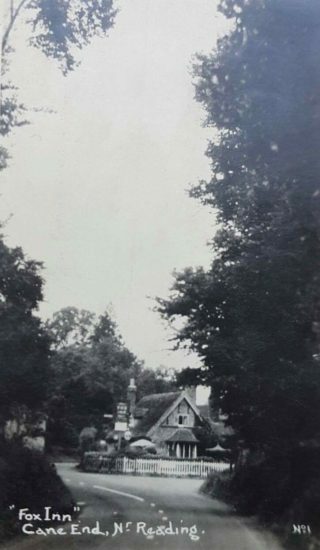 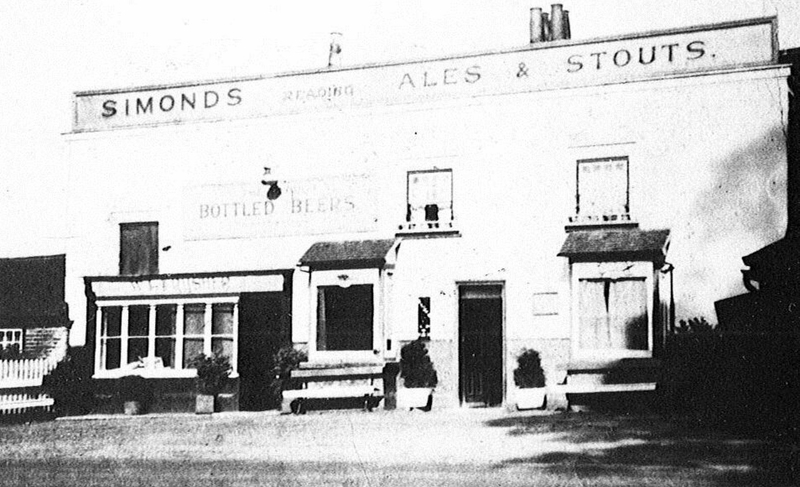 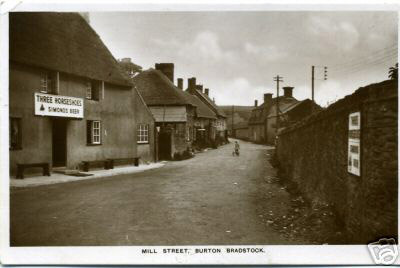 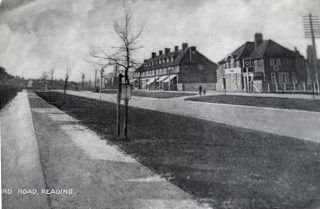 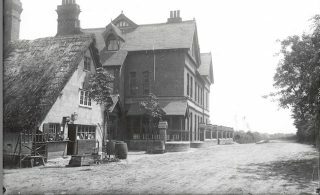 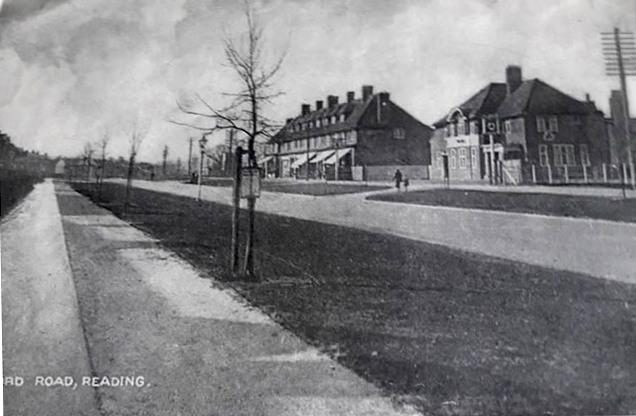 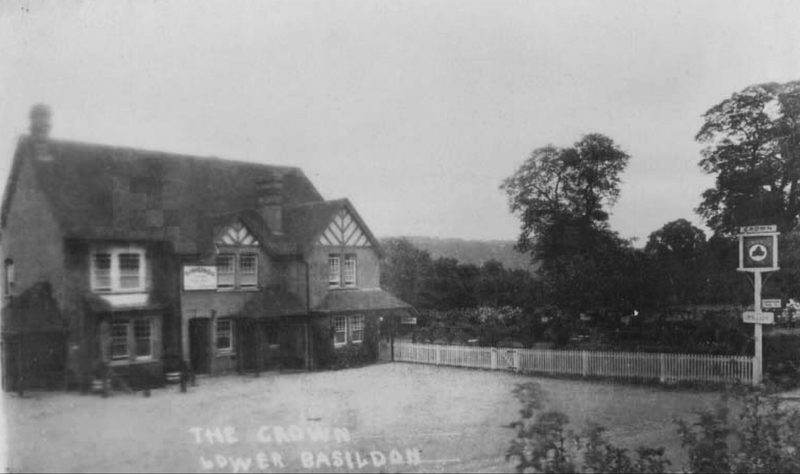 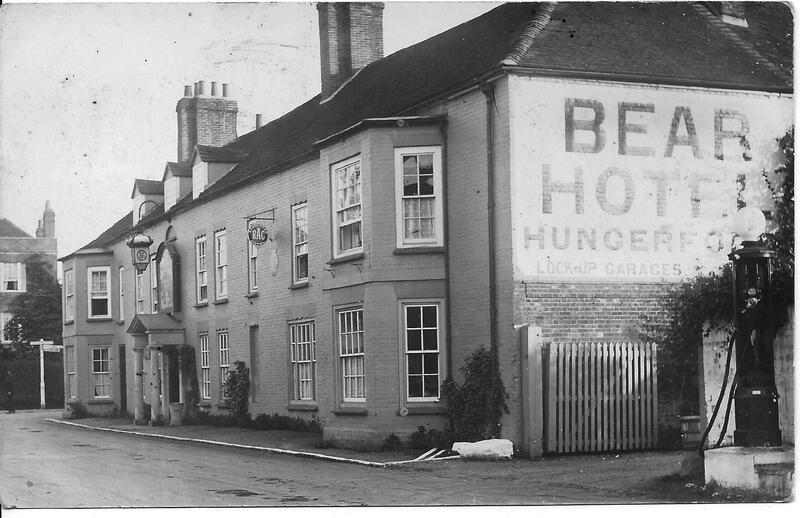 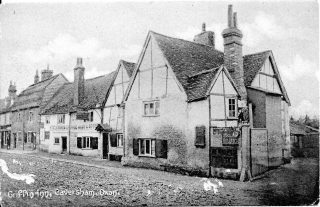 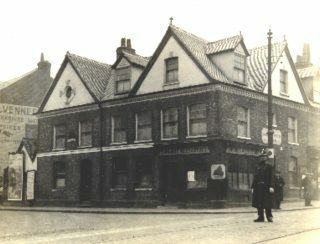 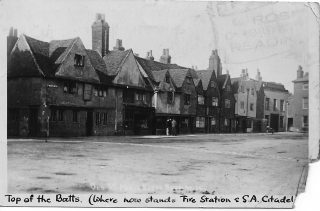 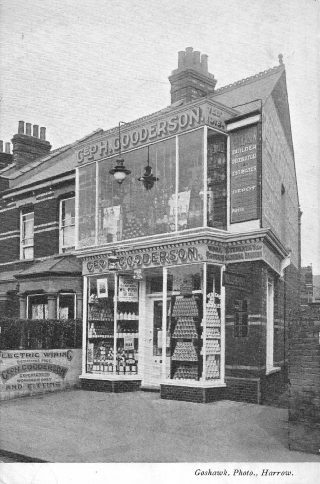 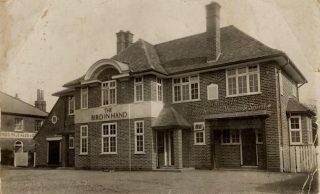 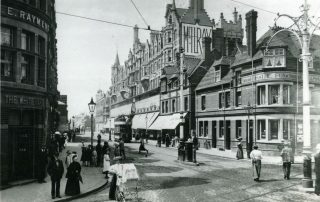 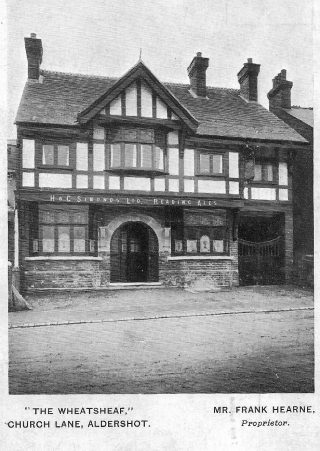 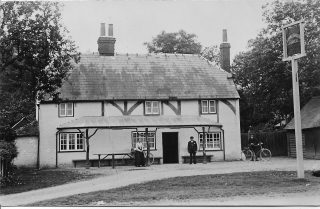 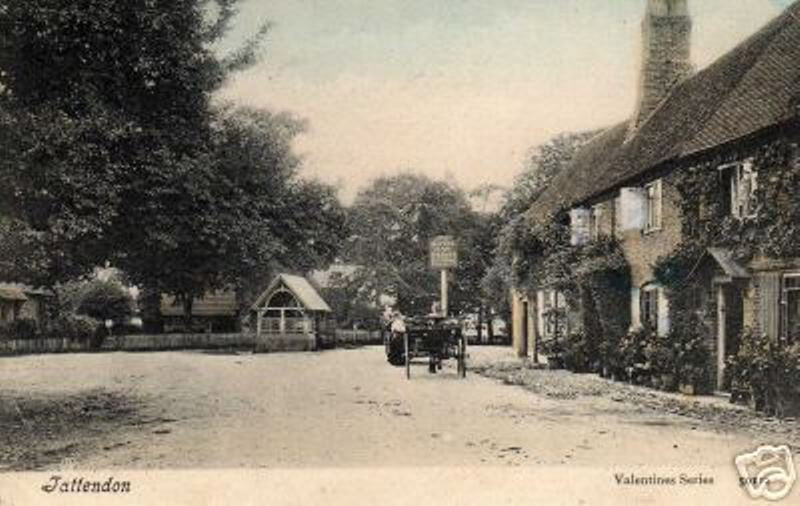 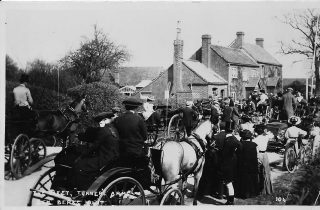 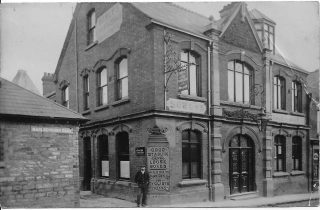 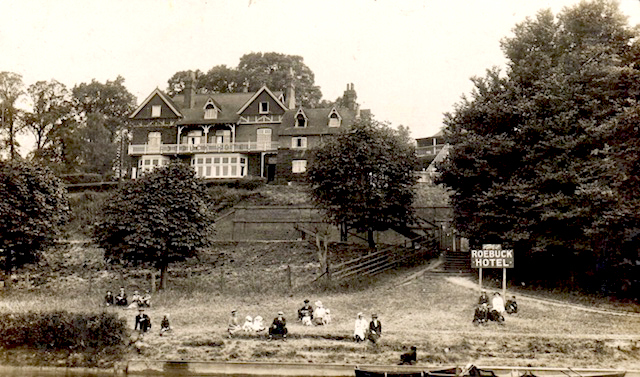 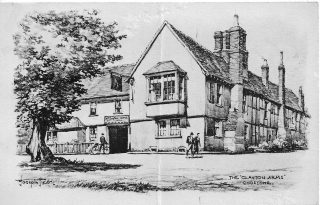 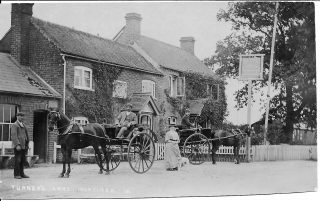 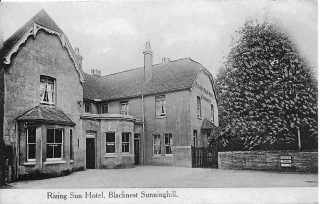 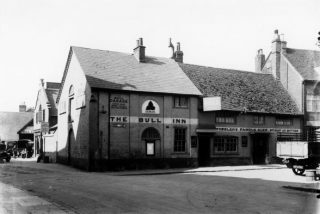 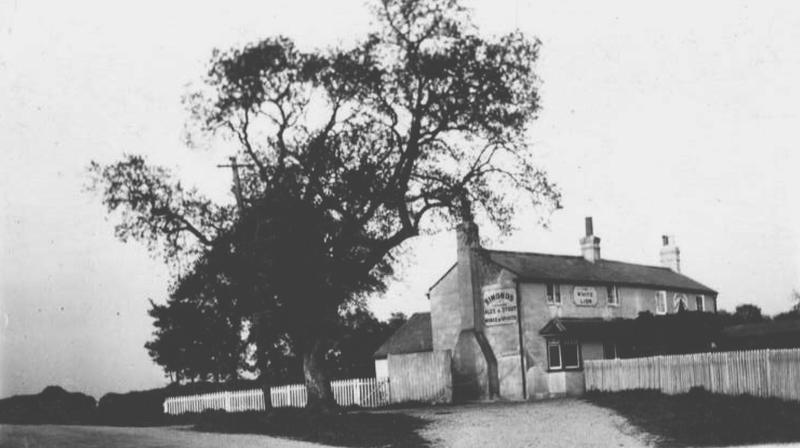 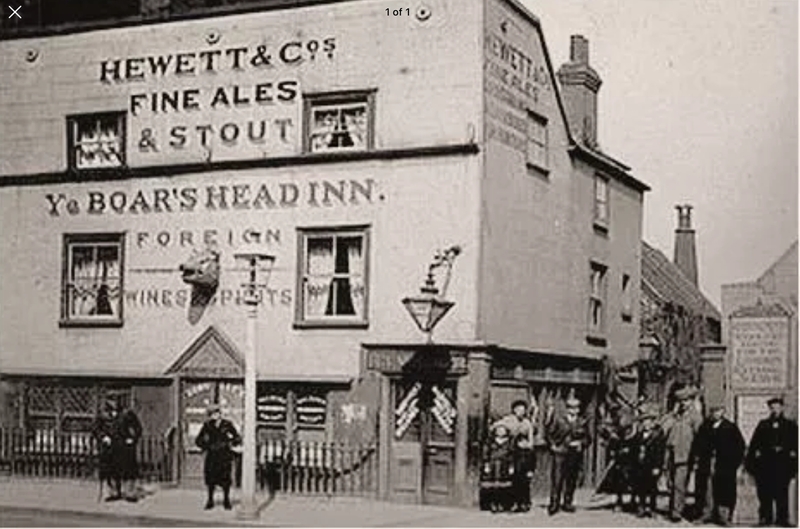 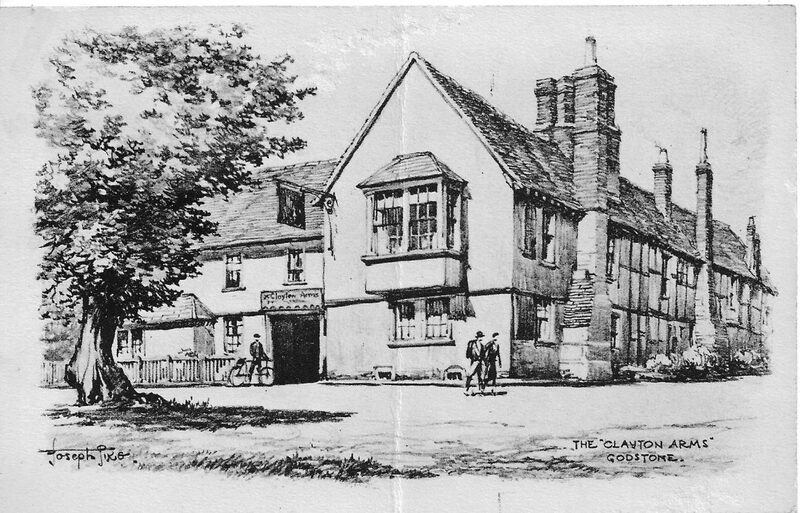 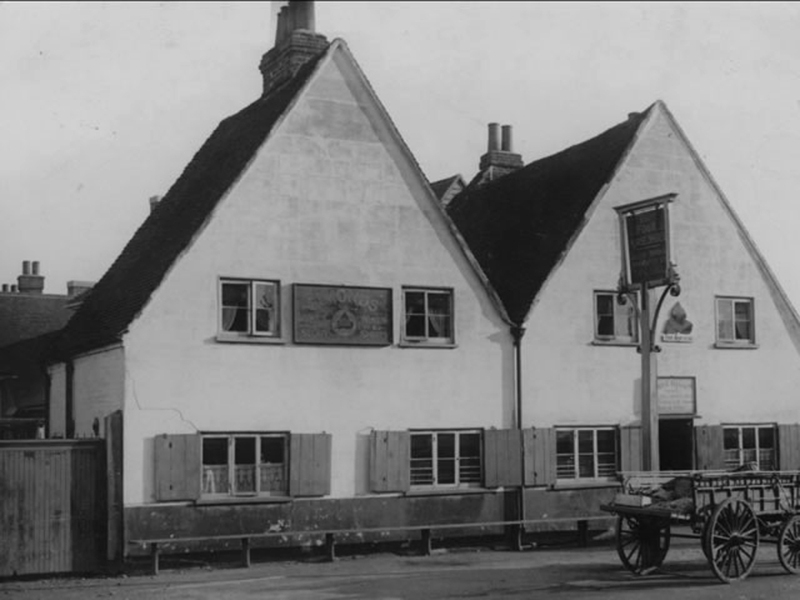 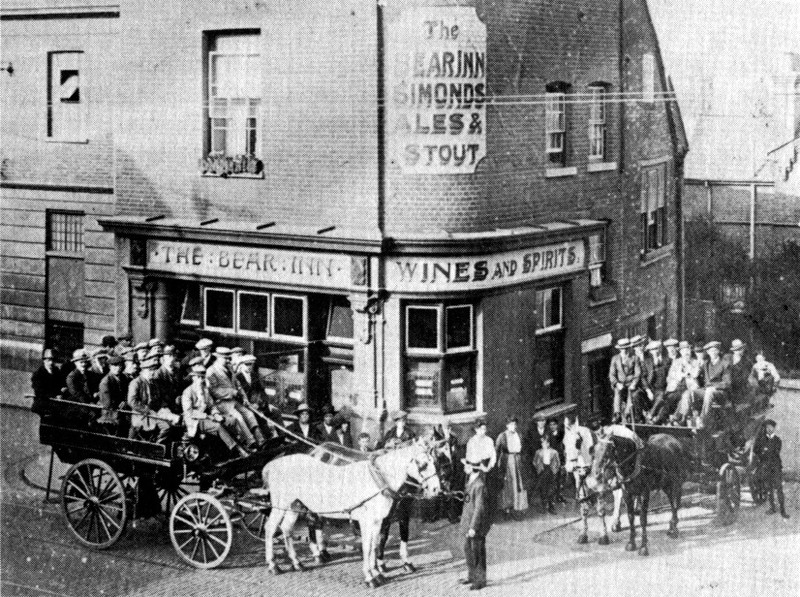 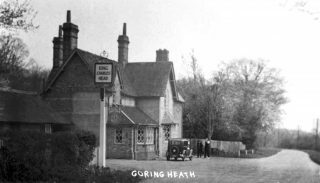 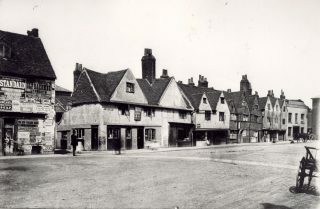 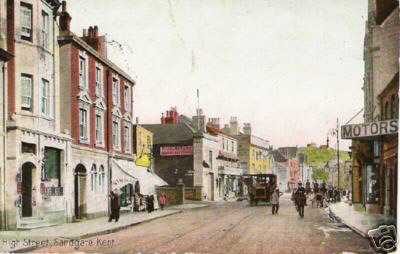 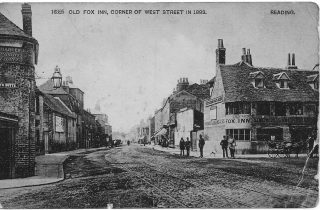 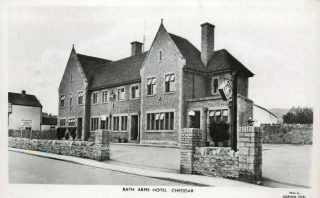 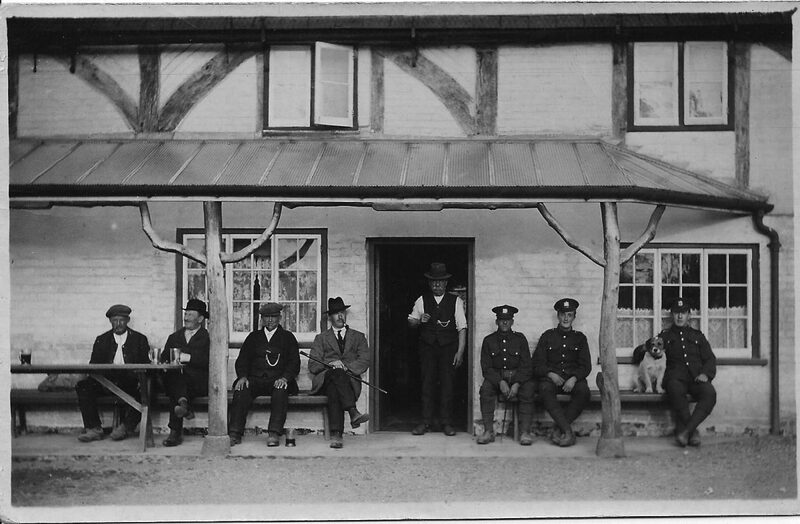 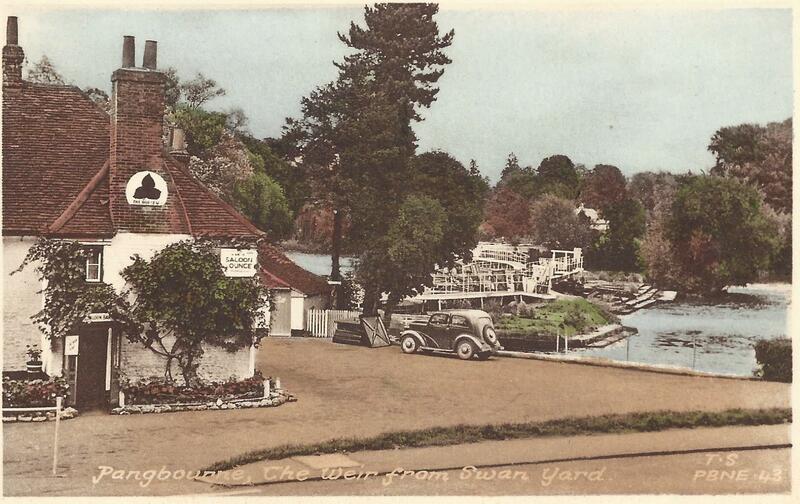 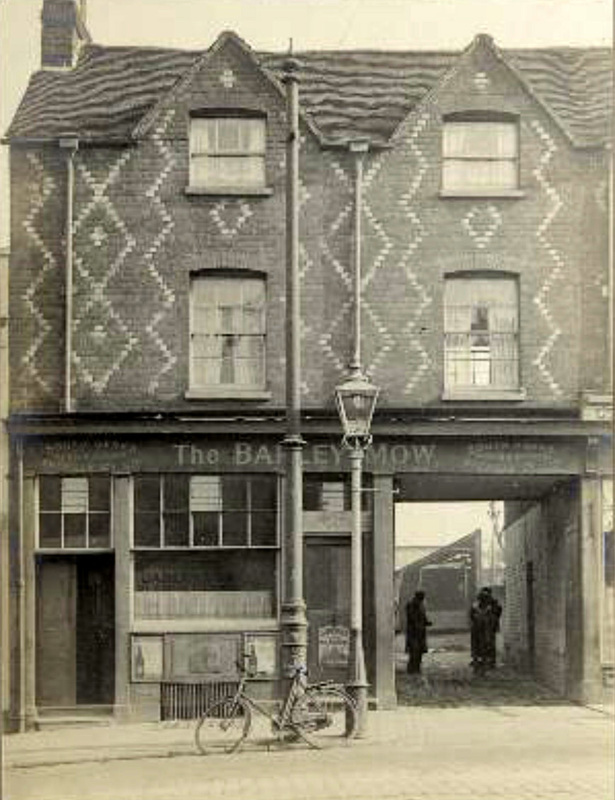 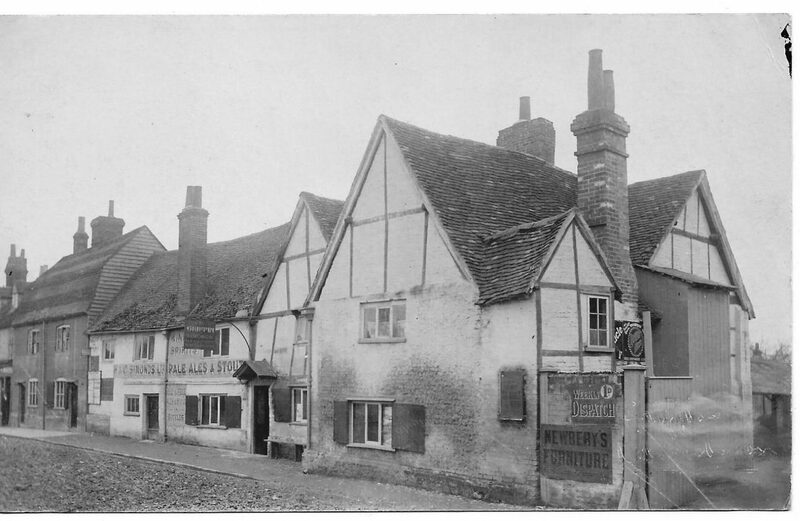 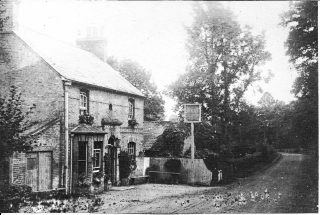 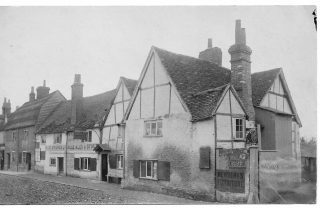 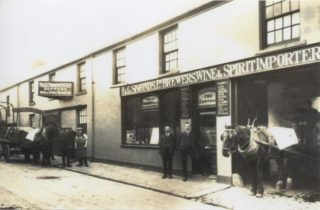 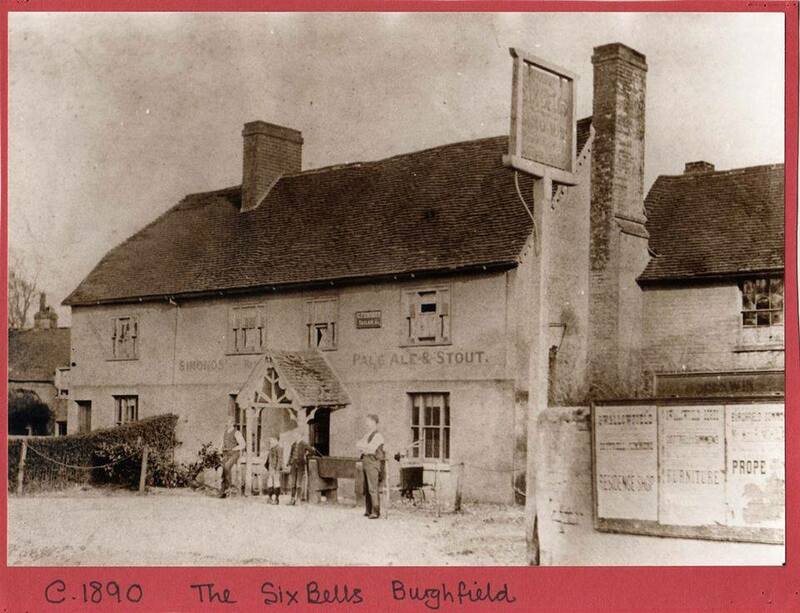 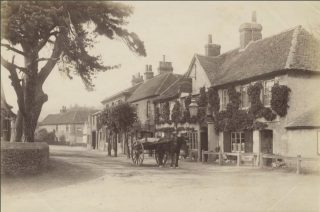 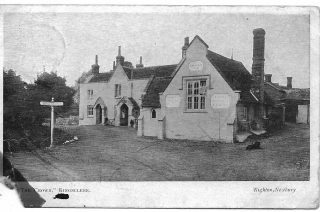 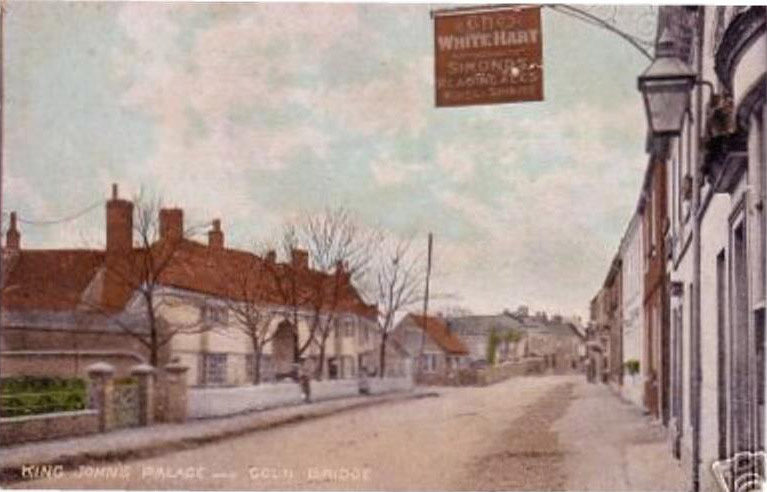 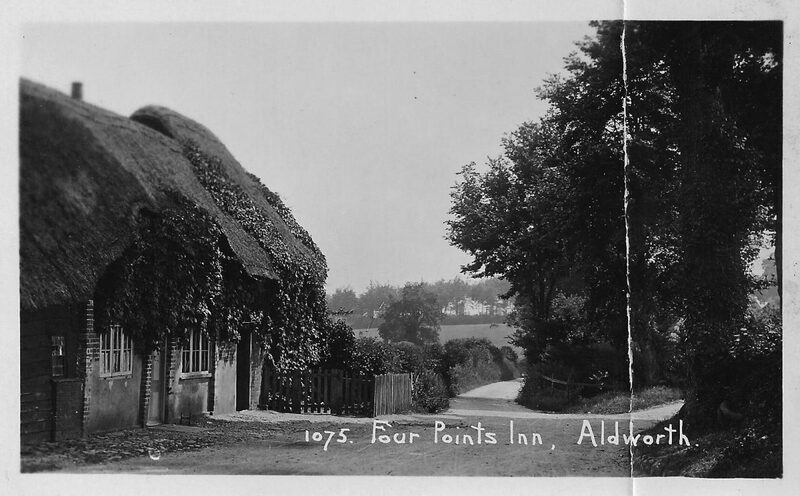 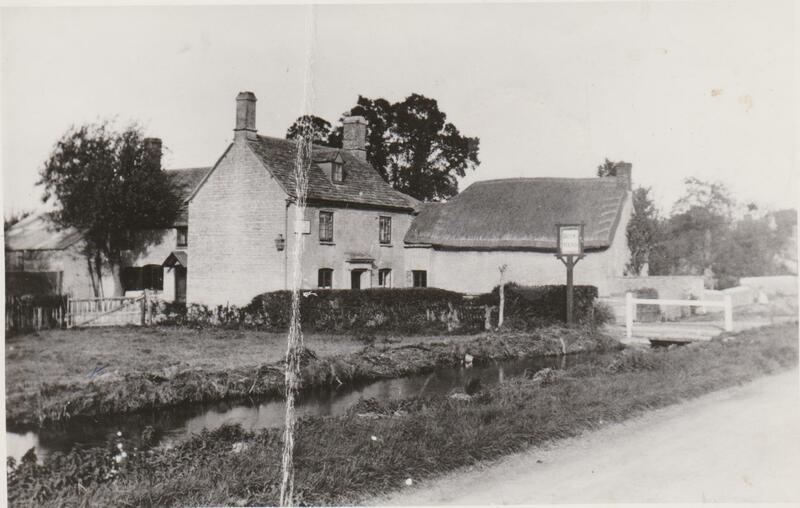 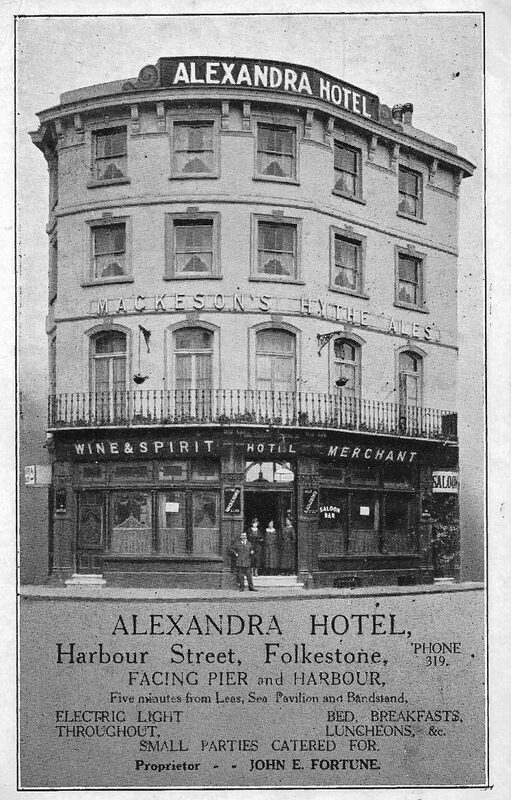 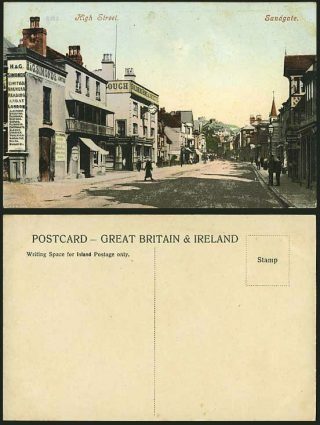 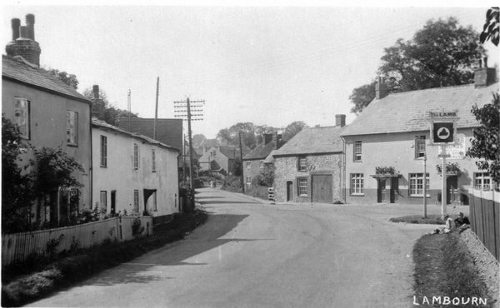 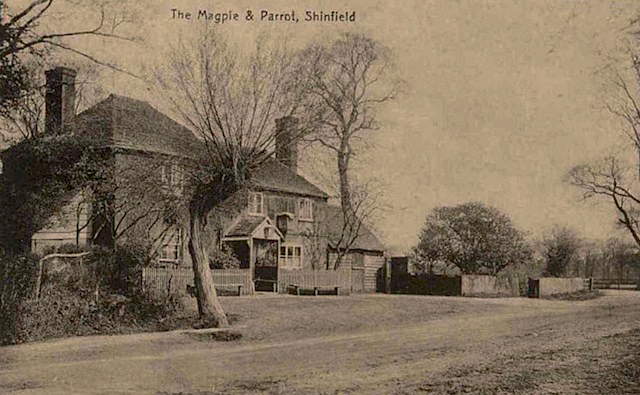 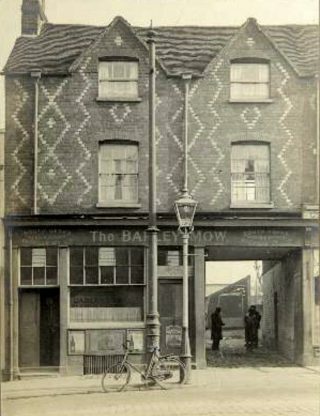 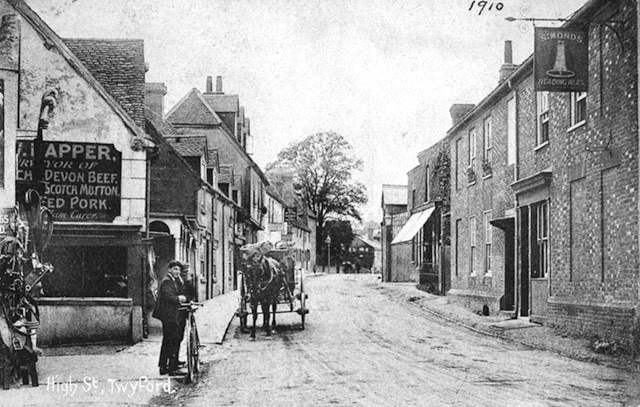 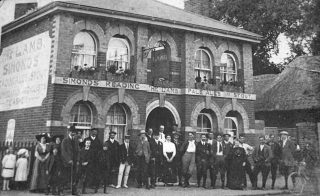 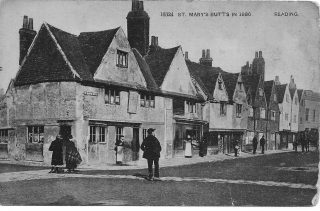 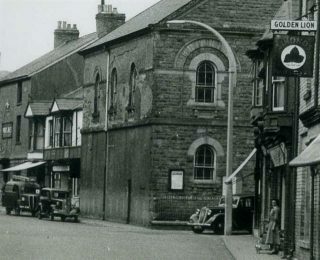 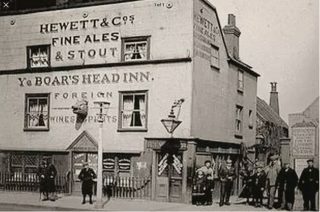 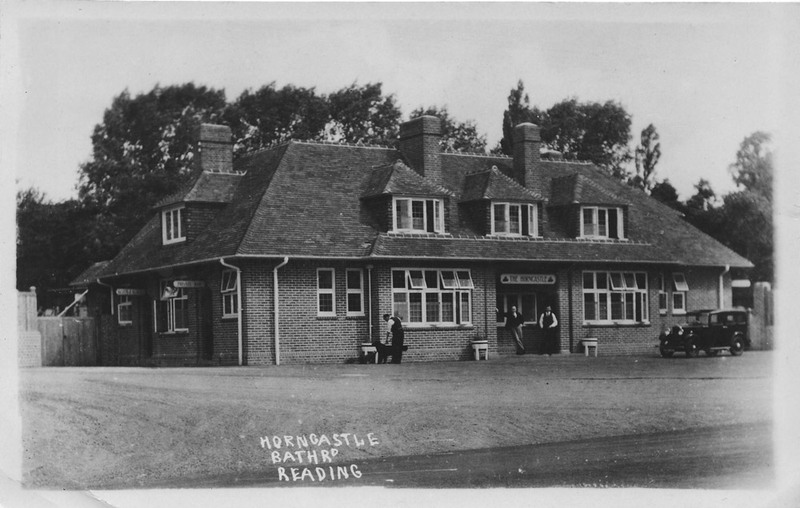 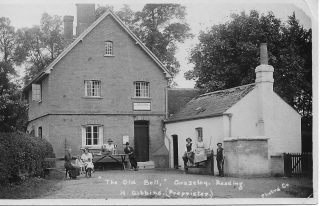 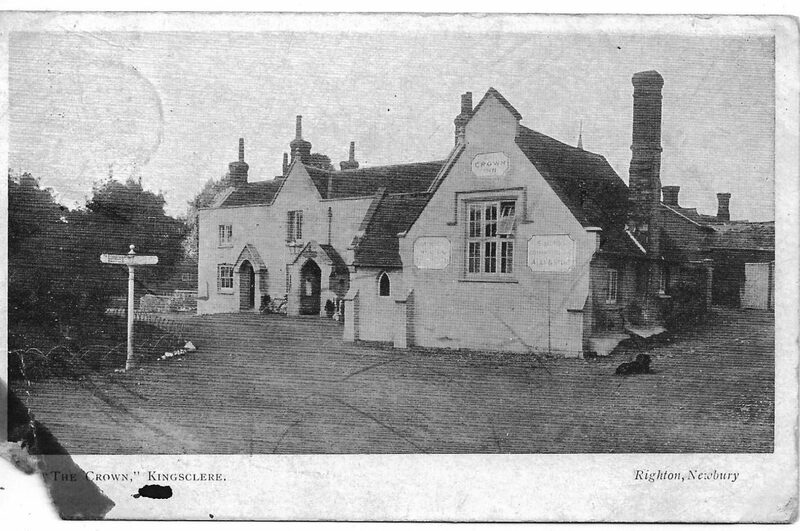 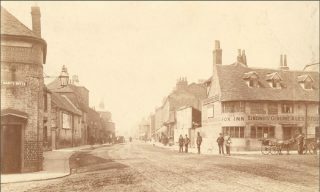 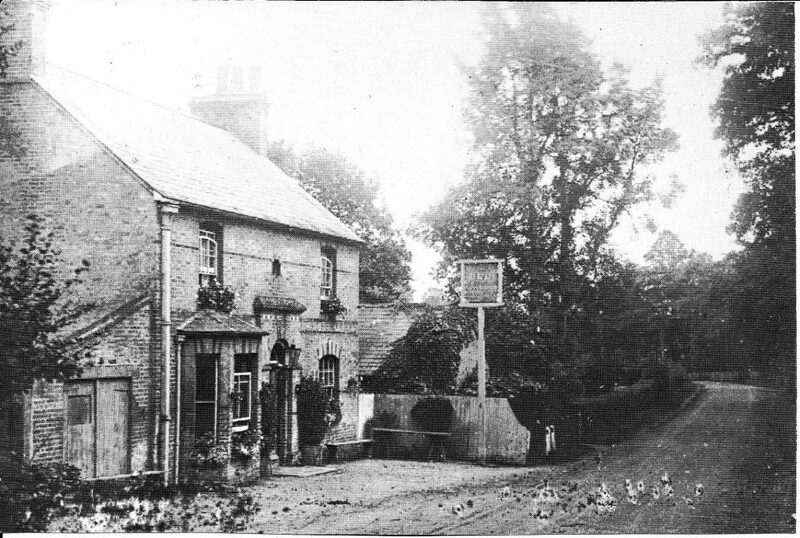 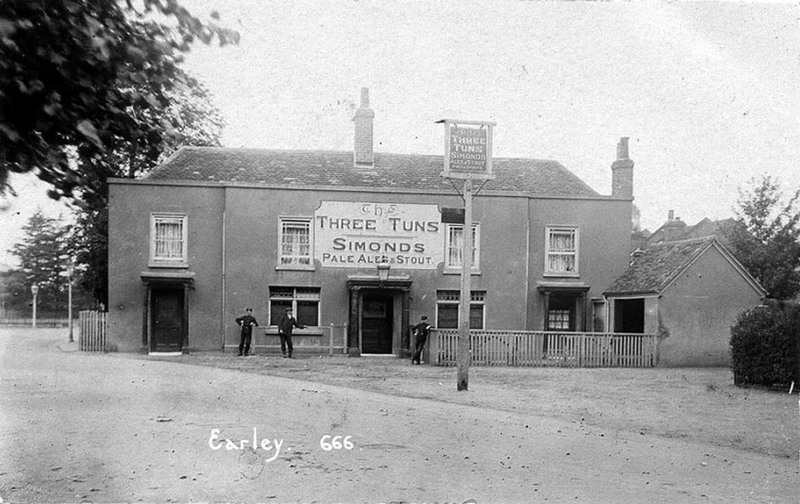 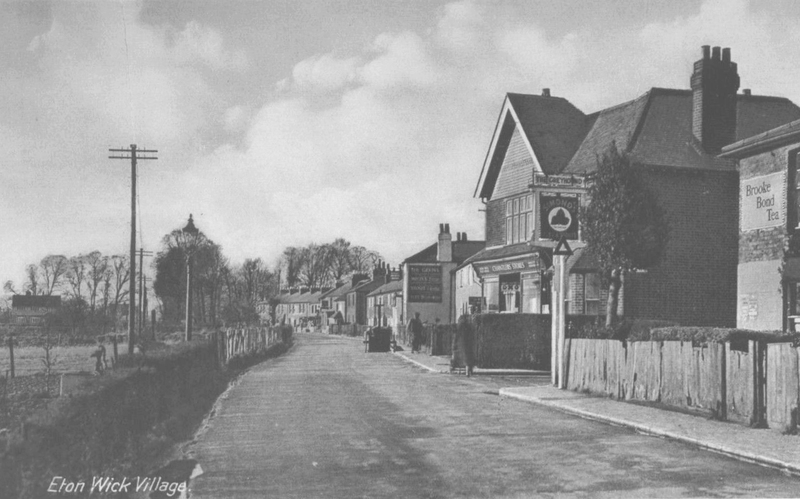 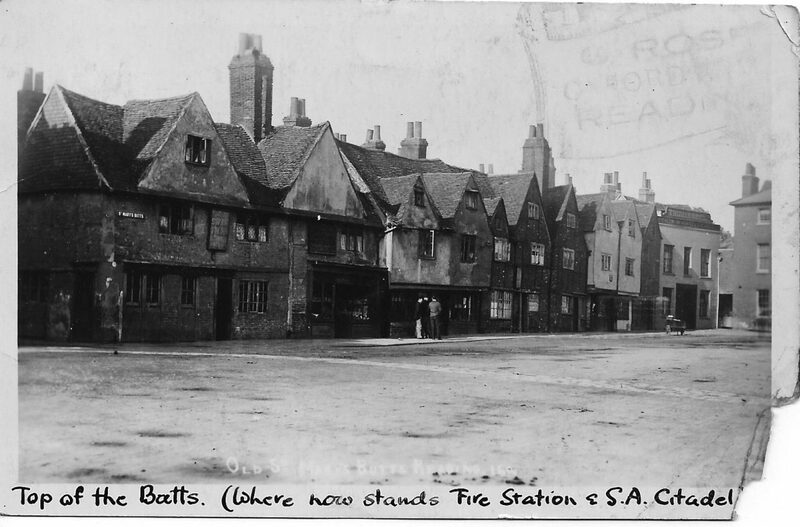 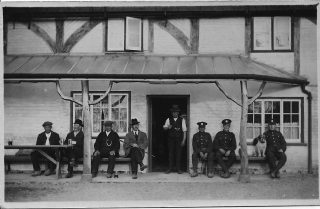 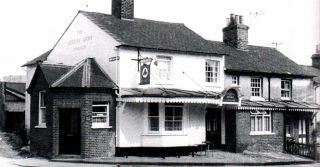 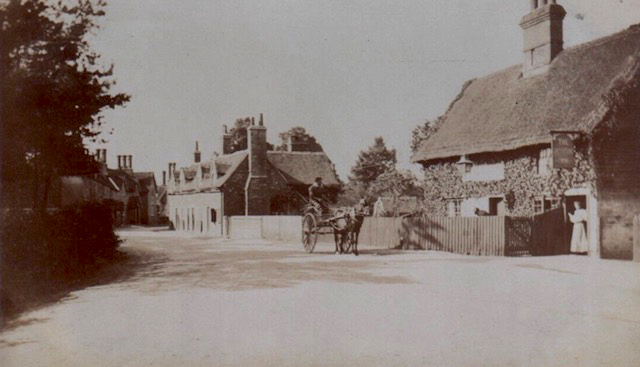 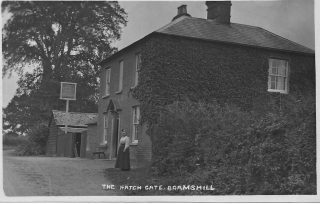 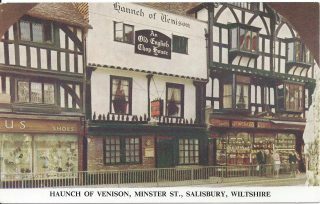 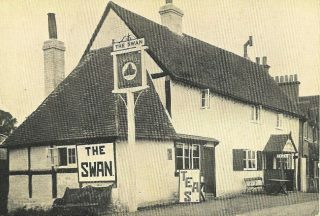 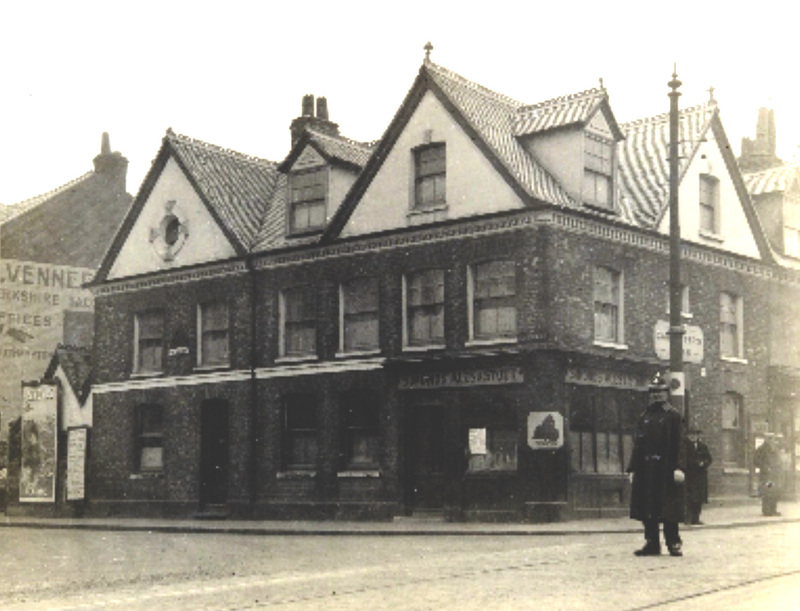 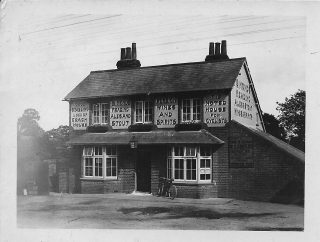 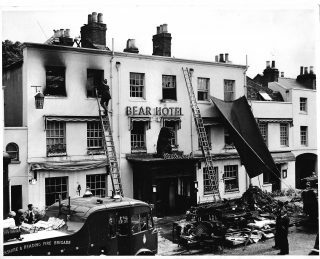 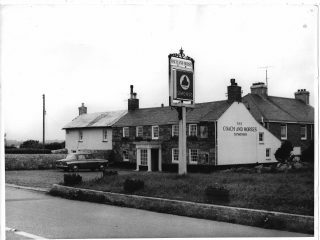 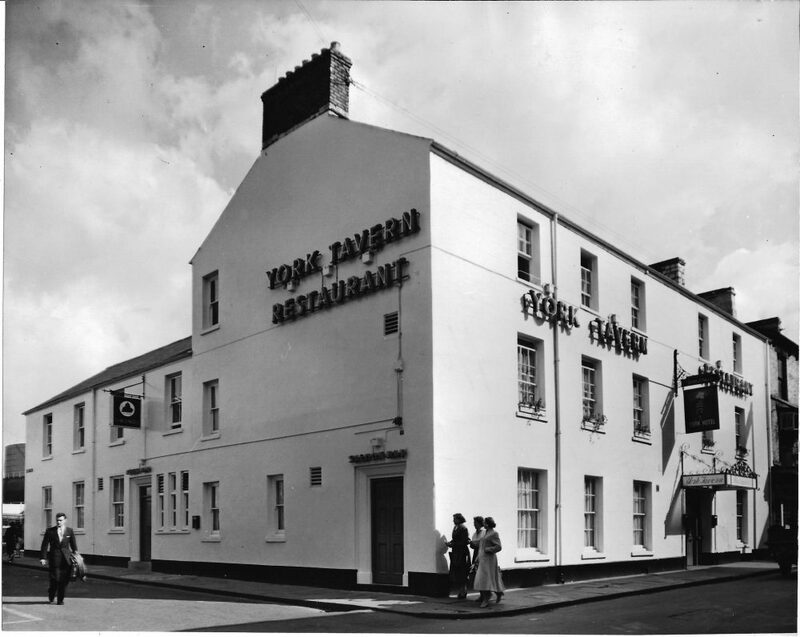 The Bear Inn 1900 Demolished in 1980. 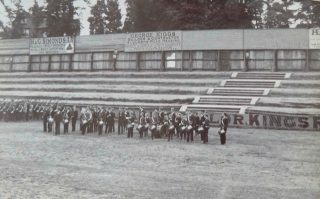 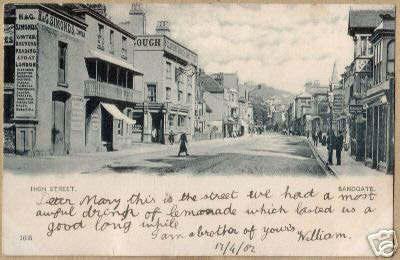 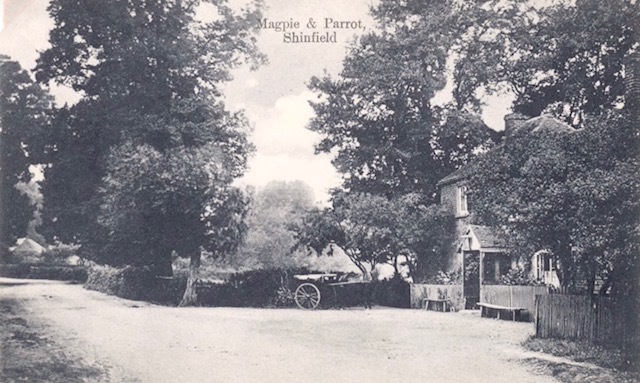 Bought by Simonds in 1898. 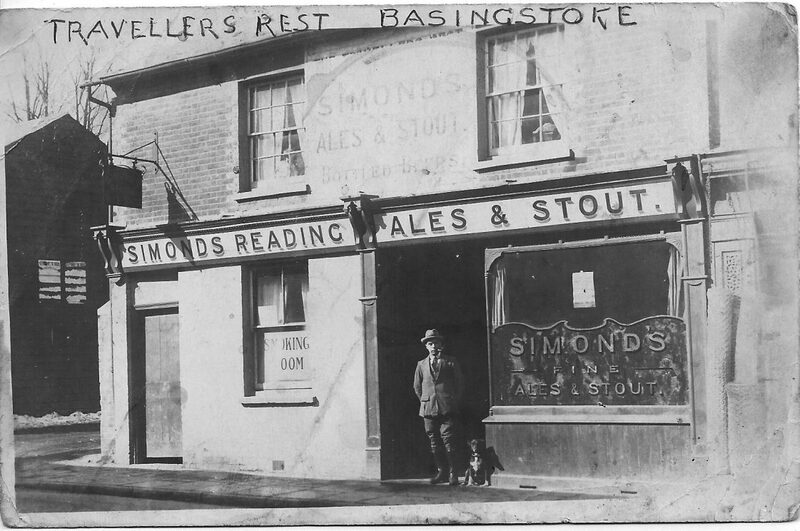 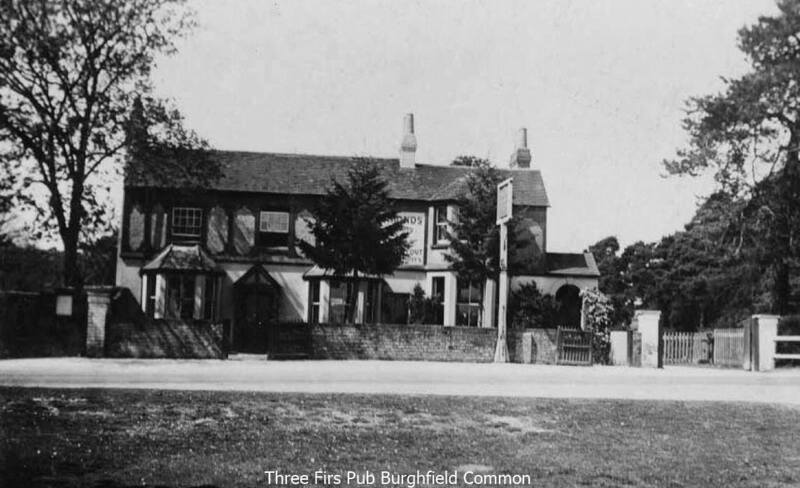 Reputed to be the oldest pub iun Reading it was first mentioned in 1483. 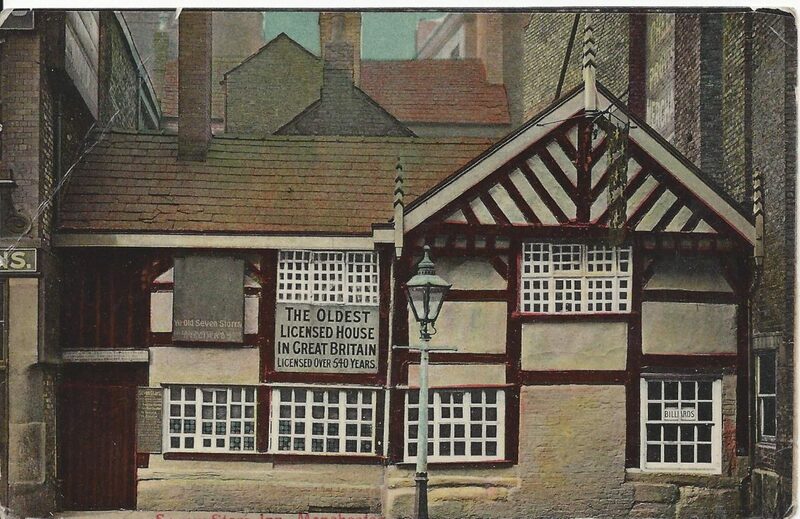 In 1683 the London law courts sat there to escape the plague. 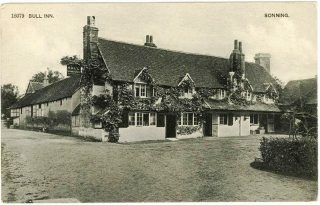 in 1648, Cromwell visited as did Mary of Modena in 1688. 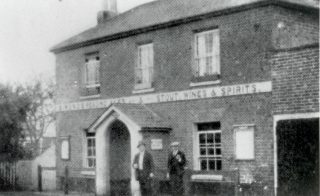 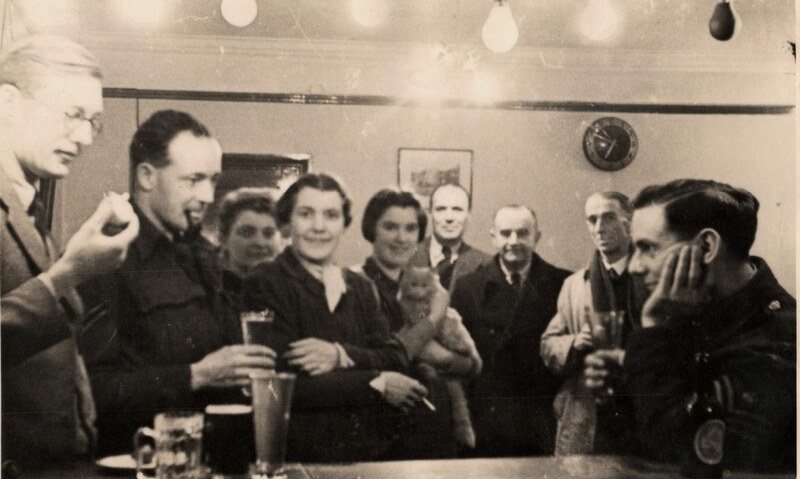 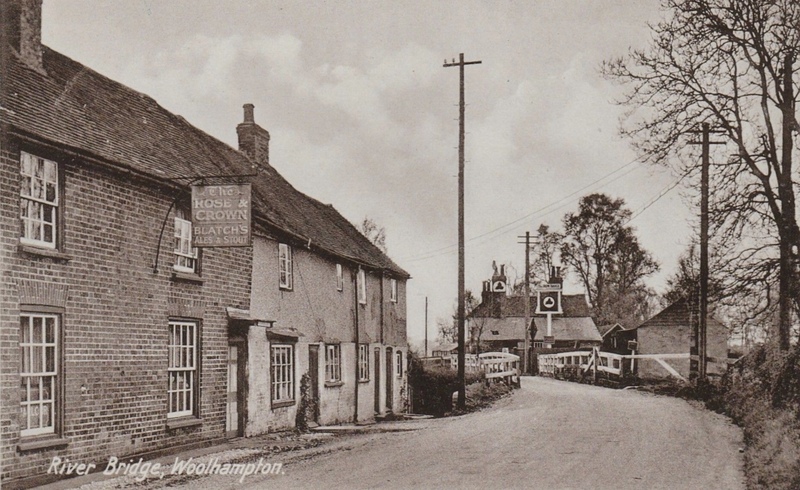 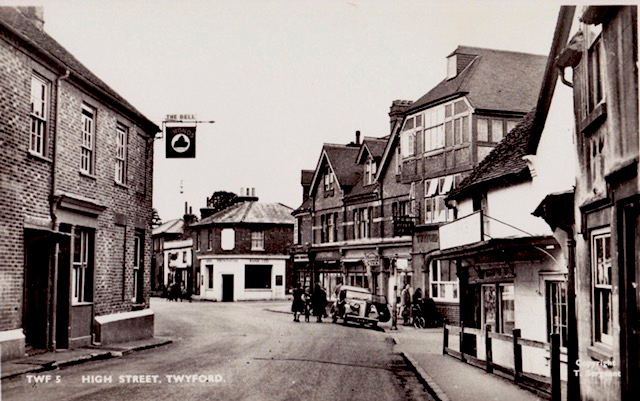 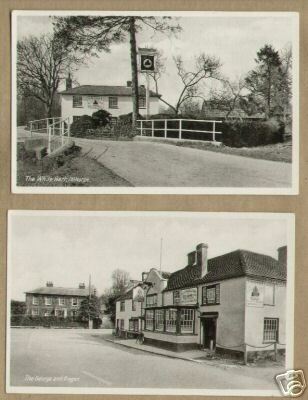 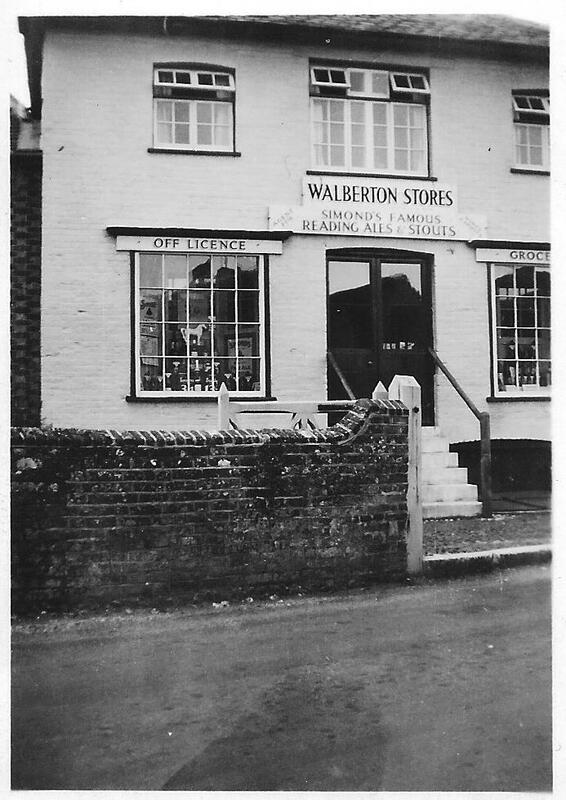 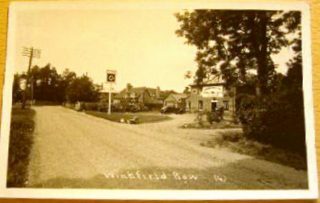 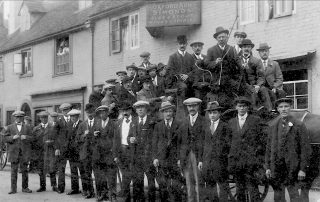 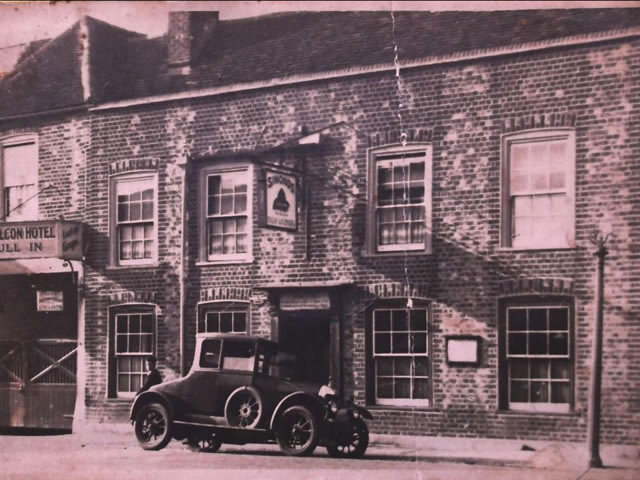 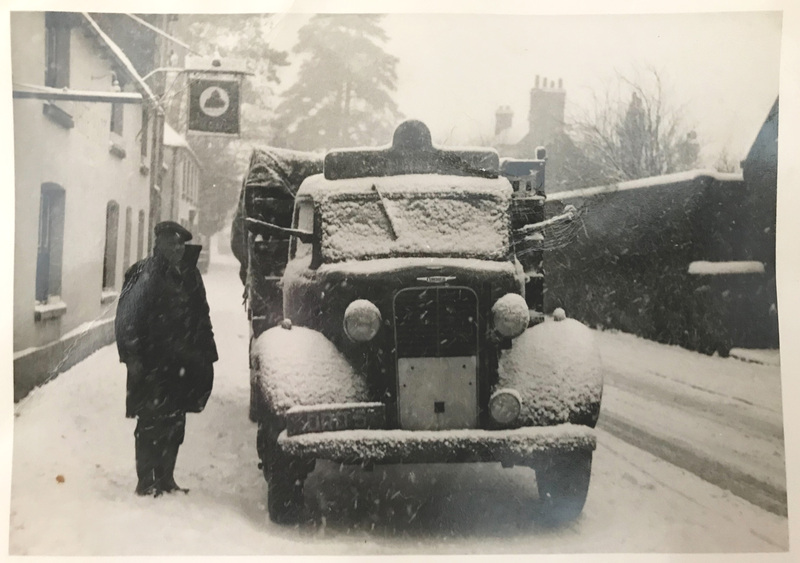 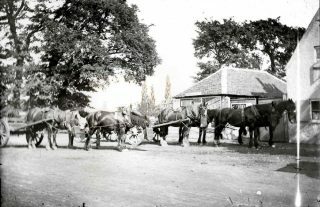 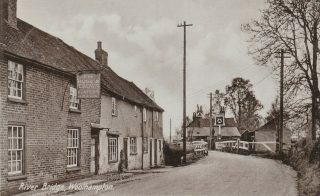 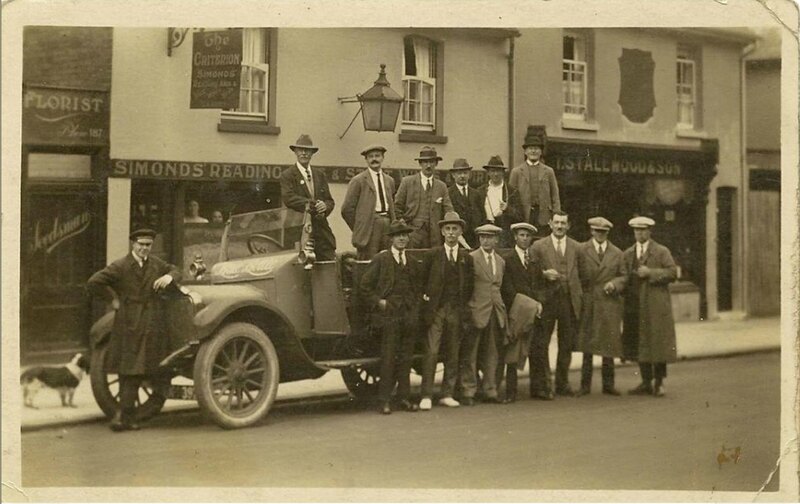 Watlington, The White Hart, Jock Bennett driver. Can you tell me about the truck? 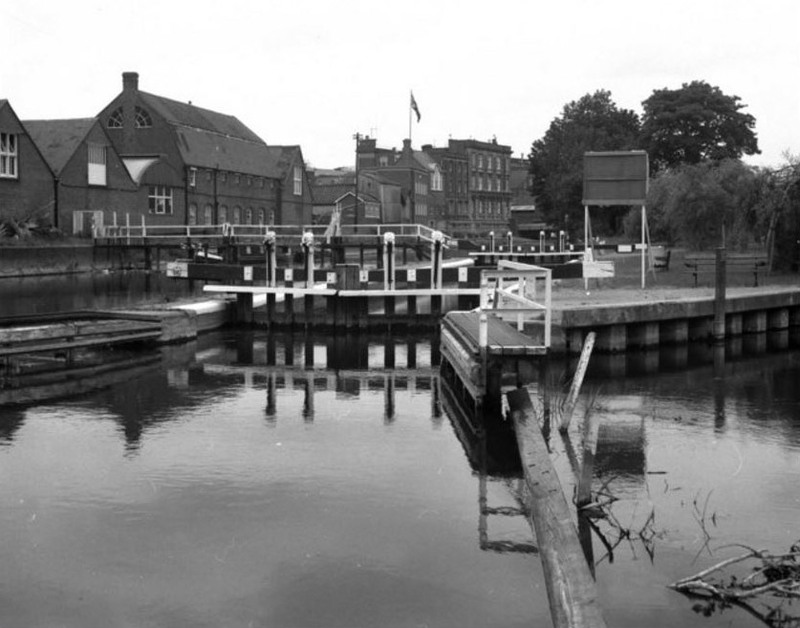 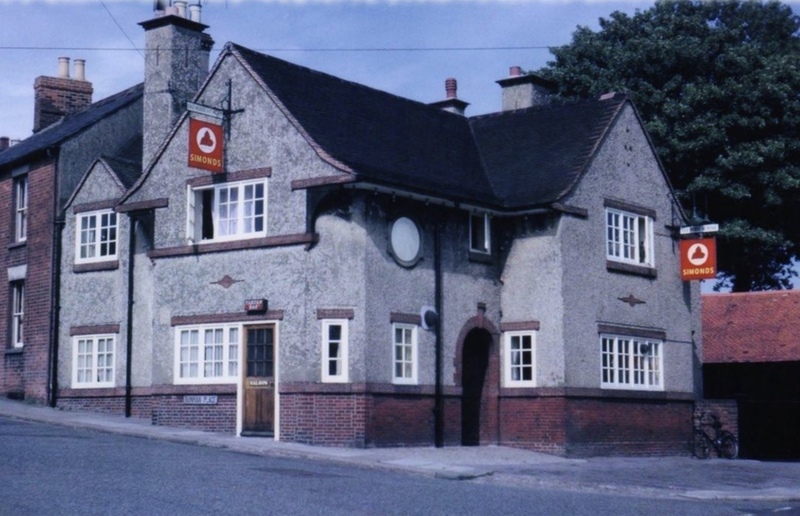 X – The Red Lion – where? 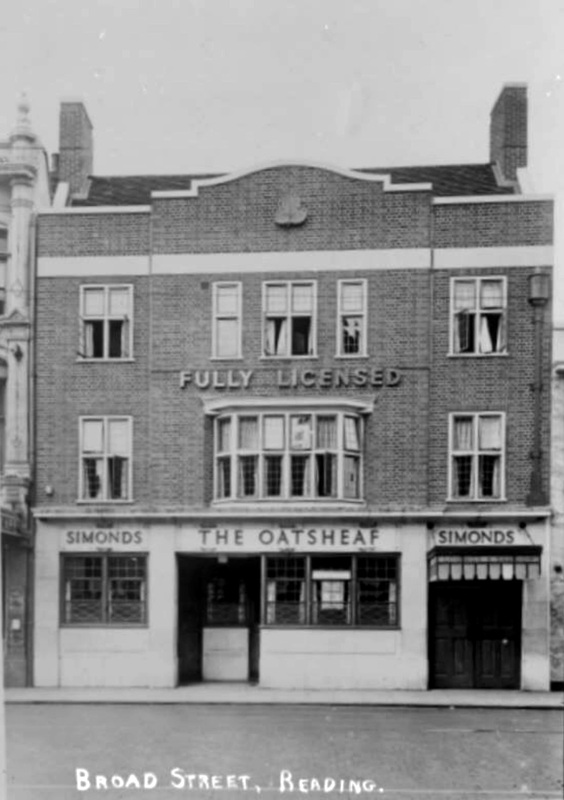 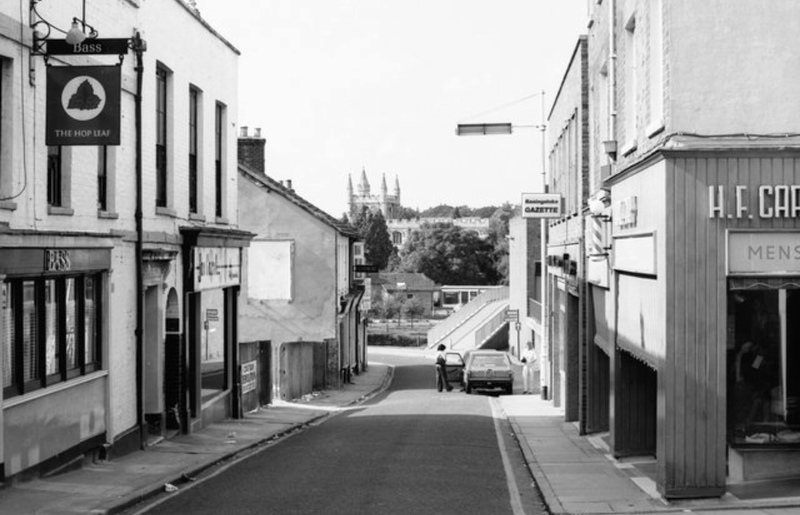 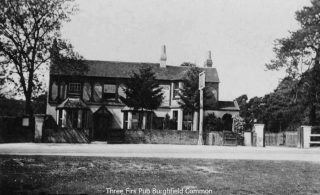 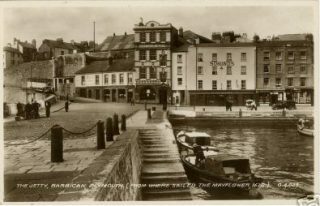 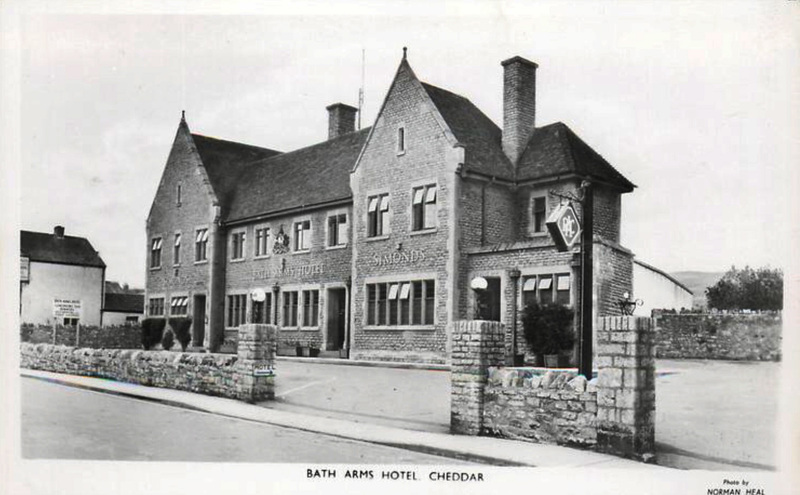 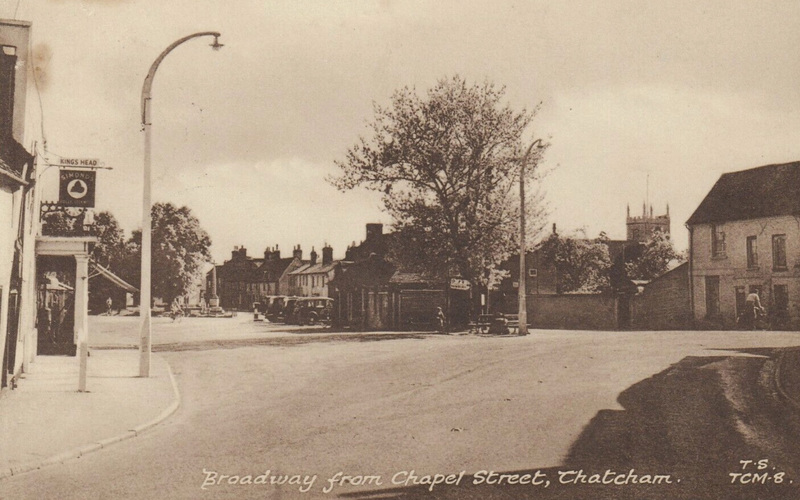 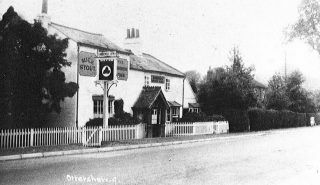 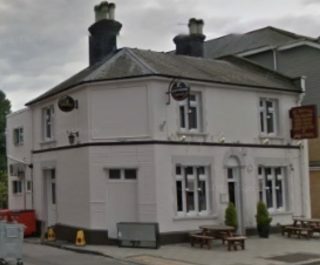 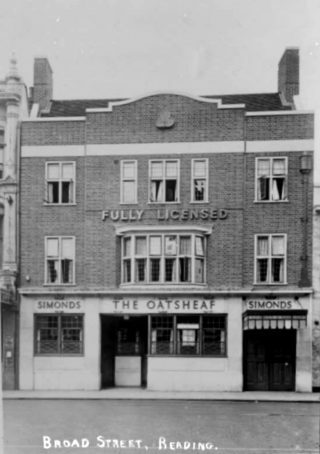 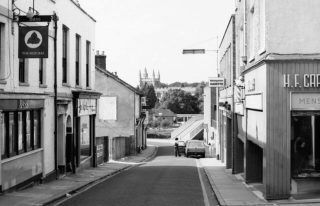 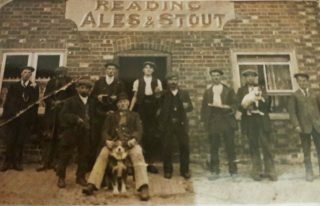 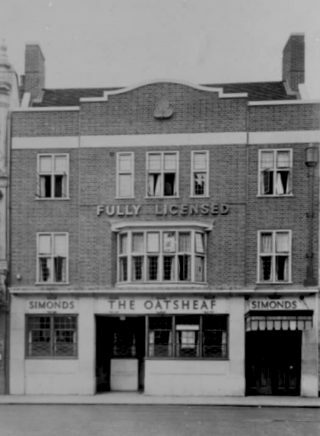 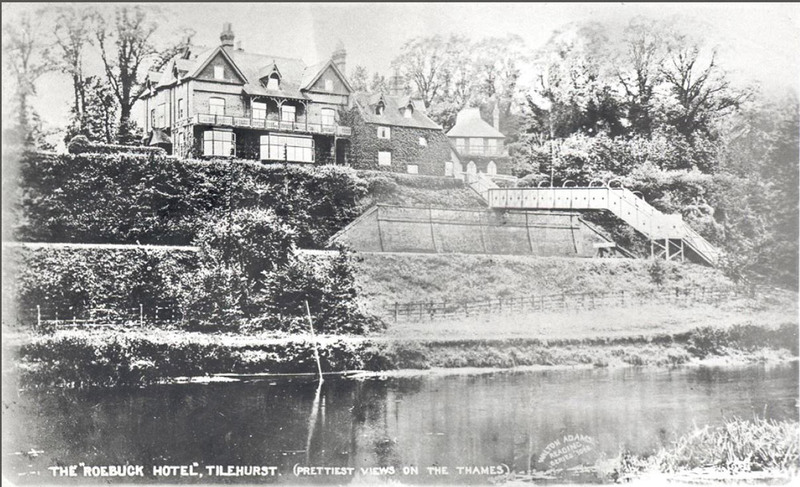 X – The Oatsheaf, where? 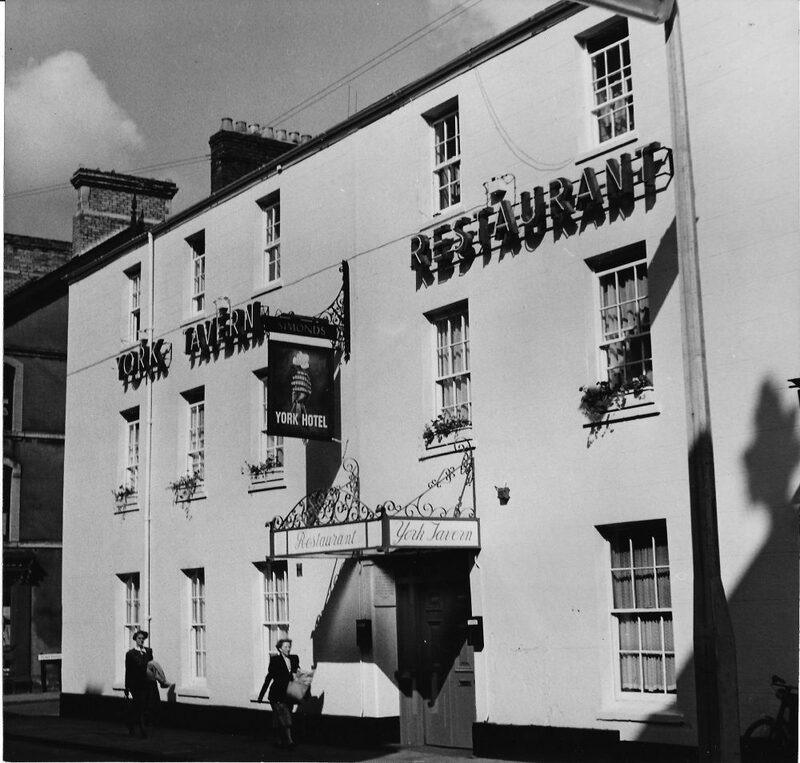 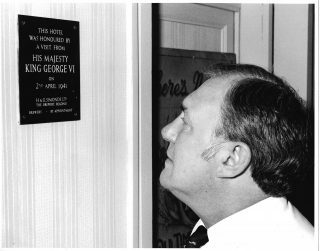 X – Prince of Wales, where? 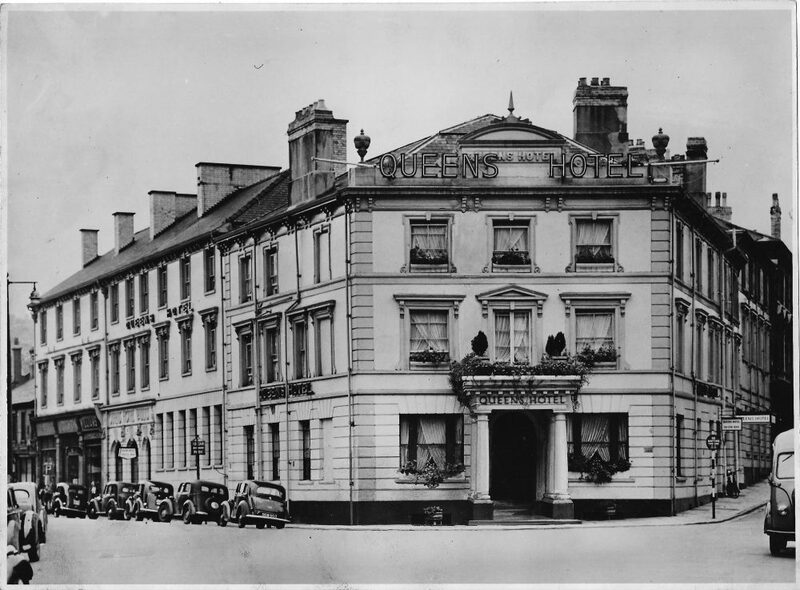 The business placed great importance on maintaining and refurbishing its estate. 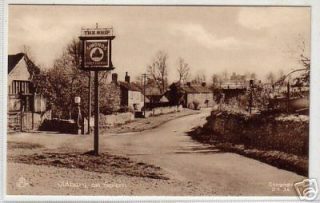 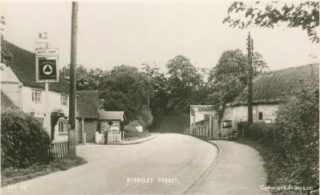 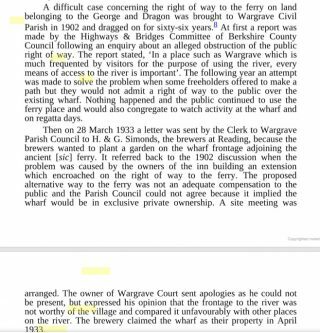 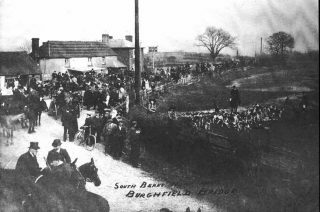 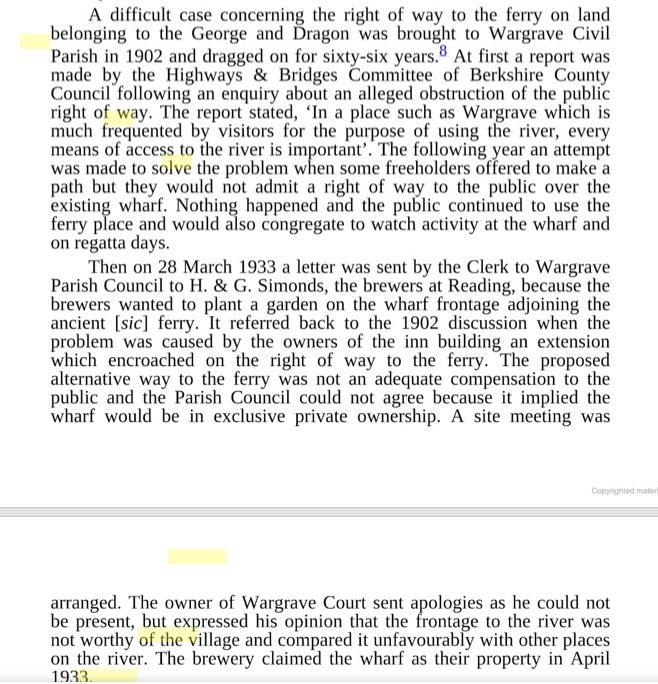 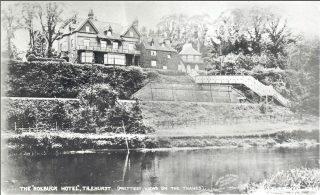 Here is a typical story, from The Castle Inn at Hurst, across the road from the family graveyard at St Nicholas Church.